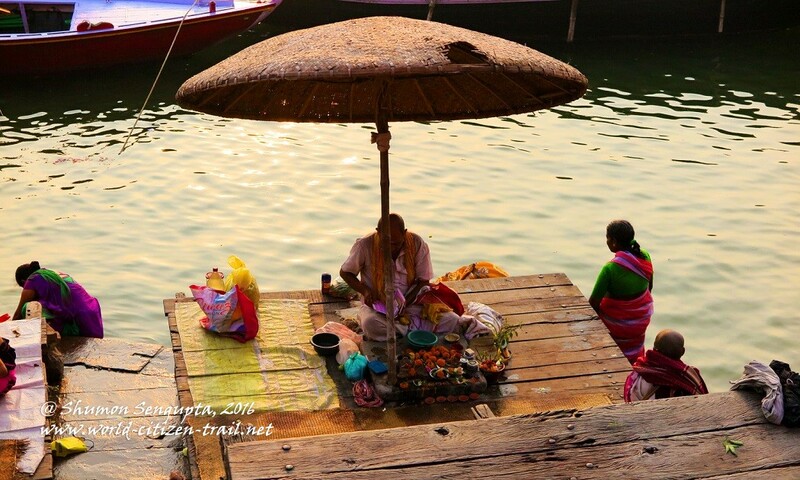 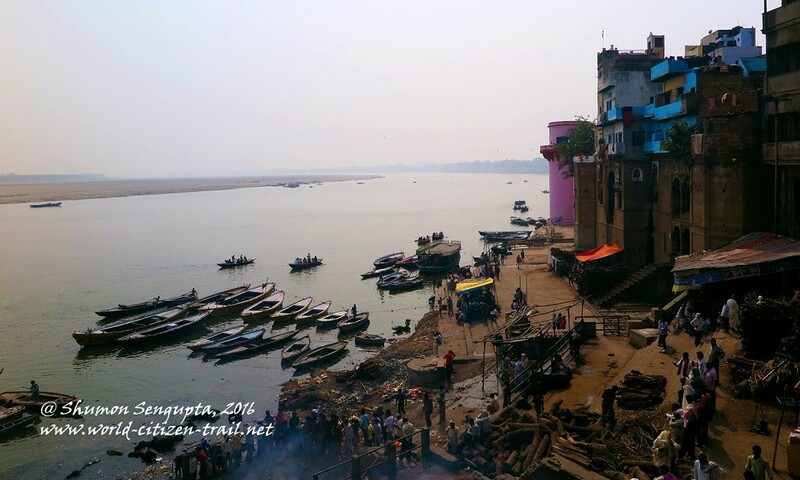 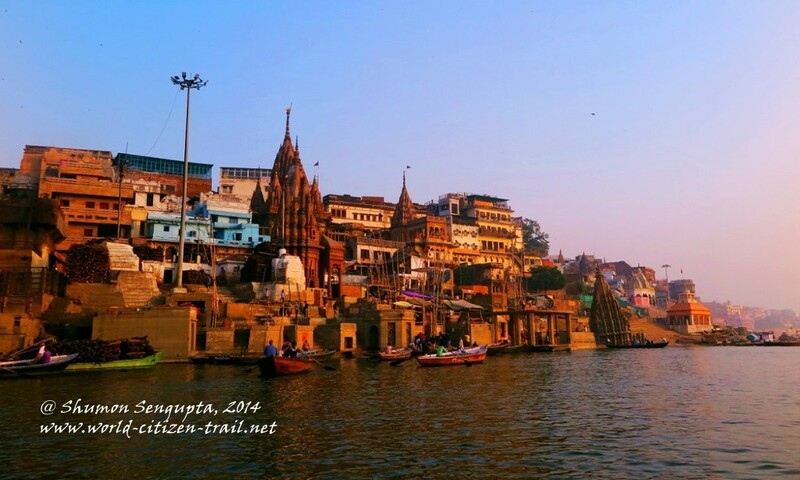 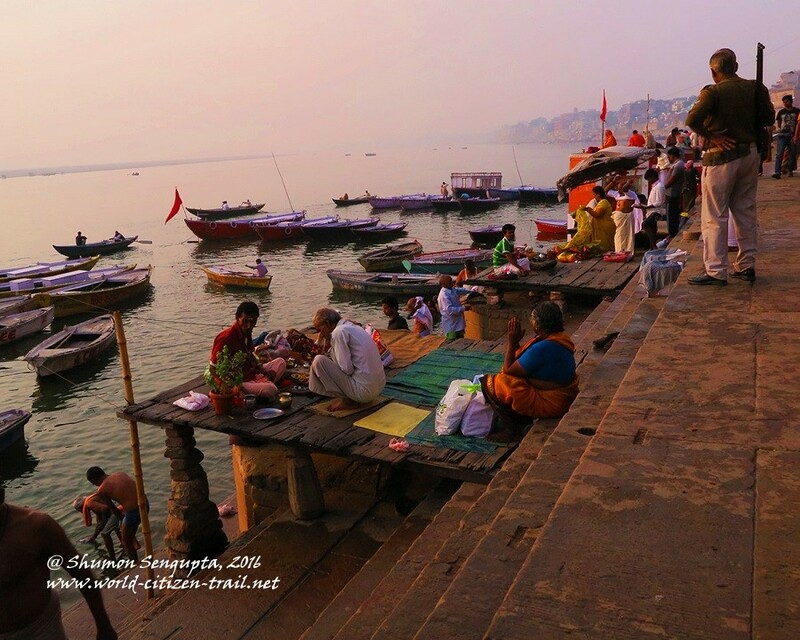 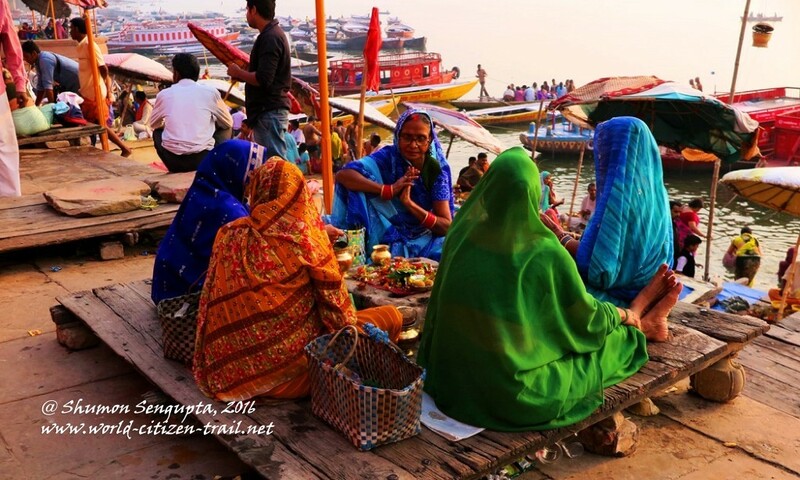 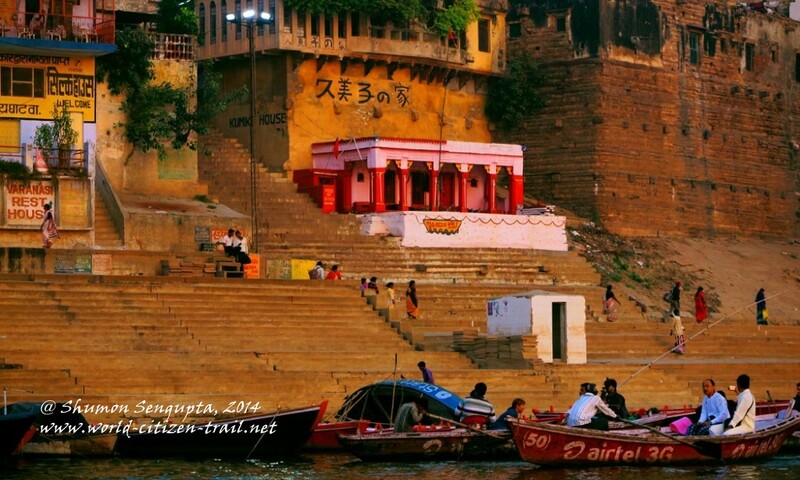 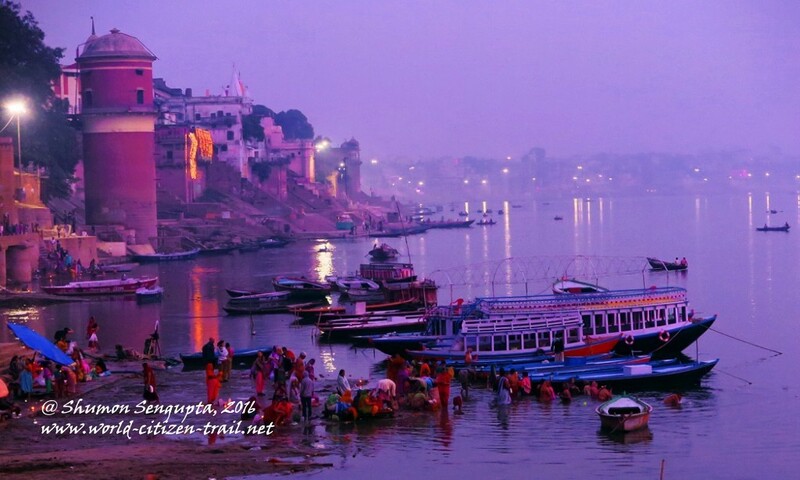 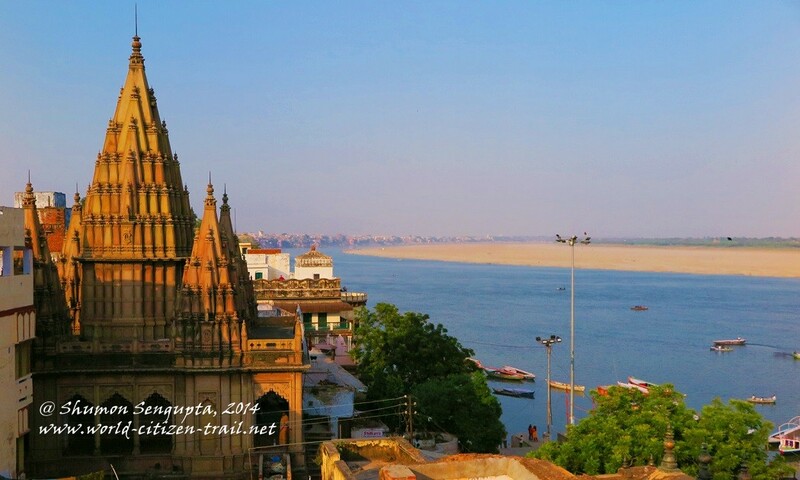 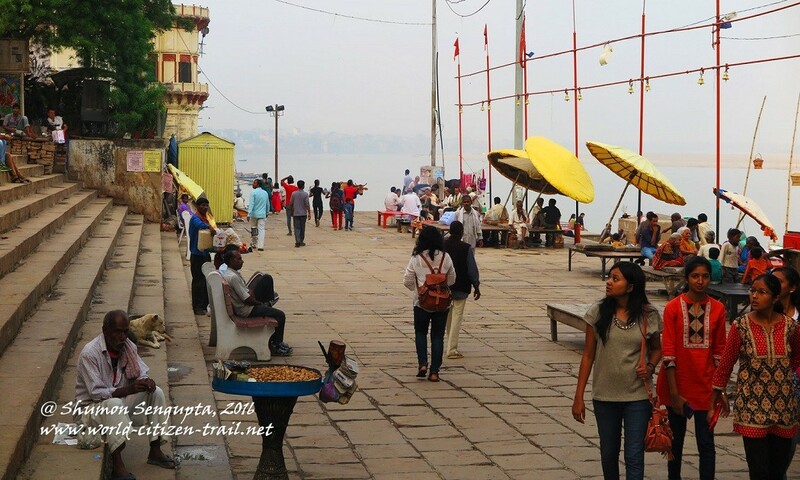 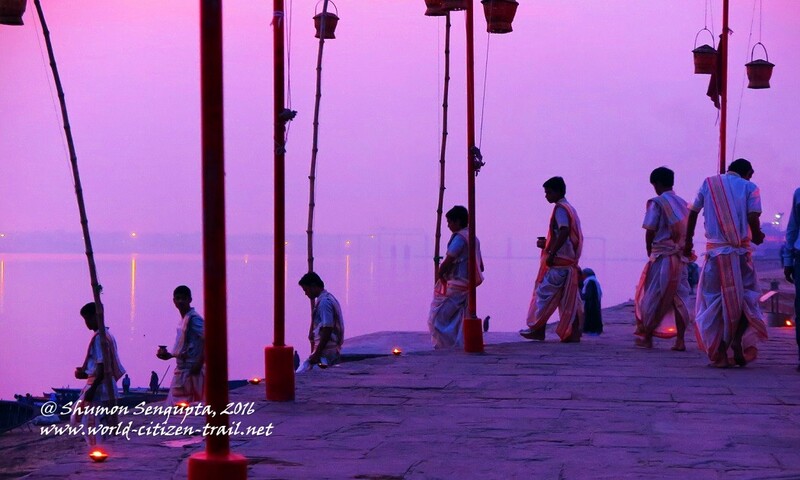 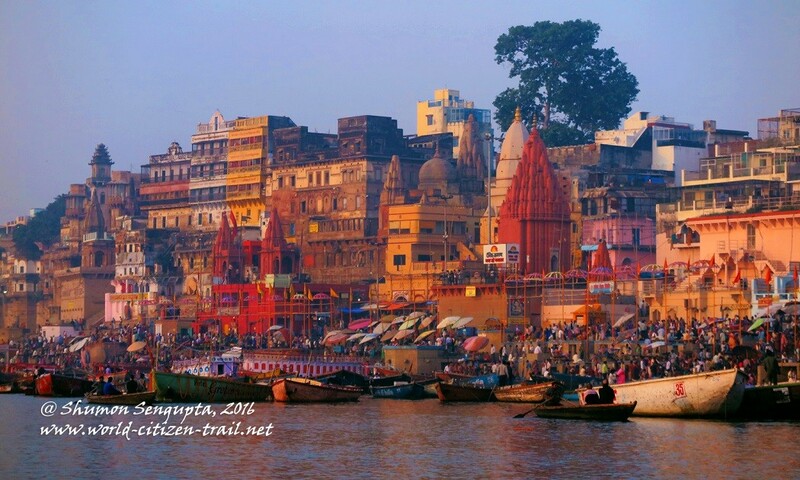 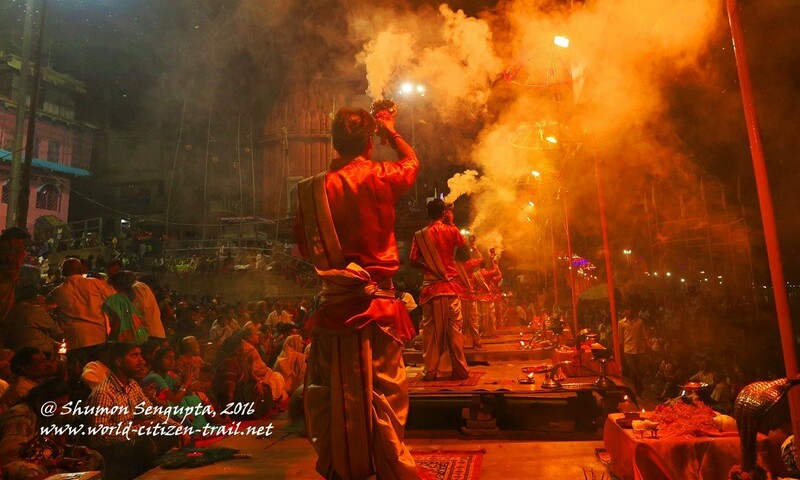 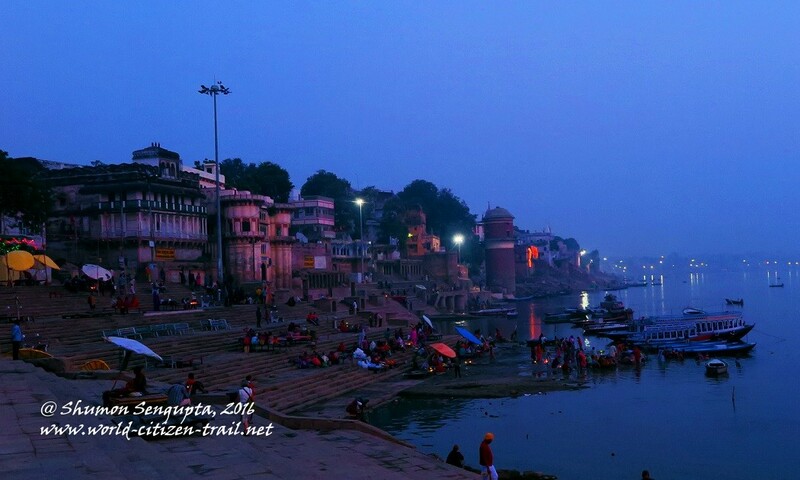 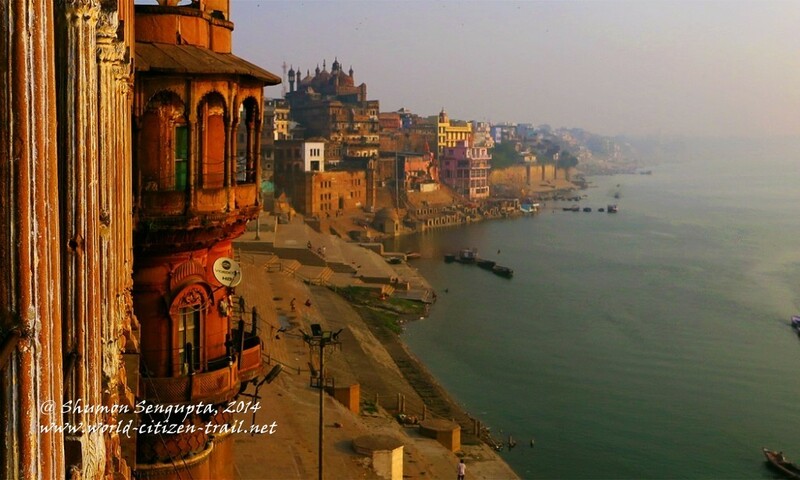 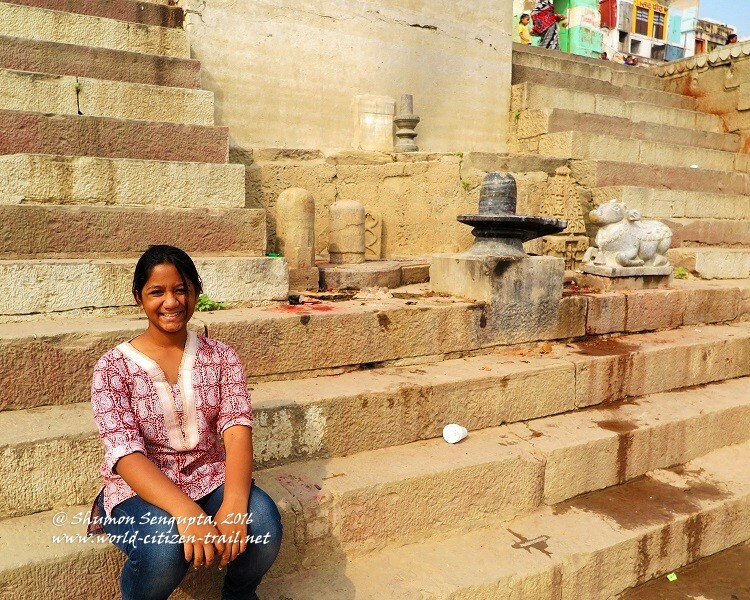 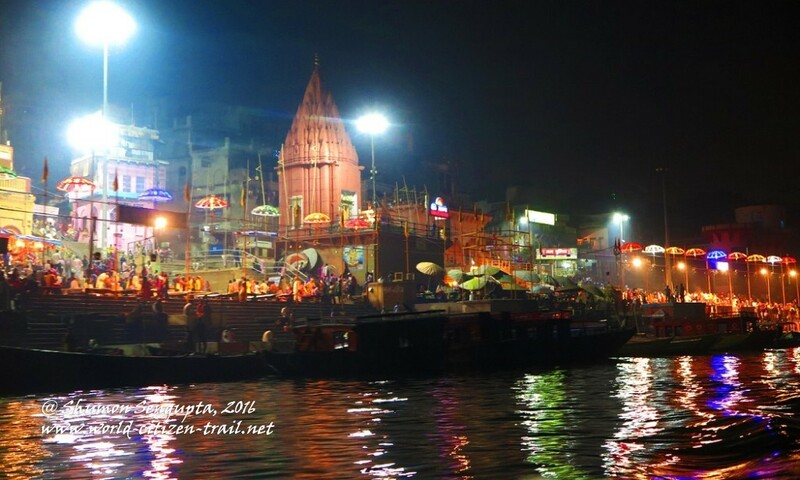 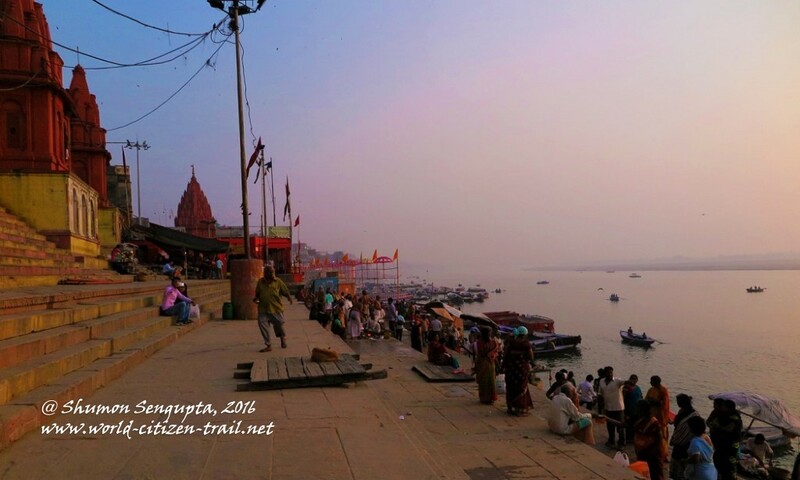 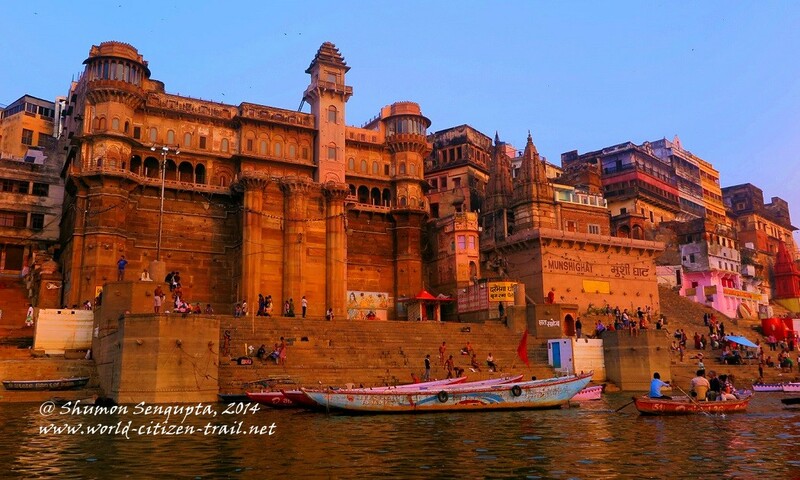 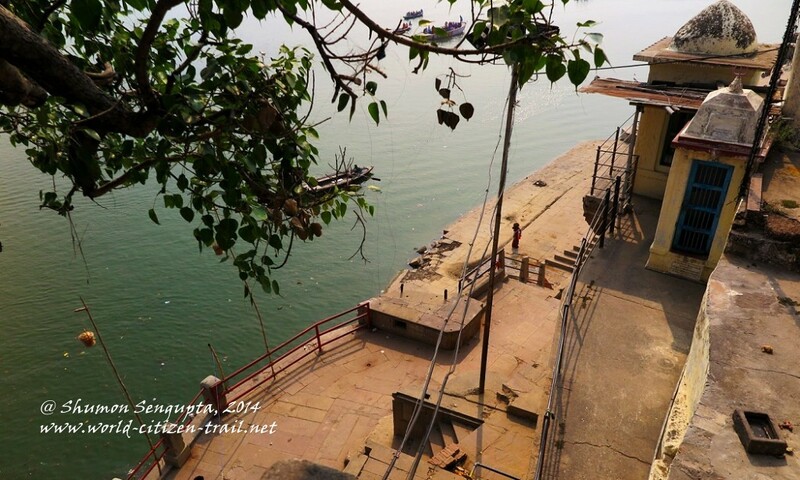 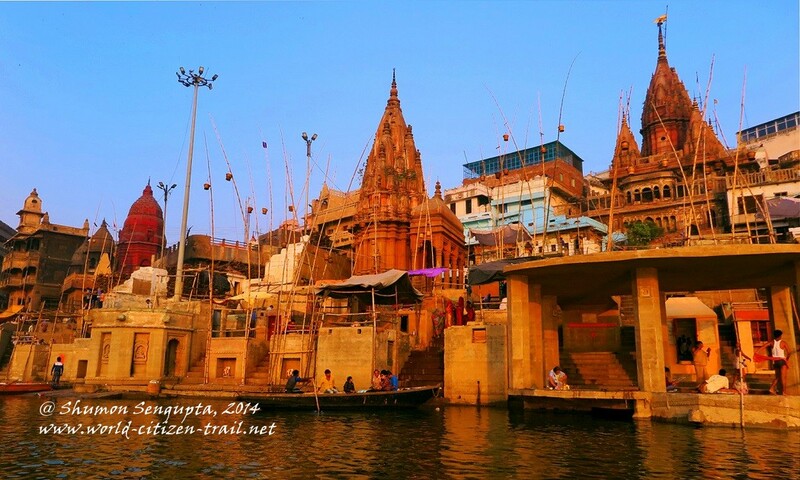 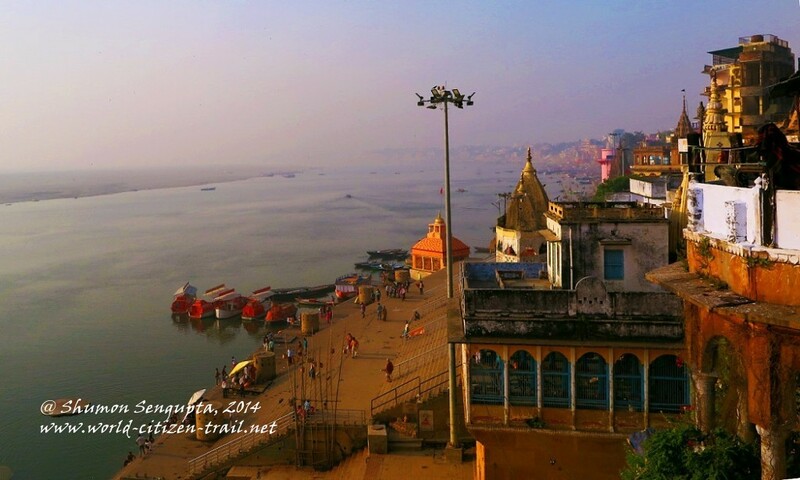 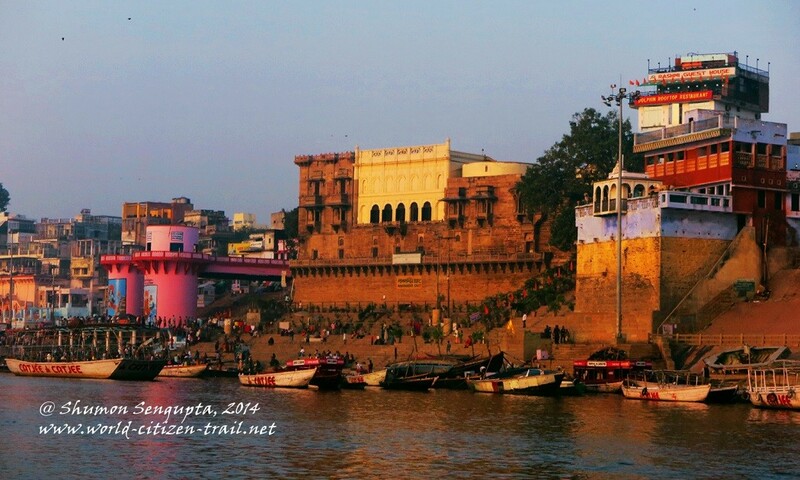 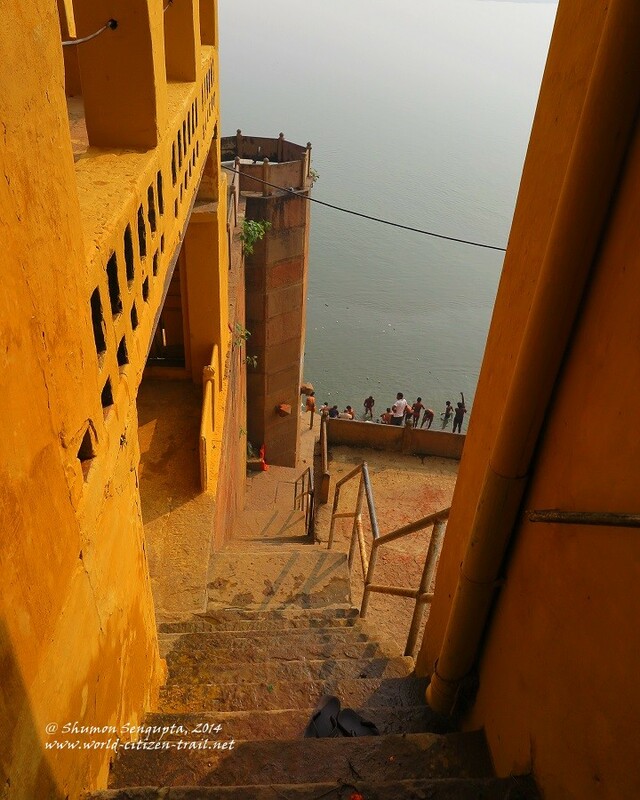 In a previous post, I had written on the iconic riverfront of the Ganges in Varanasi. 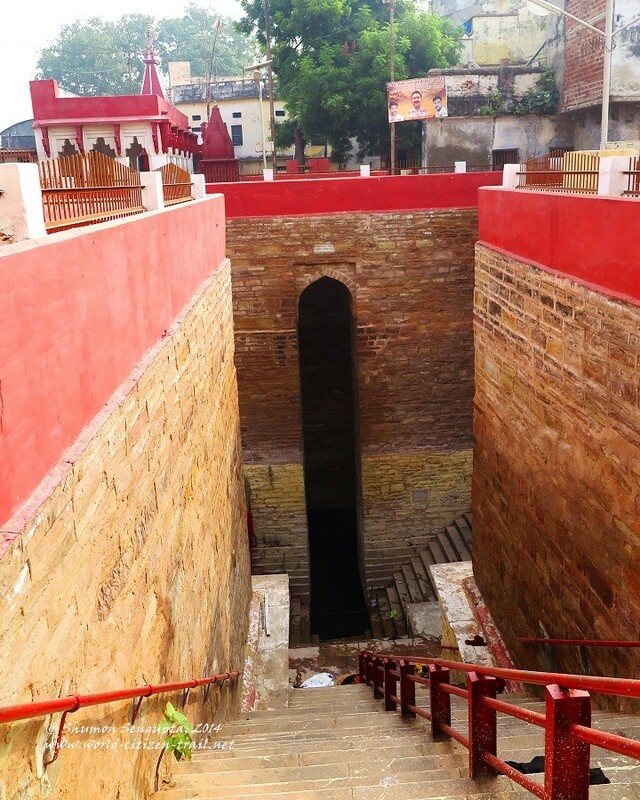 In this one, I invite you to join me on a journey into the ancient, labyrinthine area that lies just behind the riverfront – deep into the heart of a sacred geography that is as splendid and mystifying as it is surreal and challenging, and at times – even shocking and unsettling. 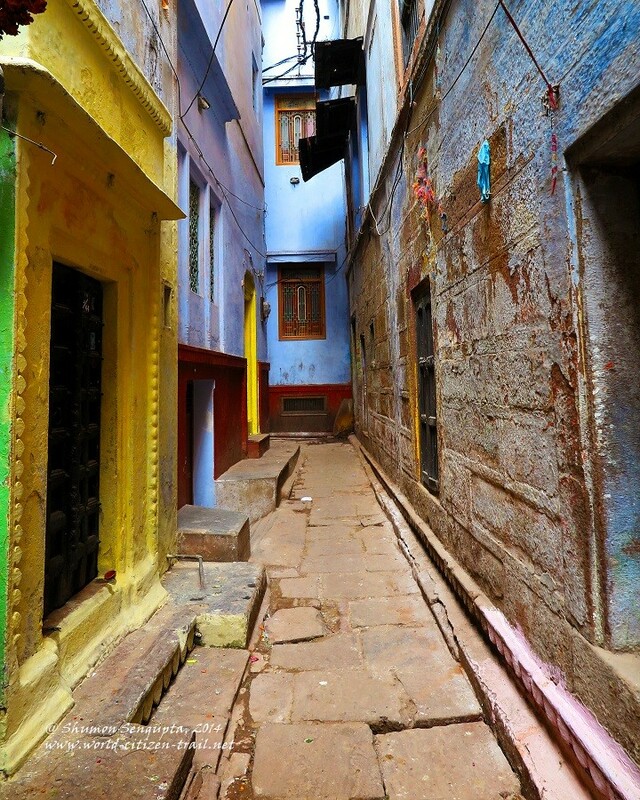 The area behind the riverfront is a historic built-up urban-scape consisting of a dense and chaotic maze of narrow streets and cobbled lanes and passages. 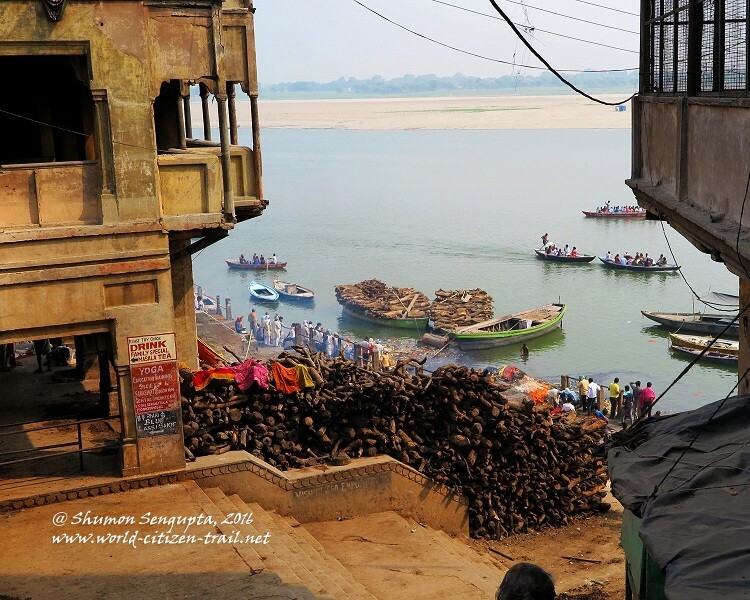 The layout of streets and lanes are organized in an organic way, following the topography of the steep and high riverbank. 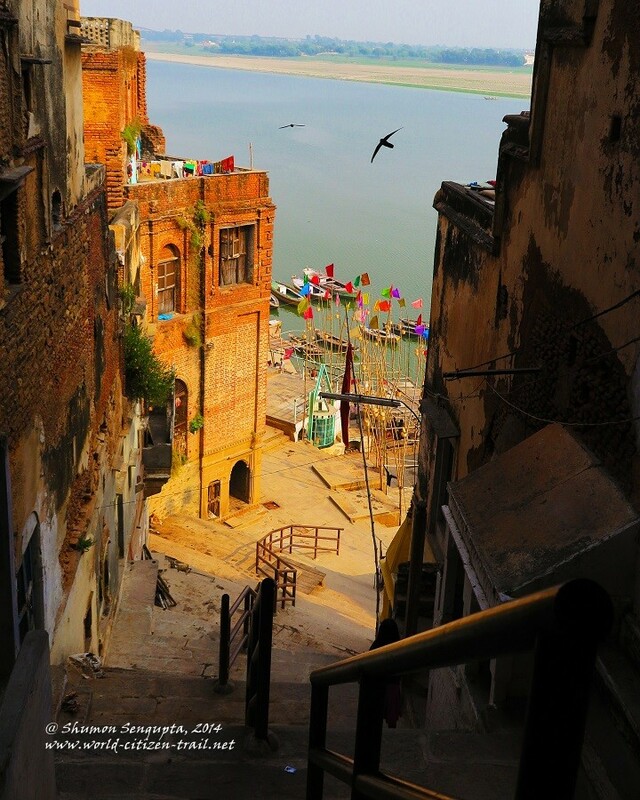 Streets running parallel to the riverfront are linked by perpendicular lanes and flights of masonry steps. 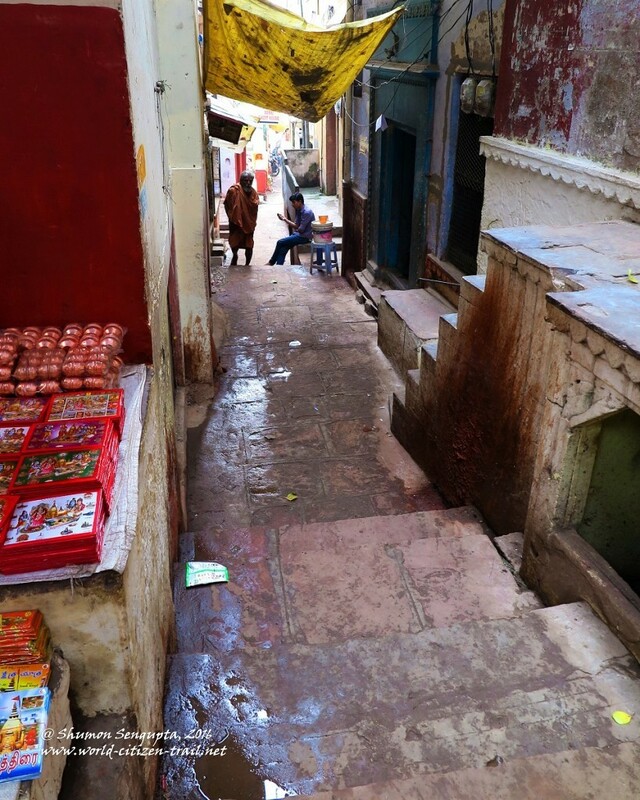 The narrower thoroughfares – a result of the leftover space between the built up structures – are just wide enough to allow pedestrian passage. 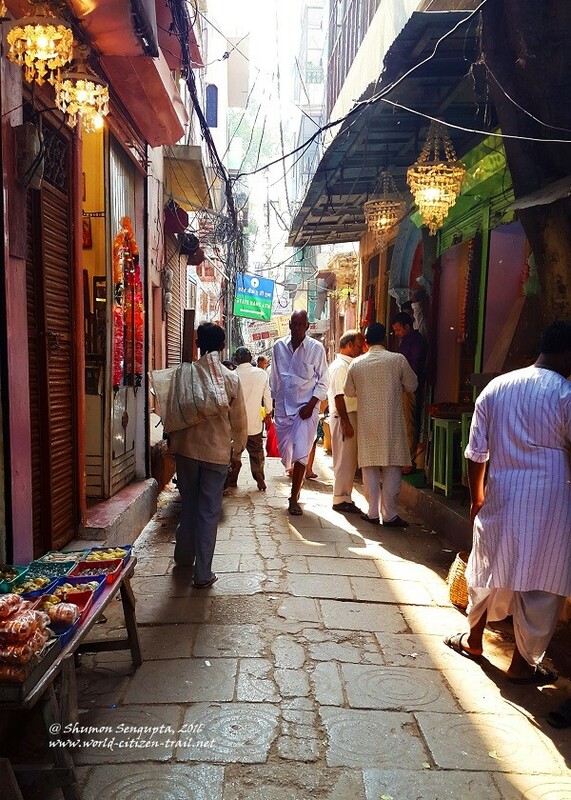 The medium size lanes allow the passage of two-wheelers and hand carts, and the wider lanes are barely wide enough for cycle-rickshaws and three-wheelers to pass through. 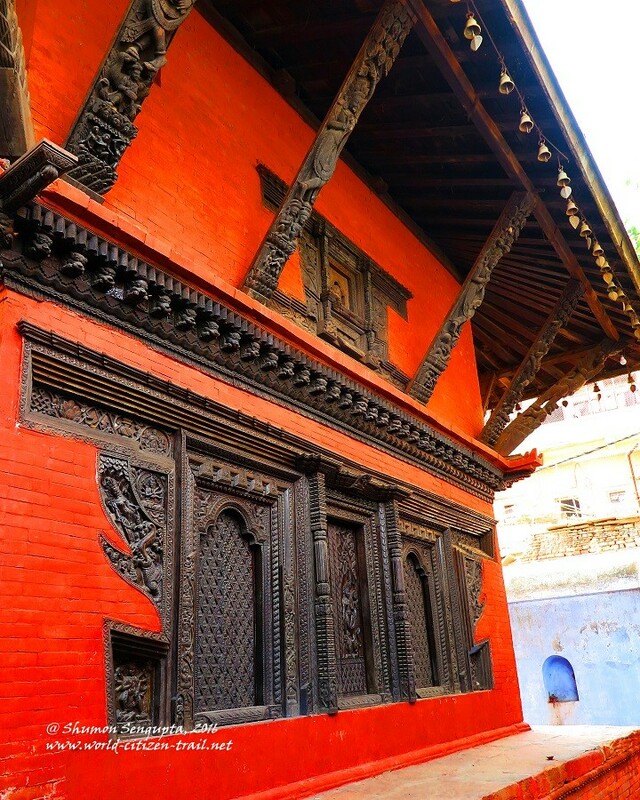 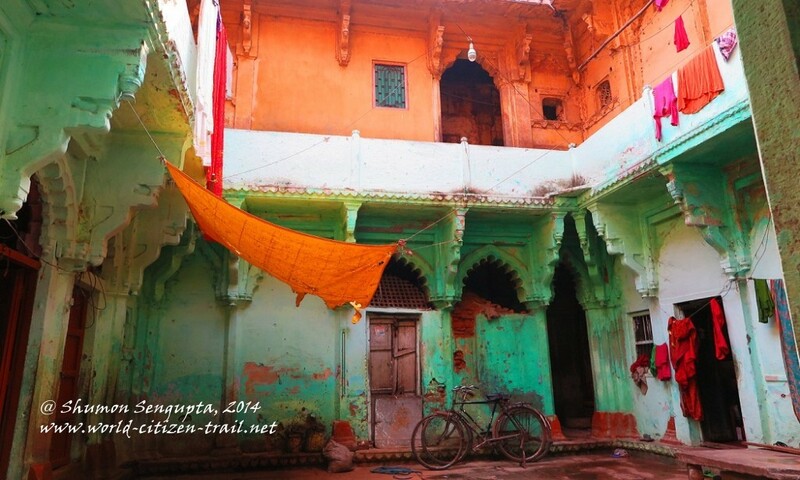 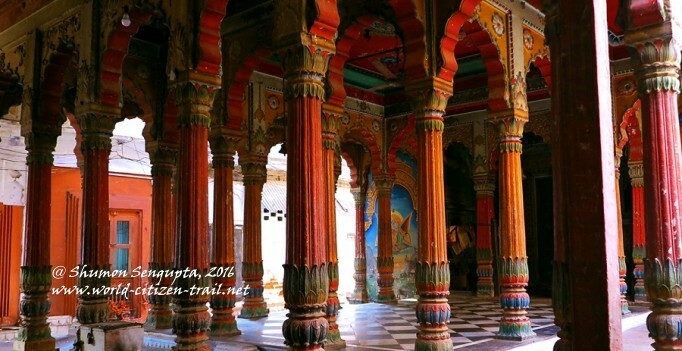 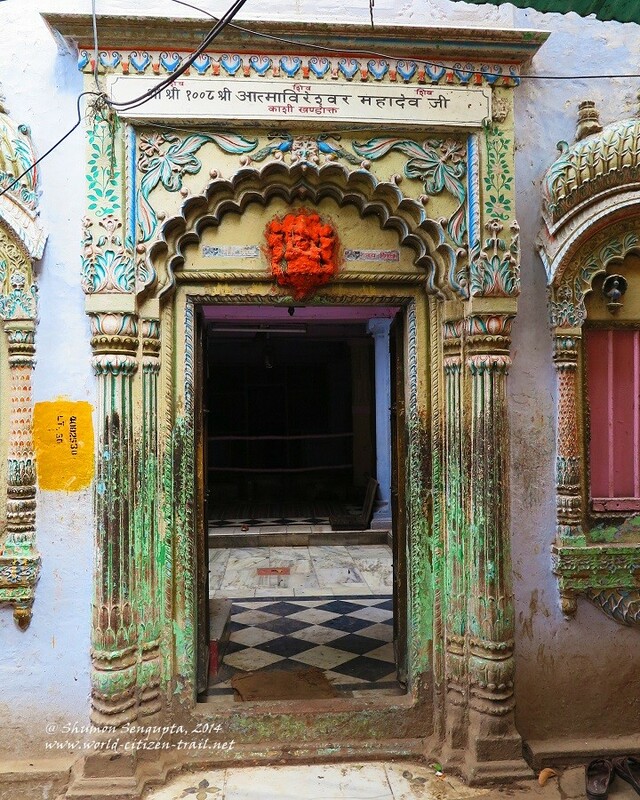 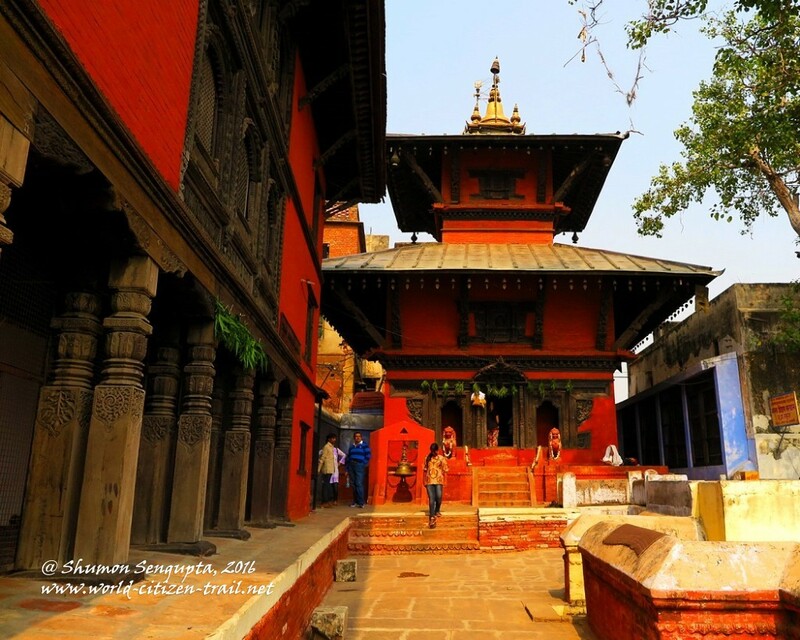 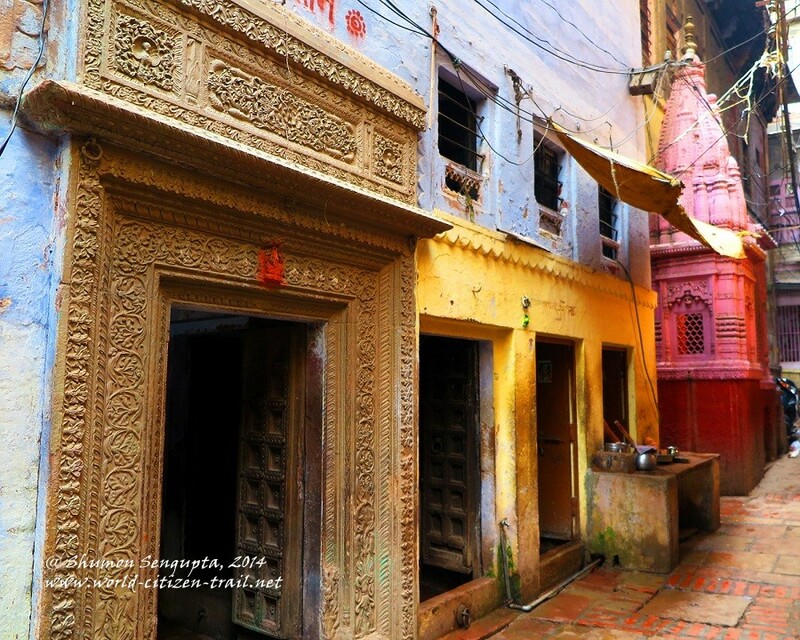 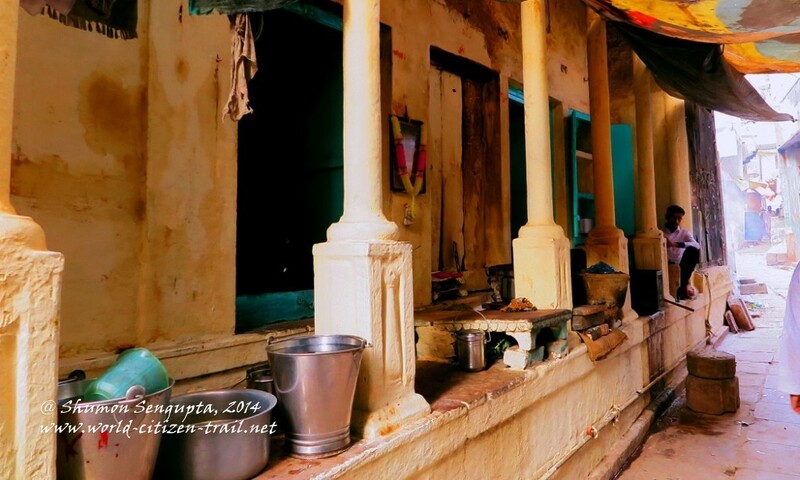 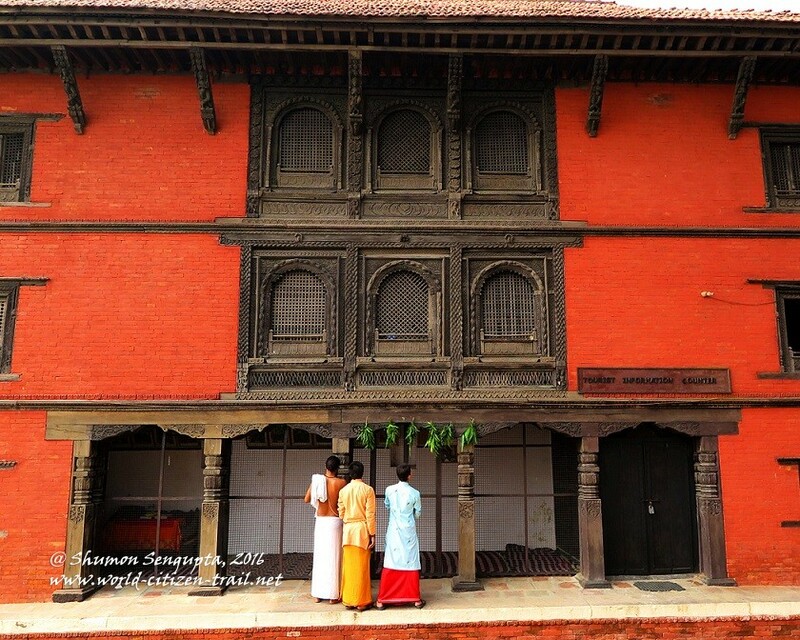 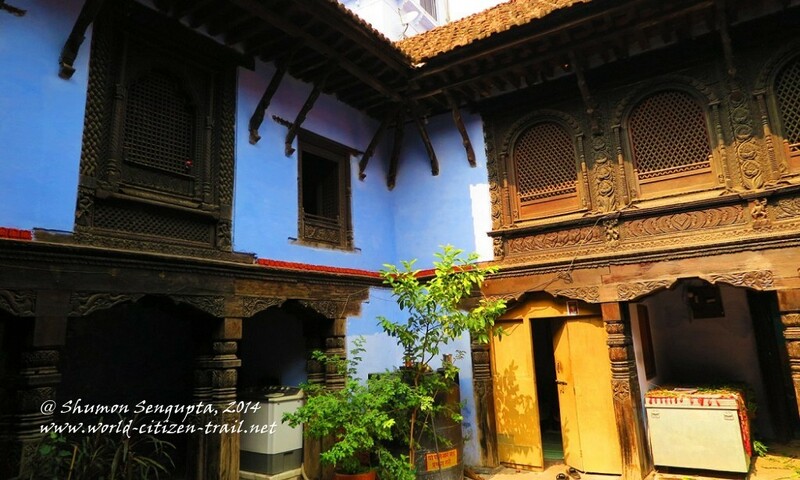 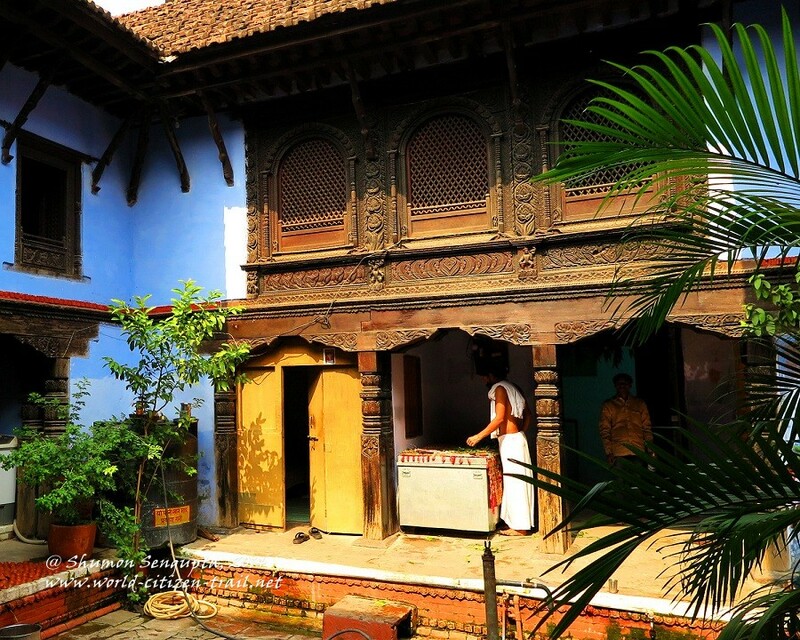 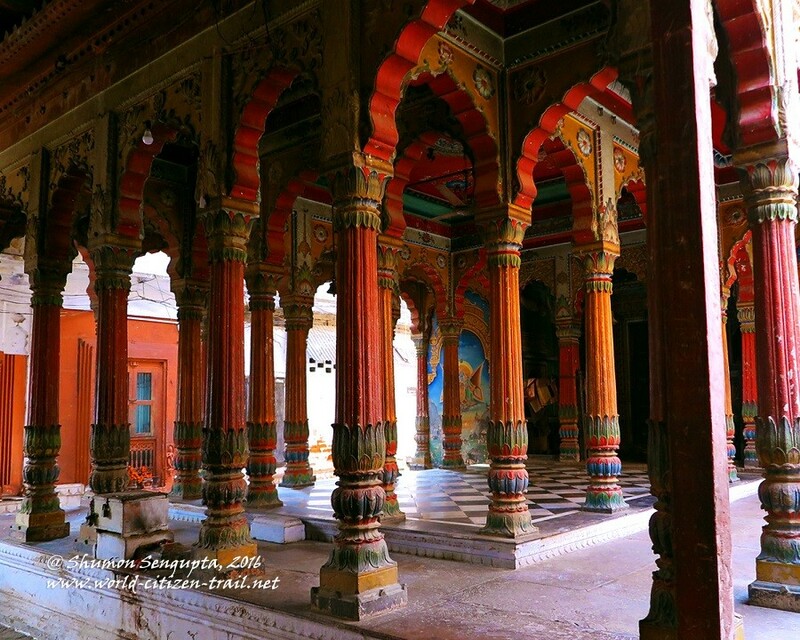 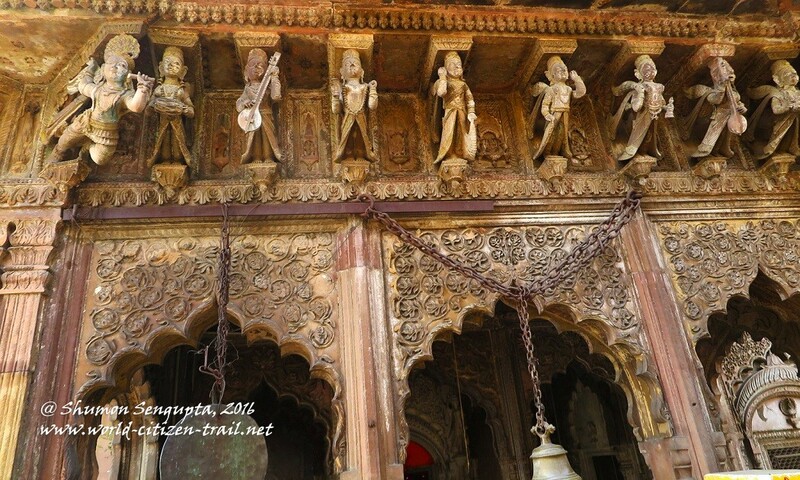 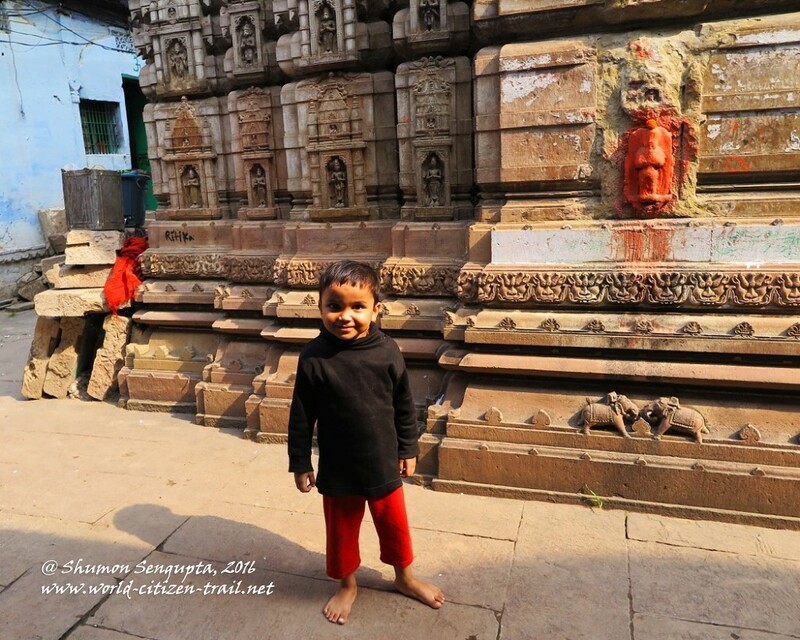 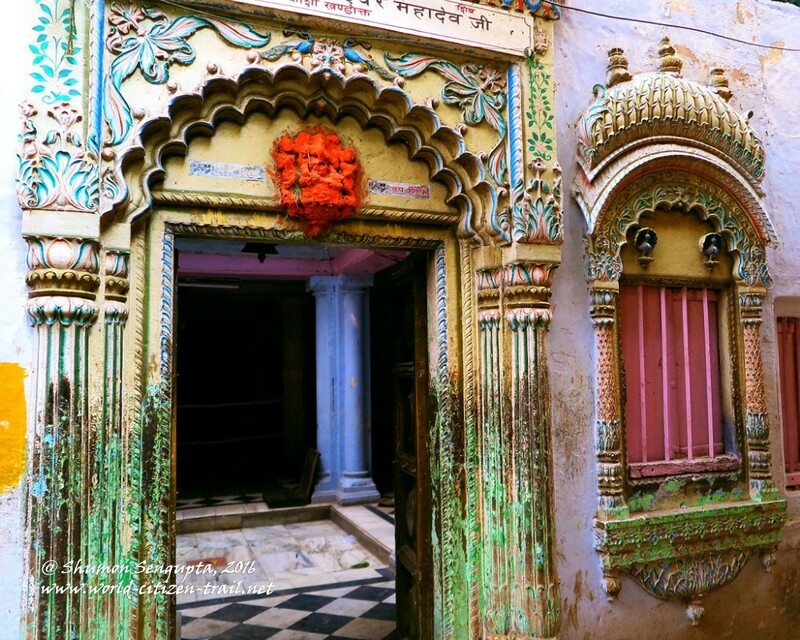 As you walk along these ancient, enclosed streets, lanes and passages, you will find yourself going past countless wayside shrines and temples, beautiful old houses and mansions (some abandoned, many encroached), spectacularly decorated doorways and markets. 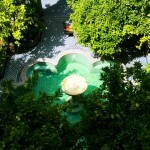 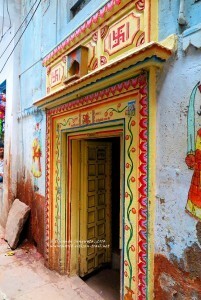 Smaller temples and shrines are often located at the angle of two streets, and private shrines are generally situated in the shadows of lofty mansions. 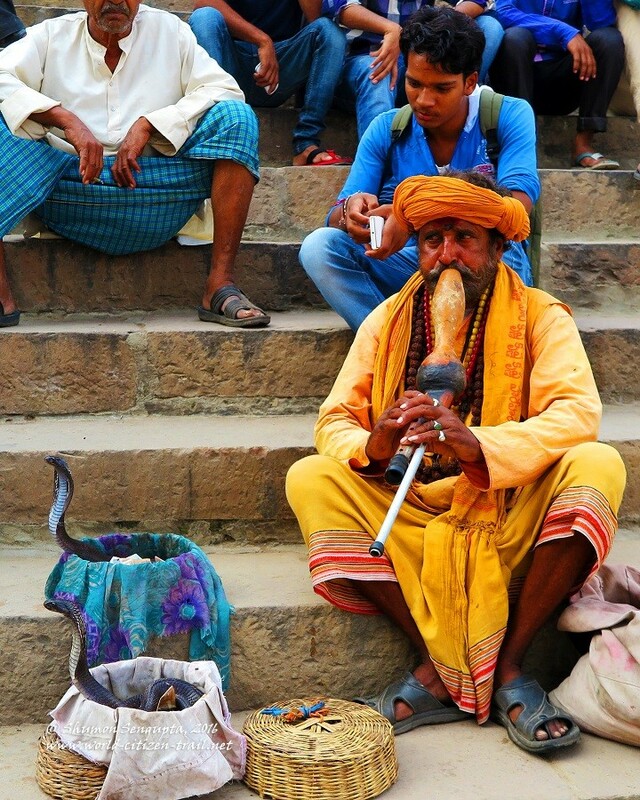 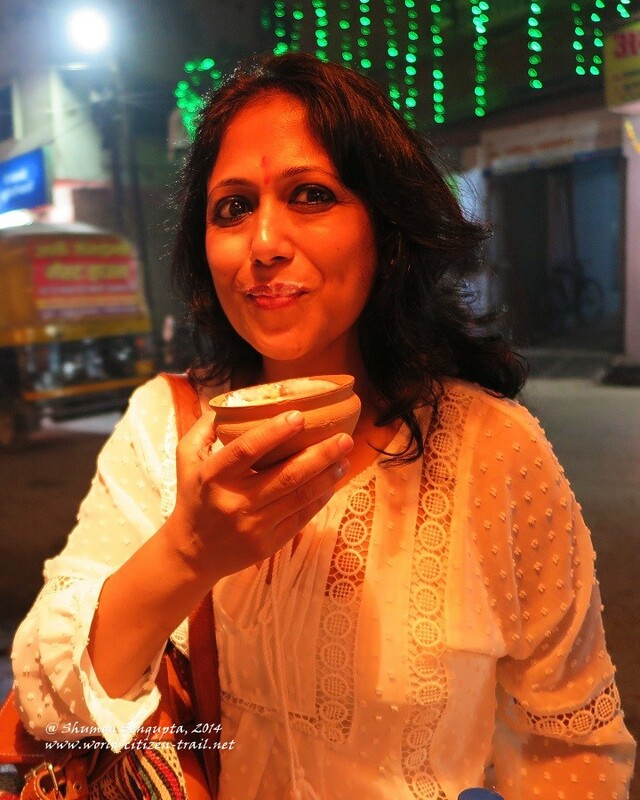 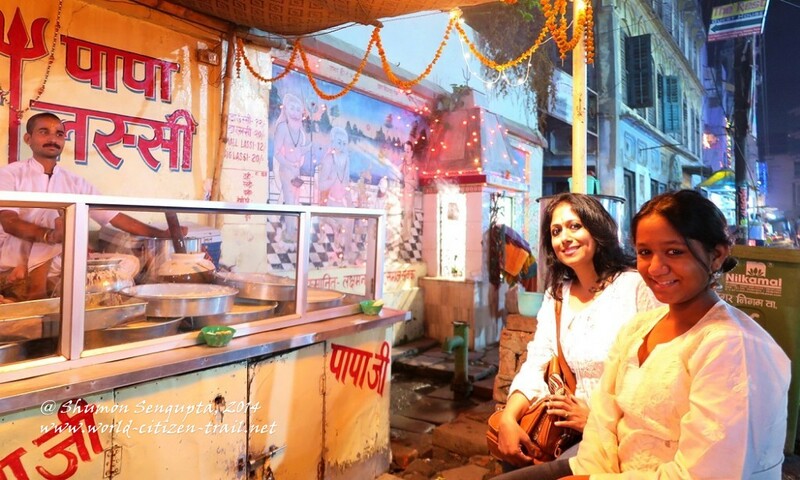 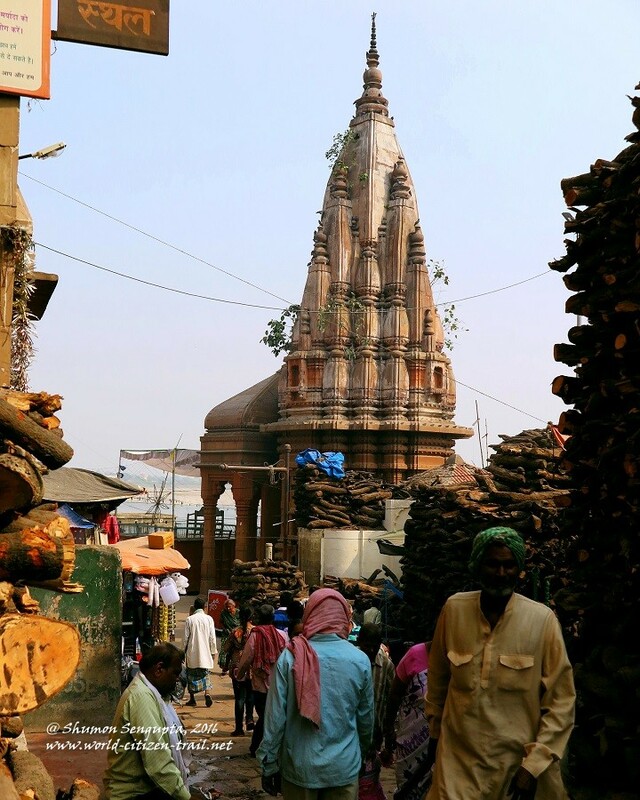 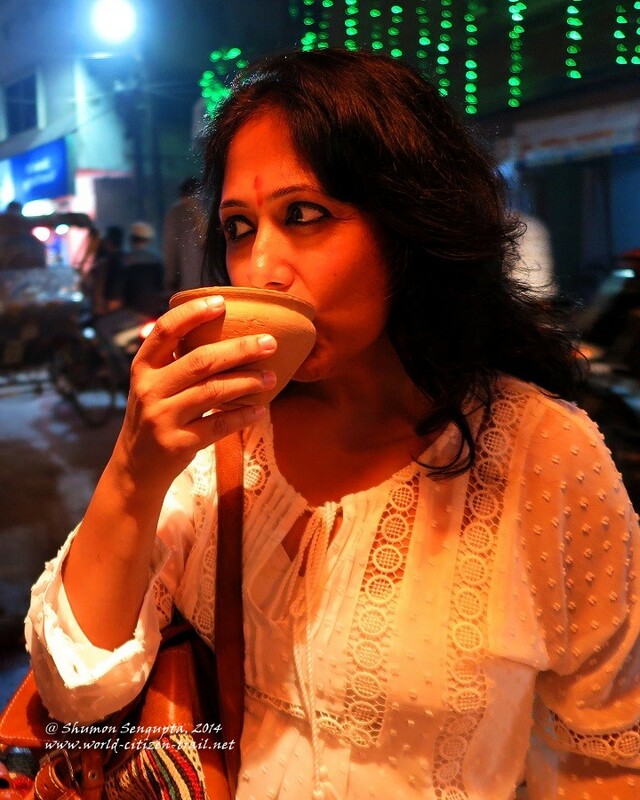 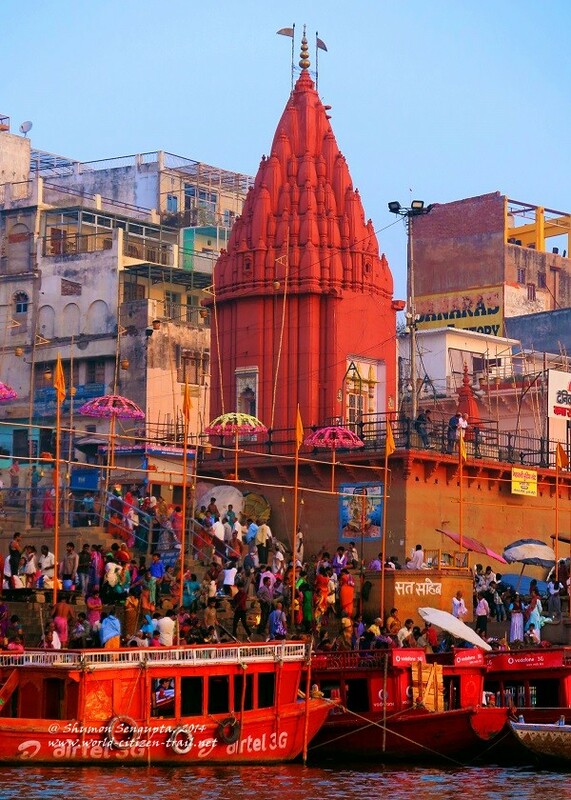 Apart from its fabled bazaars, Varanasi is also famous for its legendary cuisine, particularly its unique roadside food stalls selling a wide range of vegetarian snacks, including the famous yogurt drink called lassi. 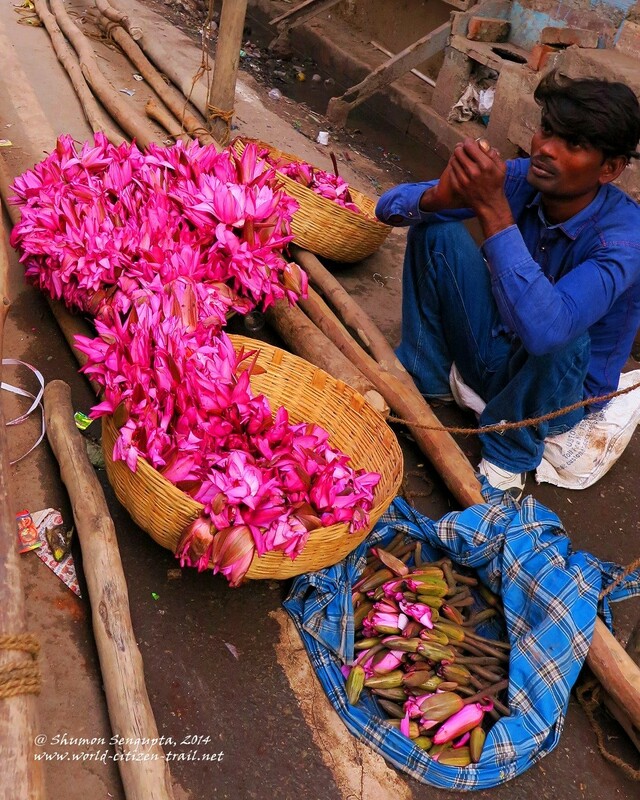 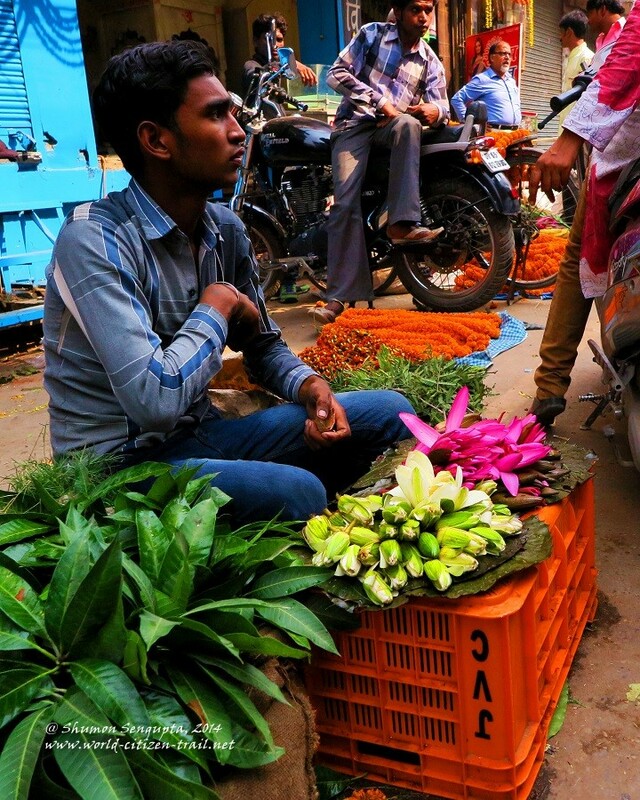 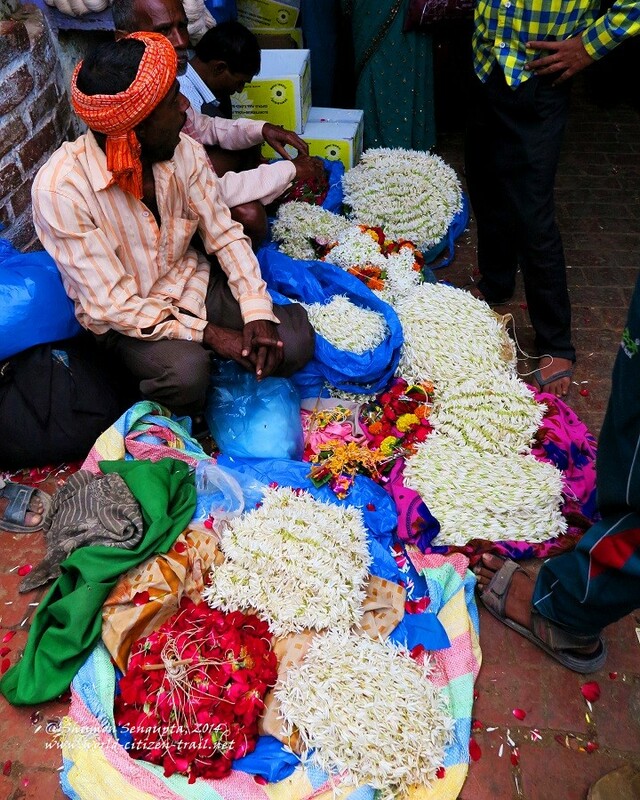 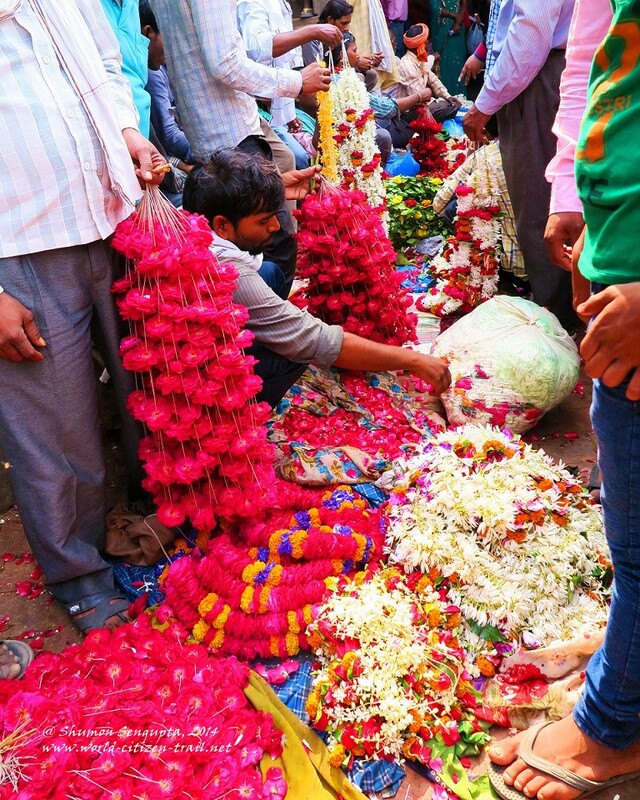 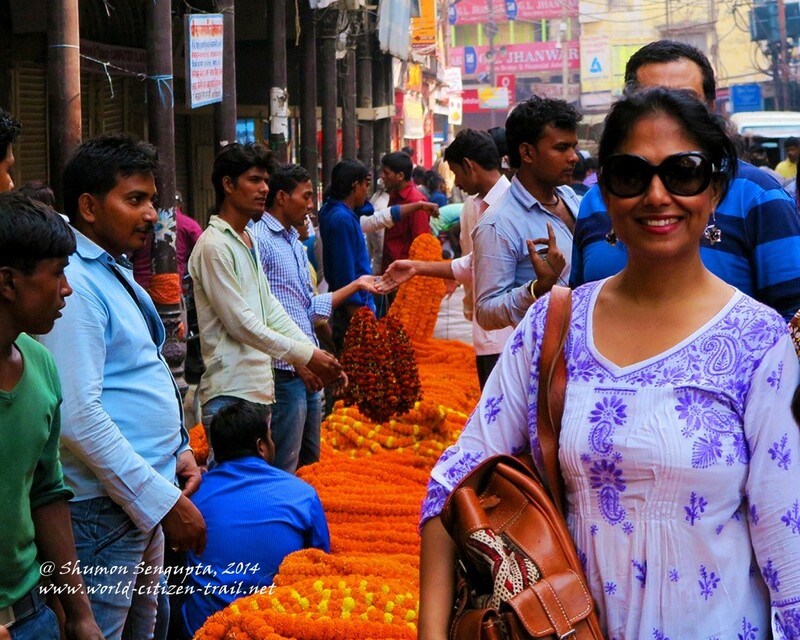 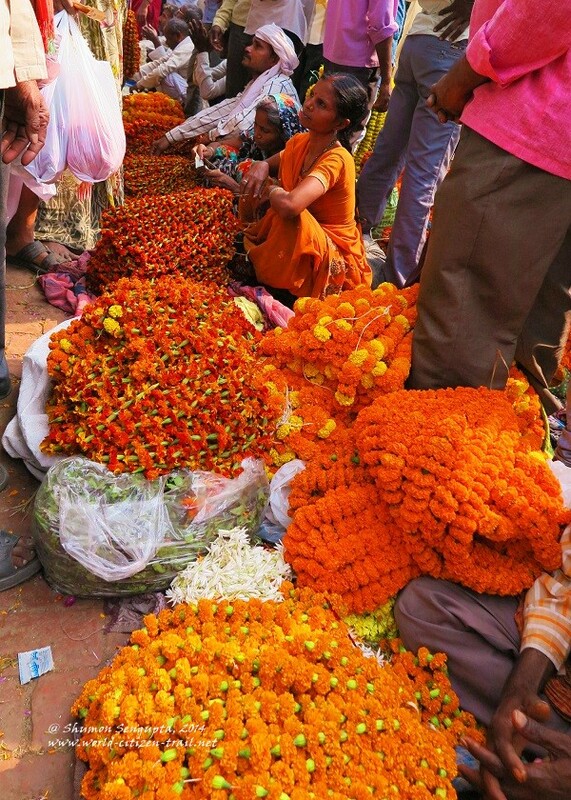 The busy, crowded and chaotic flower market, not far from the Kashi Vishwanath temple, is a riot of colors and worth a visit, if you can put up with the jostling crowd of sellers and buyers. 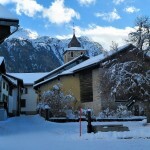 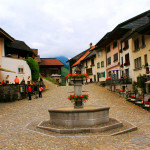 Most houses and mansions are built on high masonry foundations, with streets laid out at a level considerably below the level of the ground floors. 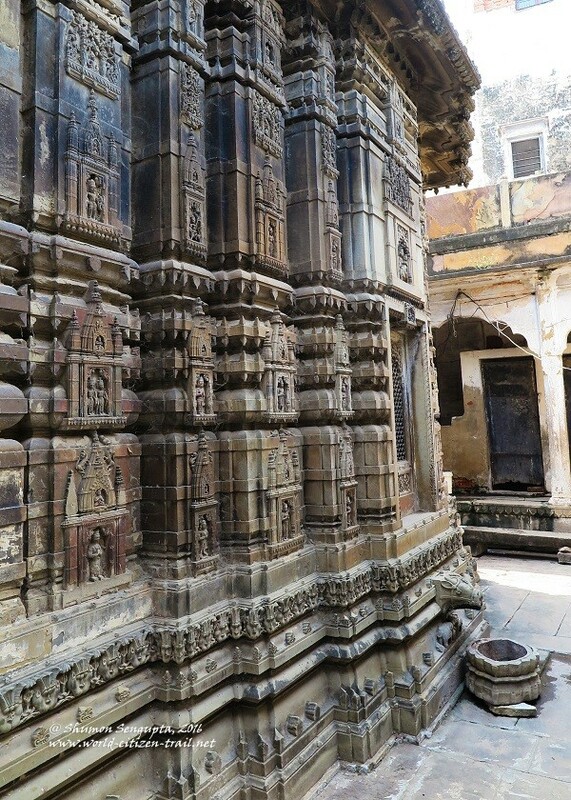 The high and exposed foundations are embellished with simple and repetitive patterns, carved on stone. 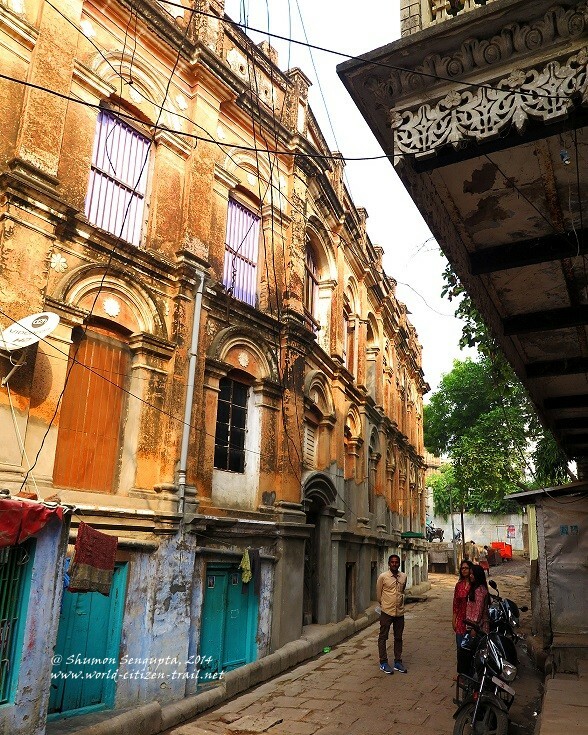 On the ground floor, just above the foundation, houses have arched or colonnaded verandas in the front, many of which have been converted into rows of small street-side shops. 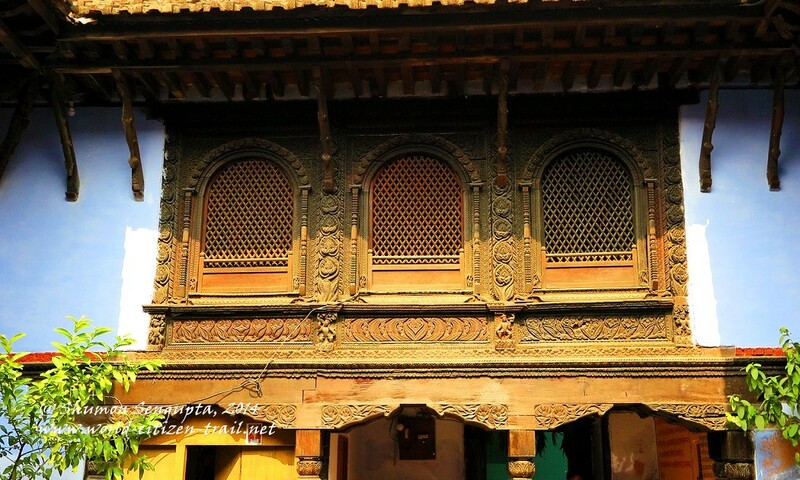 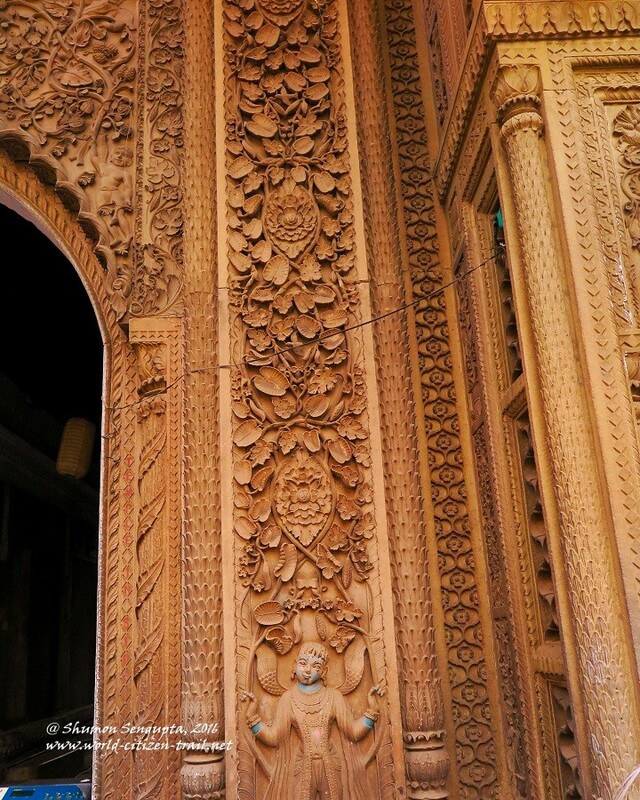 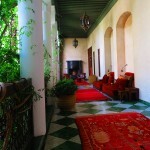 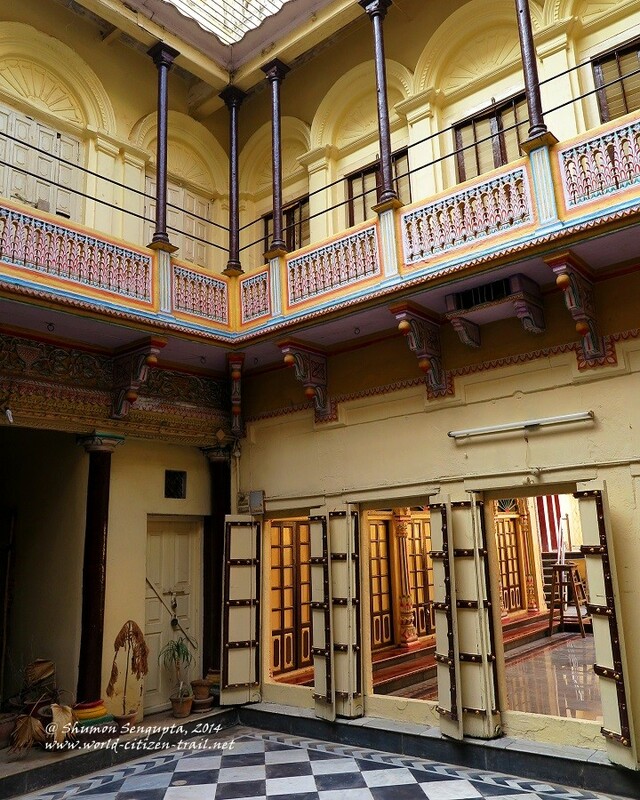 Most mansions and houses have hanging verandahs, balconies and galleries, often embellished in bas-relief, stucco and murals. 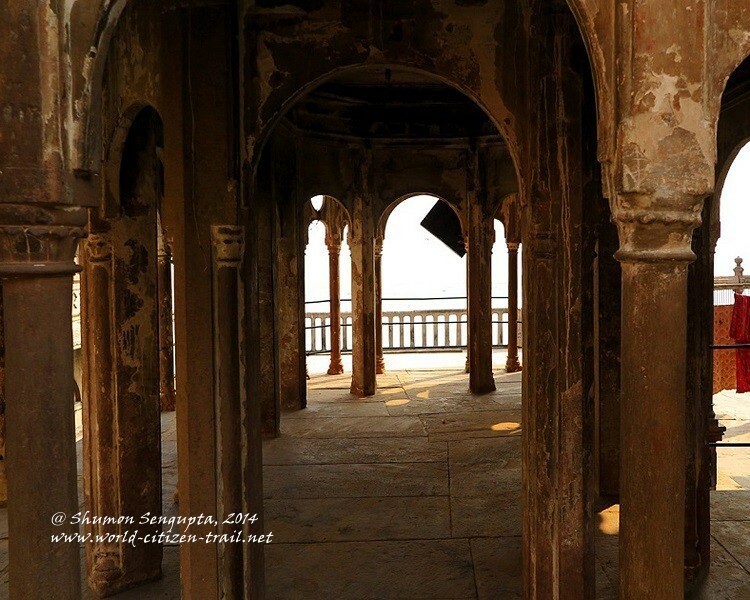 Everything seems to be ancient, grand and beautiful, albeit decayed and worn out with the passage of time, and intensely atmospheric. 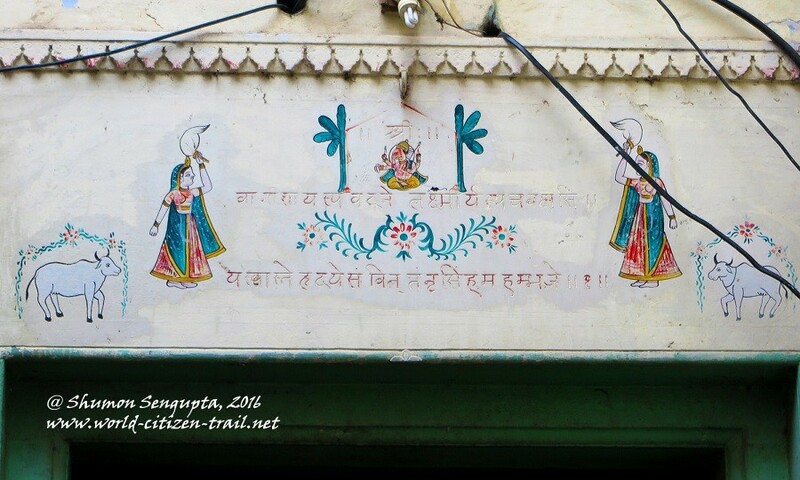 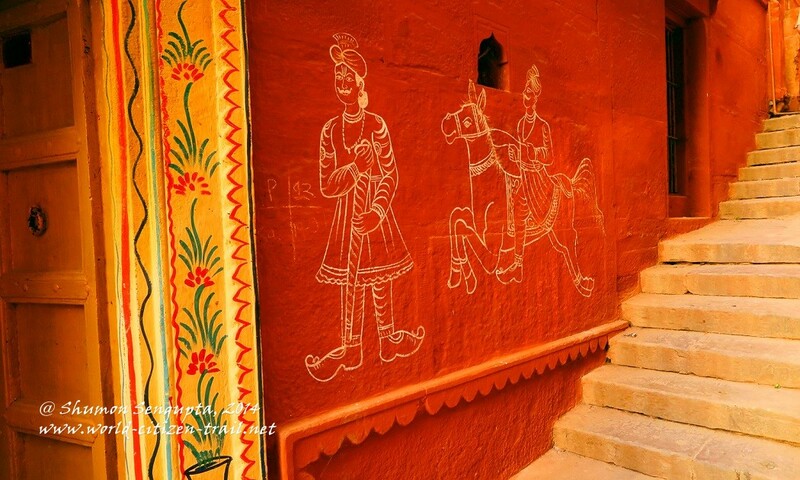 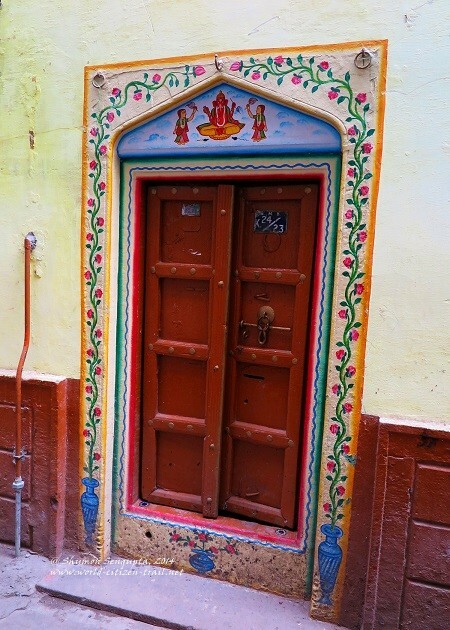 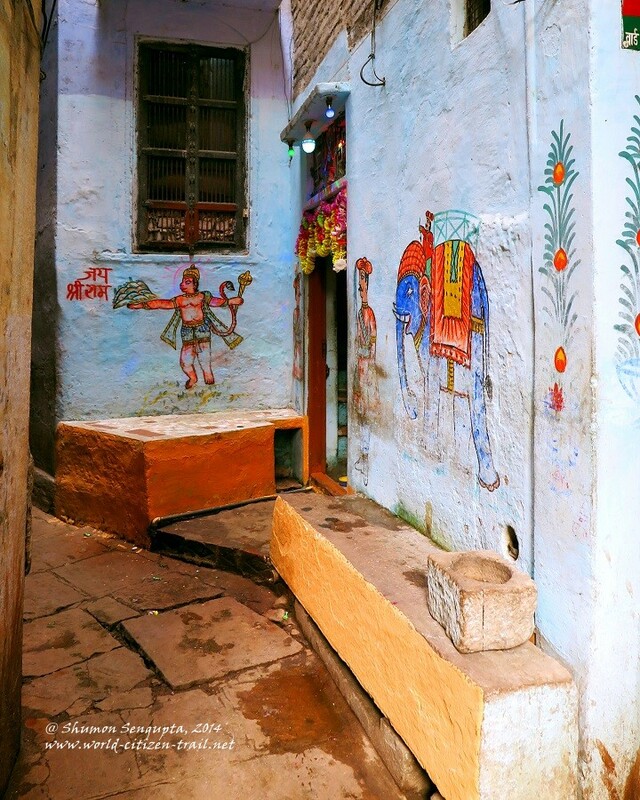 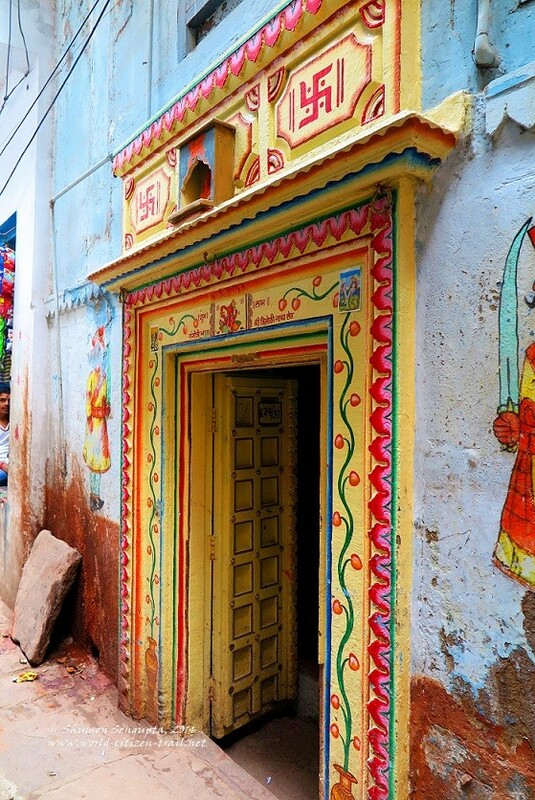 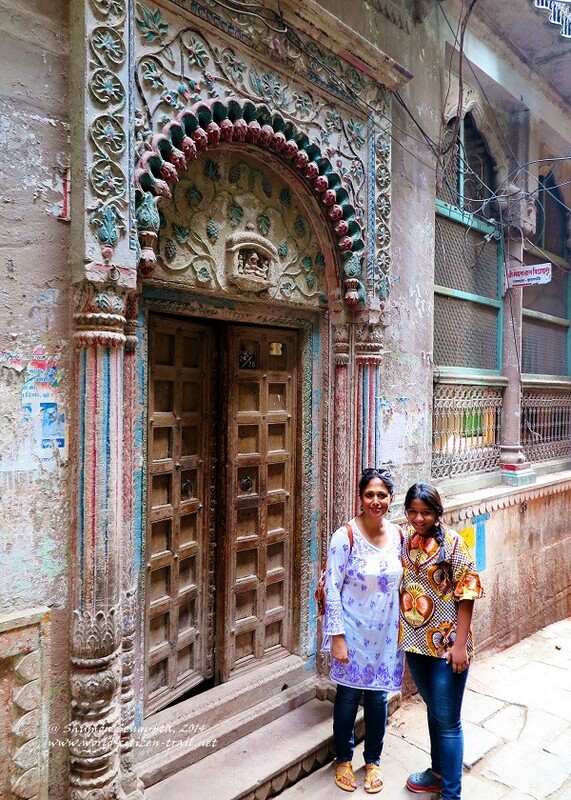 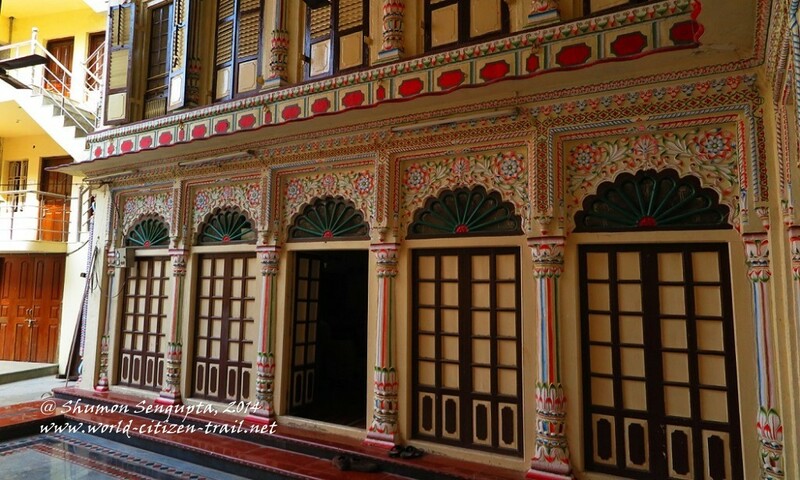 Walls and facades of many buildings in Varanasi are decorated with vibrant murals executed by local artists, in a folk painting style. 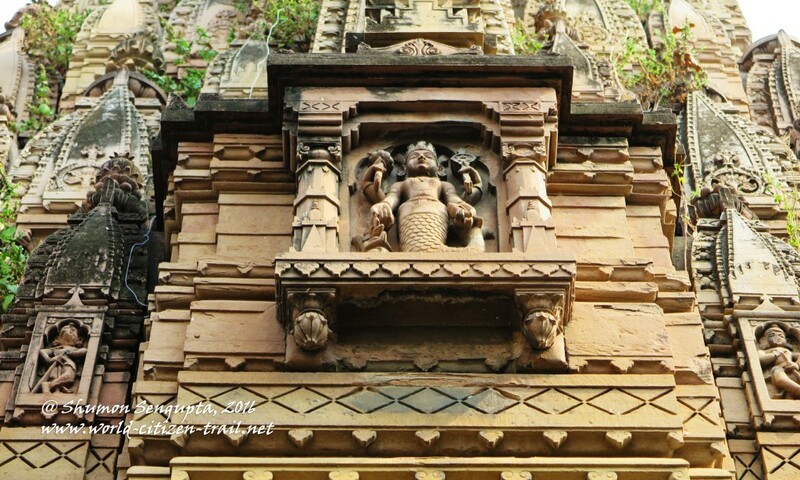 Images include that of gods, goddesses and demigods, narrative art depicting events from Hindu myths and legends and abstract decorative motifs. 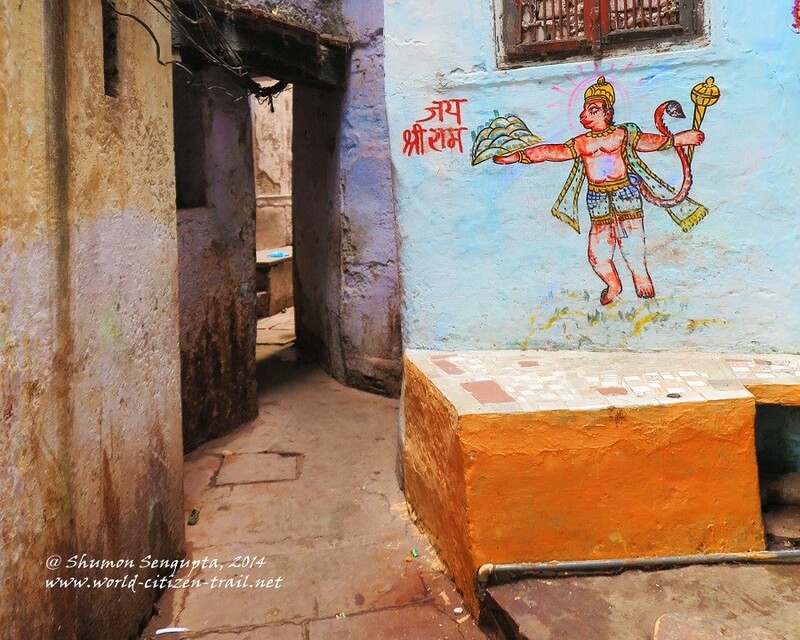 On pavements, corners, niches and wayside shrines, you will find old, worn out, vaguely anthropomorphic stones and images of deities smeared with scarlet and orange vermilion paste, sprinkled with turmeric powder and strewn with flowers and other ritual offerings. On the thresholds, over the doorways of temples and houses are images of the elephant headed Hindu god, Ganesha, the remover of obstacles, executed in bas-relief or as a mural painting. 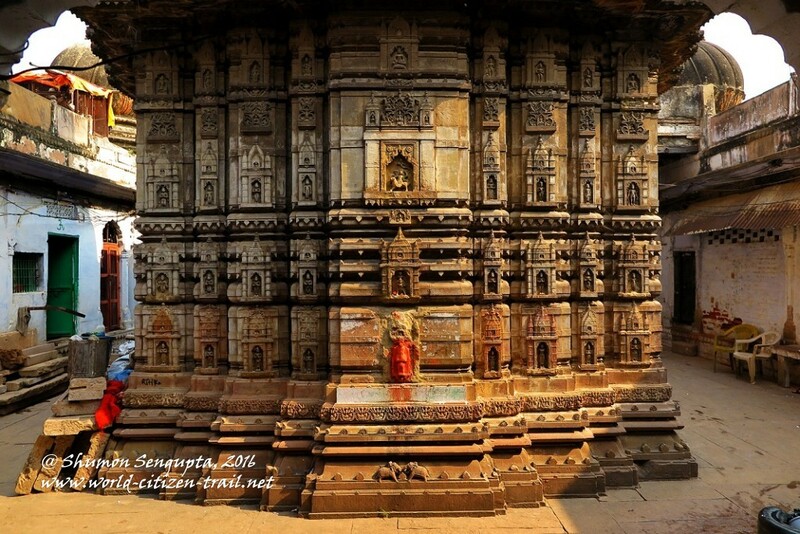 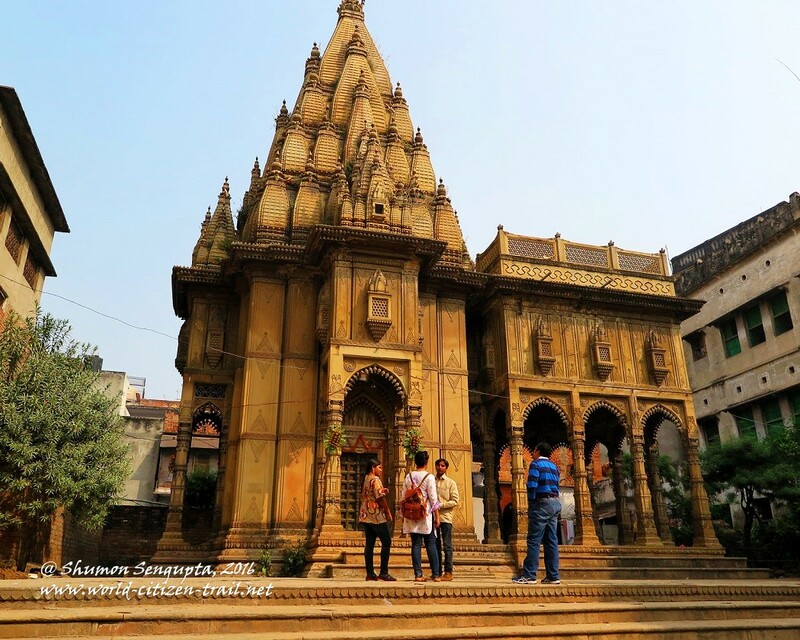 There is also a profusion of stone ‘lingas’ (phallic representation) of Lord Shiva, the presiding deity of Varanasi, in all possible niches and corners. 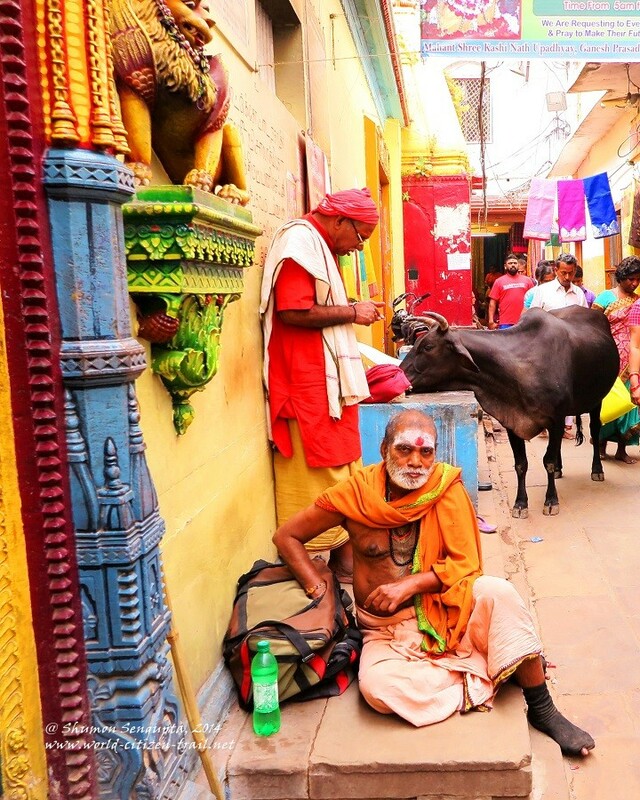 If you are from one of the monotheistic religions, the prodigious display of a multitude of Hindu religious images and icons will most likely leave you astounded and confused – Hinduism will seem totally incomprehensible and impenetrable, at least to begin with. 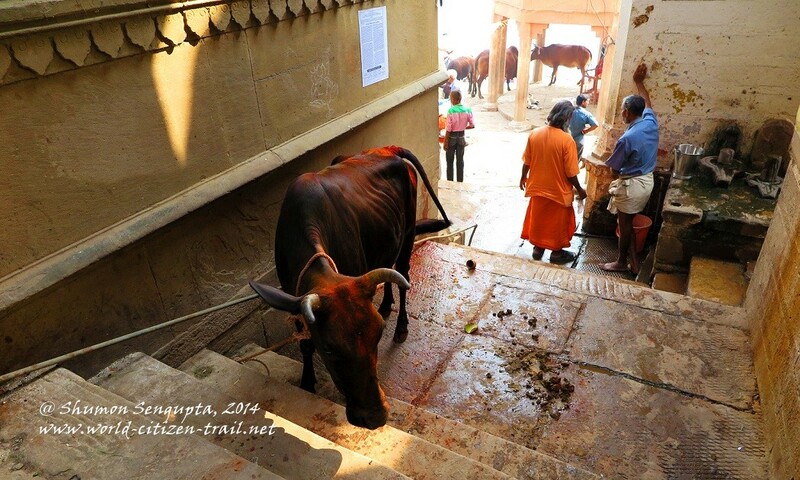 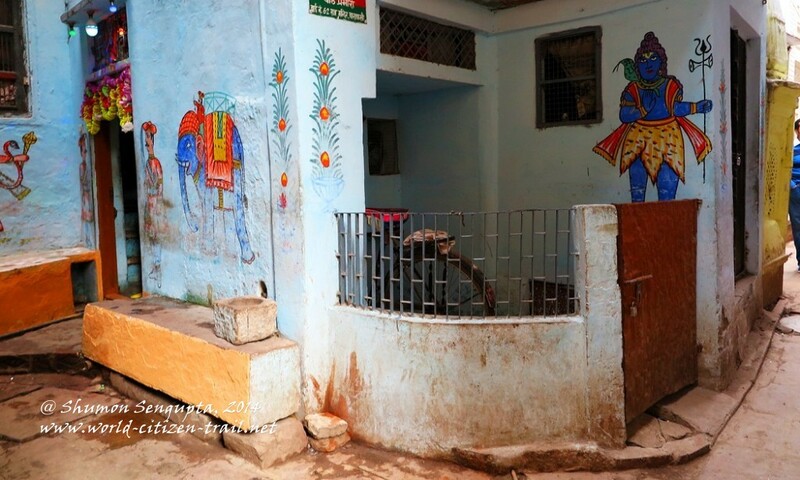 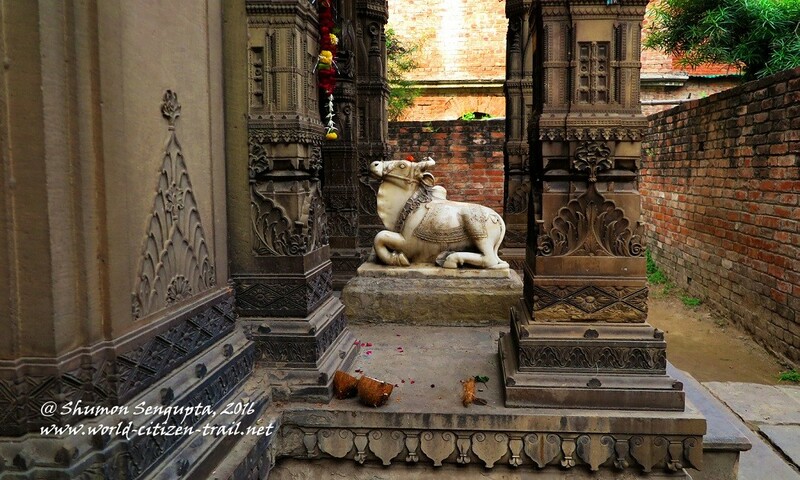 As you walk through the confusing maze, you will have to negotiate your way with stray cattle (particularly bulls – scary but pretty tame), pariah dogs, local residents, pilgrims and tourists, and where the passages are wide enough – with handcarts laden with goods, rickshaws and speeding two and three wheelers. 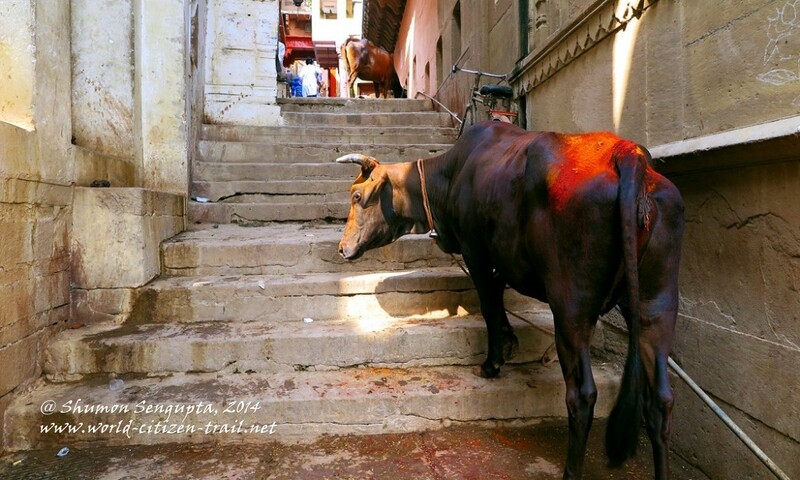 You will find yourself gingerly skipping over garbage piles, cattle droppings and dog poop, left over food, and discarded ritual offerings from previous day’s worship. 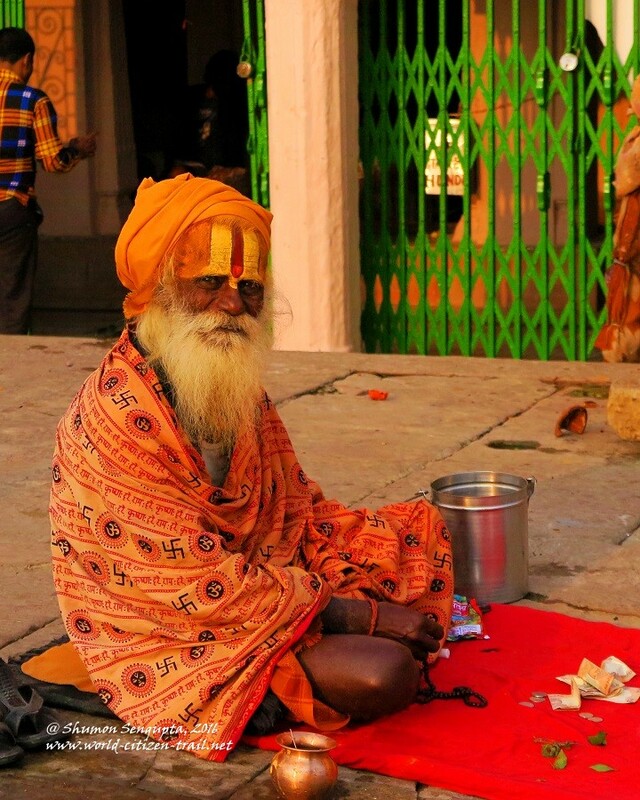 You will bump into sadhus and sanyasis who are stark-naked-ash-smeared, or brightly and generously robed or anything in between. 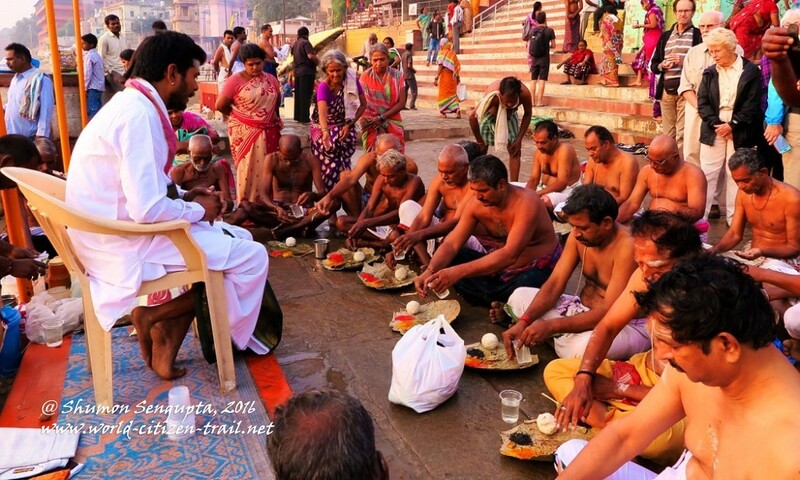 And you will encounter ‘pundits’ (teachers), ‘purohits’ (priests), ‘pandas’ (temple touts), mendicants, wrestlers, widows (sadly abandoned by uncaring families), pilgrims, devotees and wealthy temple patrons. 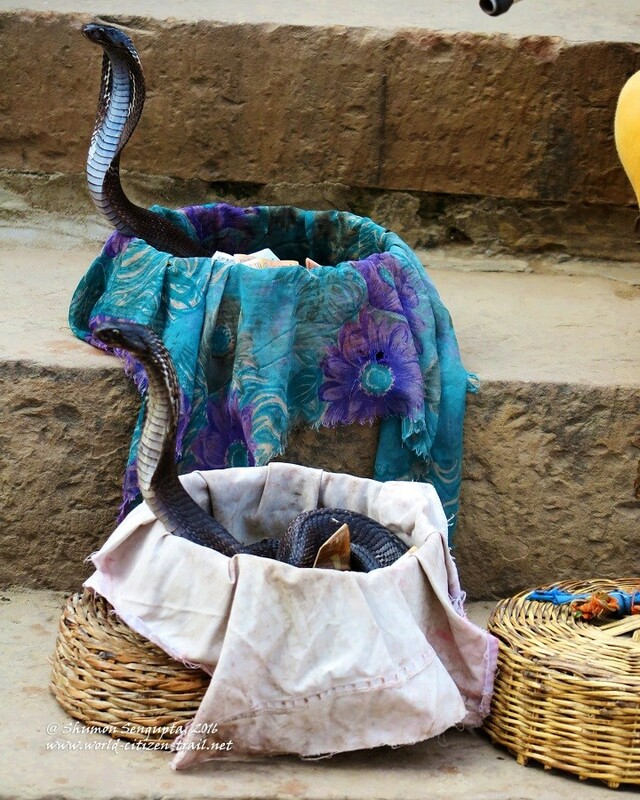 You will meet a snake charmer or two, with their half dazed, ill fed cobras, cajoled and terrified into making a show of their raised hoods. 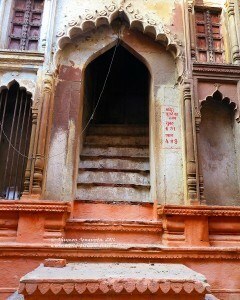 Paupers and millionaires rub shoulders in these ancient passages, totally oblivious of each other. 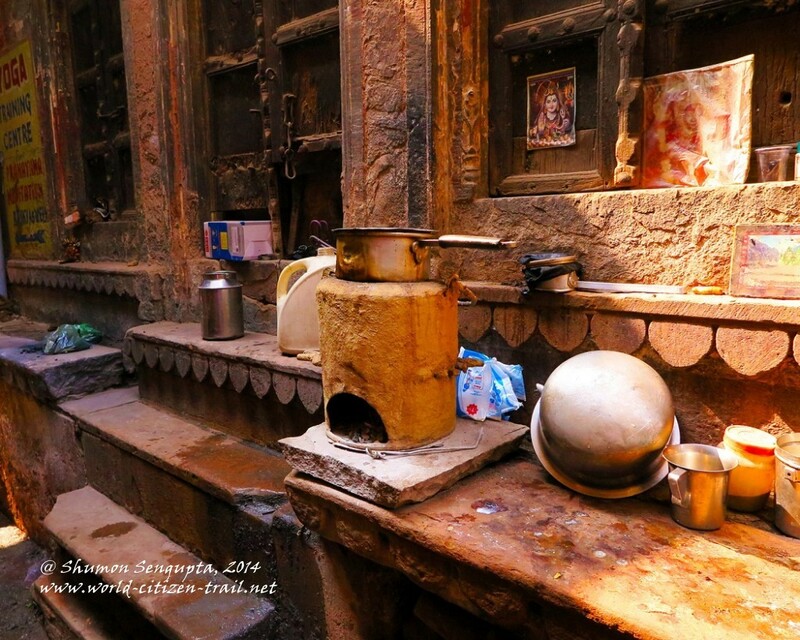 It is a vibrant space surging with life, energy and vitality; a place where you get a glimpse of the full cycle of birth, life and death, the last considered a celebration in itself, in Varanasi. 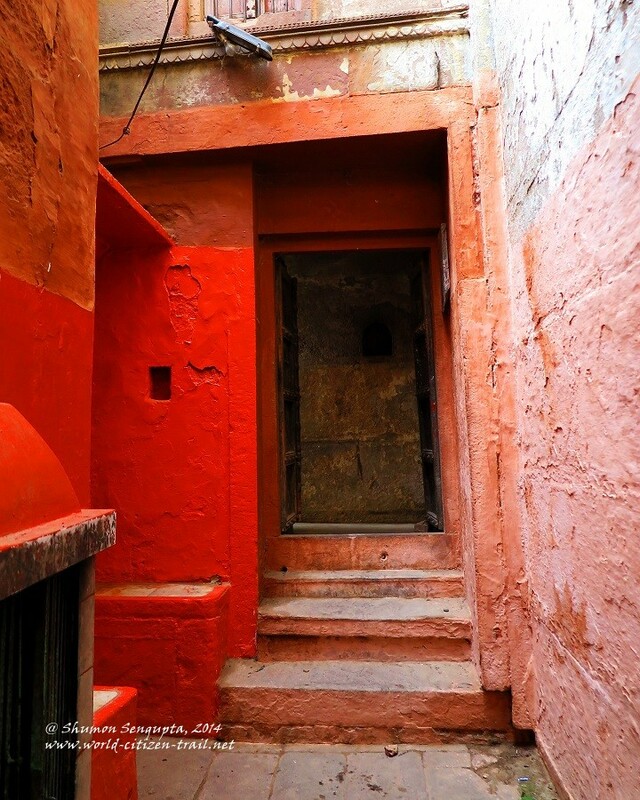 And if you are mindful, you will suddenly find a short flight of steps leading up or down into a spectacularly beautiful, old and crumbling temple. 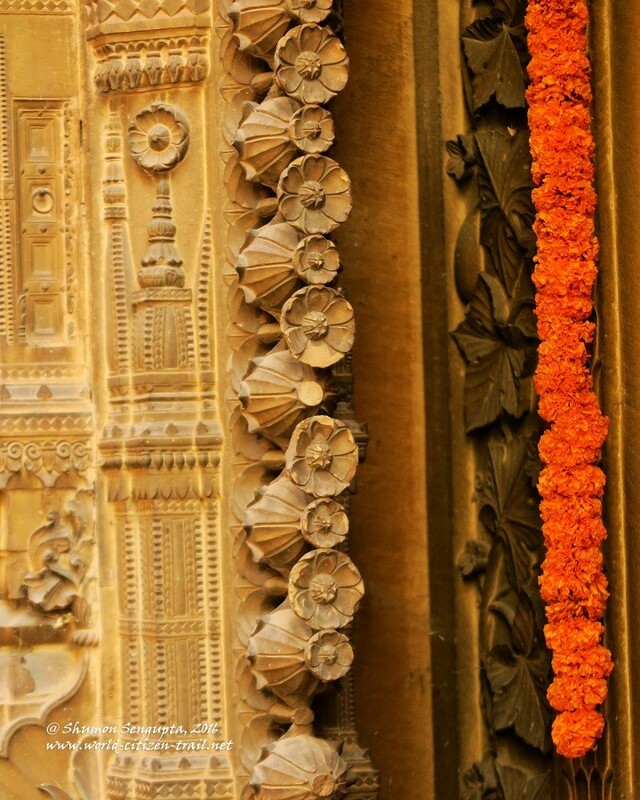 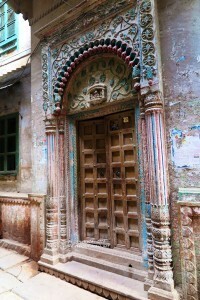 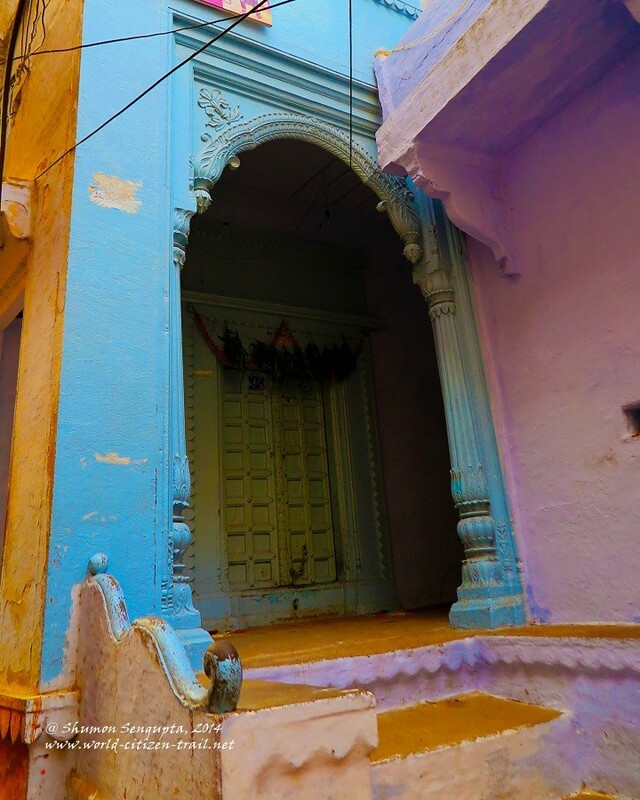 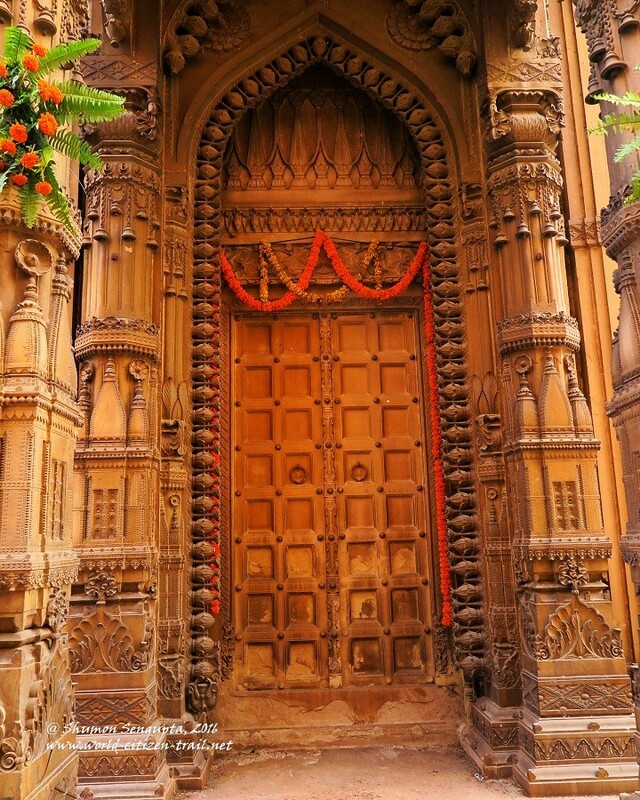 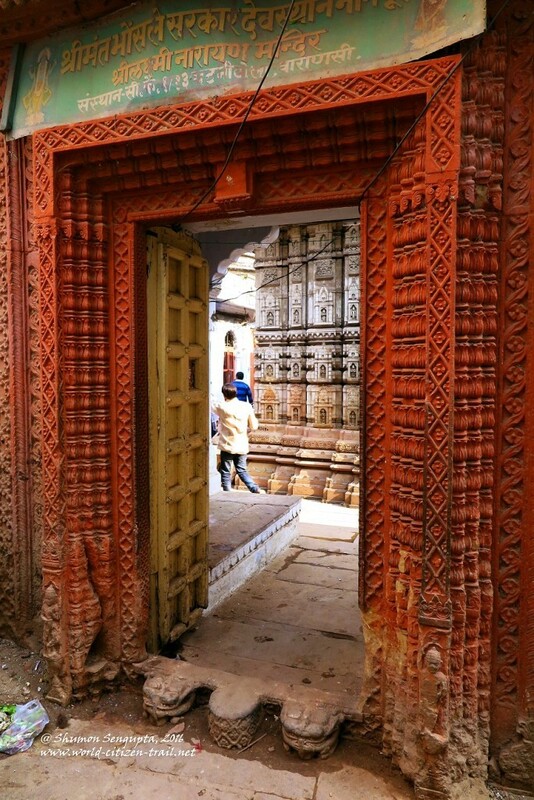 A peep through an ornamented doorway will often reveal a magnificent courtyard of a traditional residential building, or a passage leading to beautiful temple or shrine, or a school for religious studies. 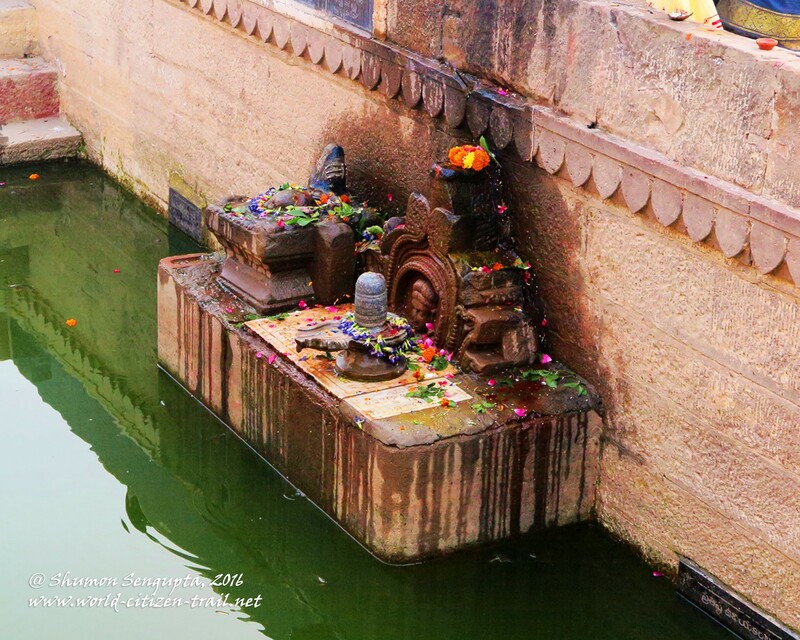 You will also find wells and stepped holy tanks (‘kunds’) with stagnant waters. 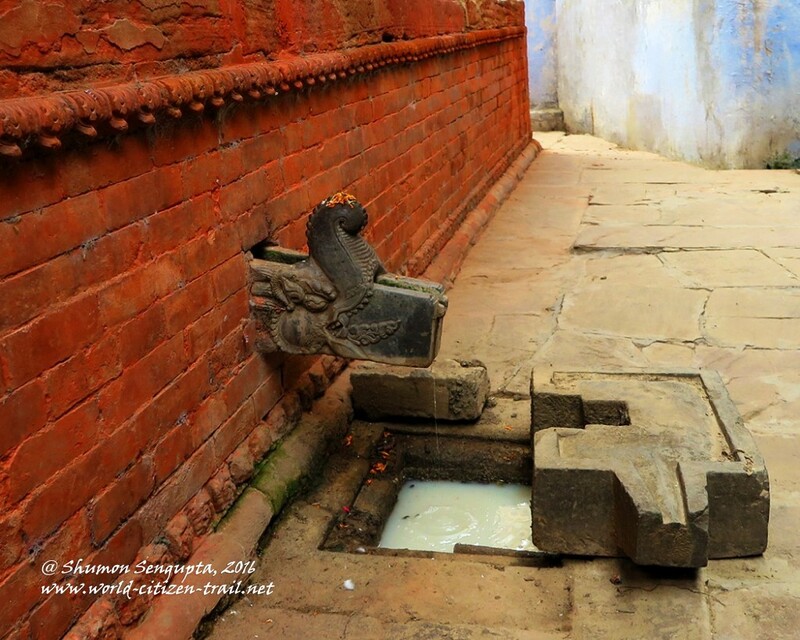 You will lose your way and then find your way, only to lose it again. 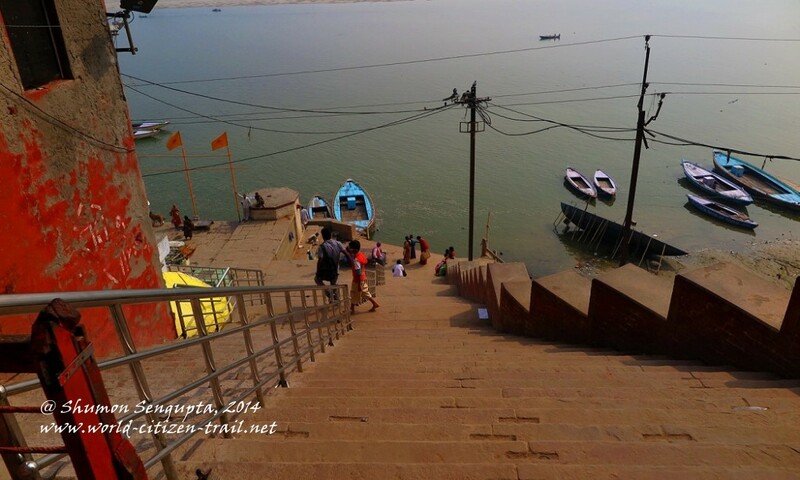 All along the labyrinth of narrow lanes, at places, there are flights of steep steps descending towards the riverfront and ending in the river. As you take one of these flights and descend towards the river, you will find yourself transitioning from a dark, enclosed and meandering maze into the iconic ghats (masonry, stepped embankments) of Varanasi – a dramatically contrasting expanse of space, light, air and water. 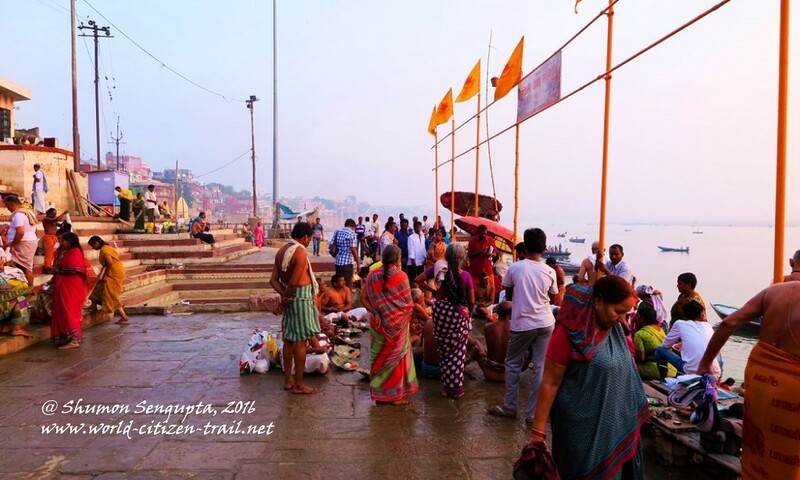 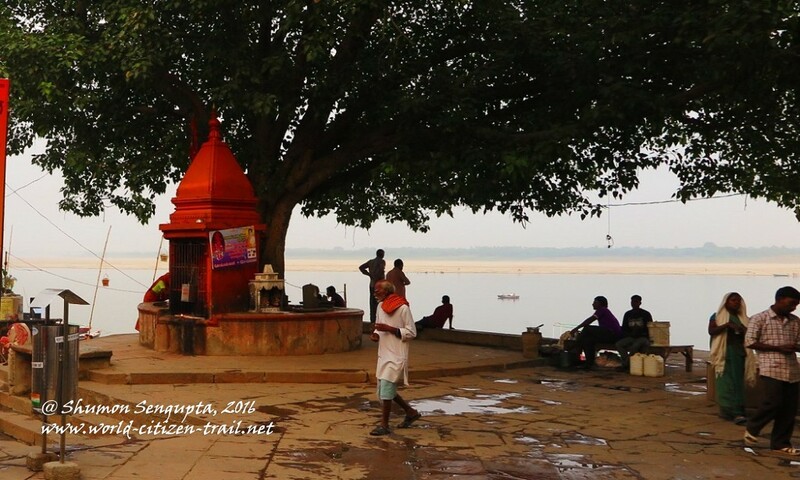 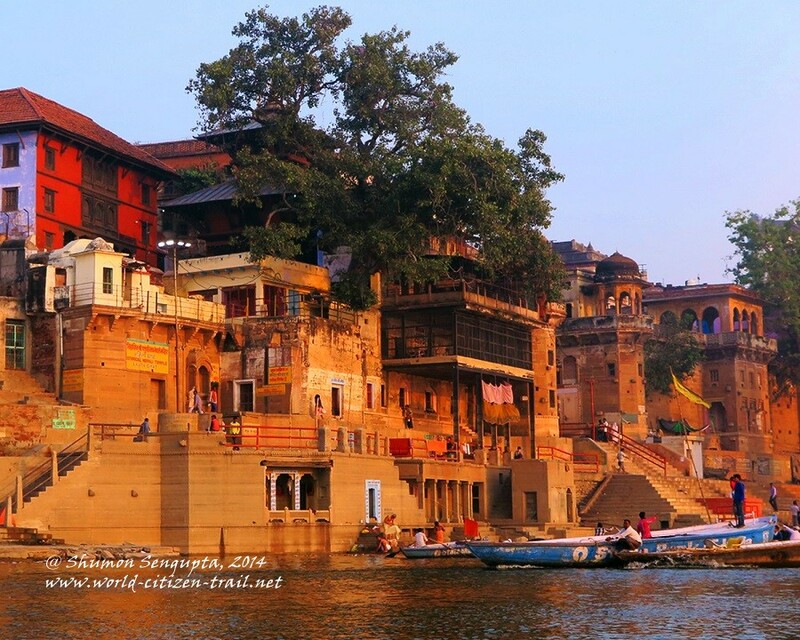 On these ghats, particularly in the mornings, starting from the crack of dawn, local residents and pilgrims bathe, worship, meditate, exercise, practice yoga, and give offerings and pray in the numerous temples. 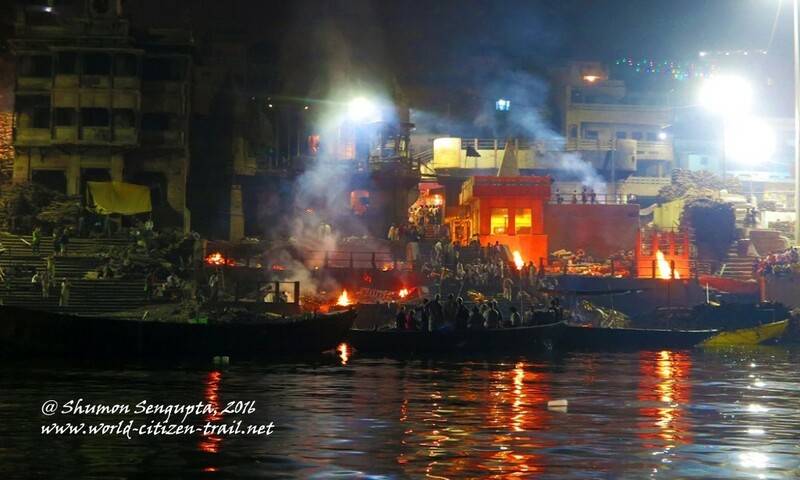 Of the eighty four named ghats, two are used as cremation grounds. 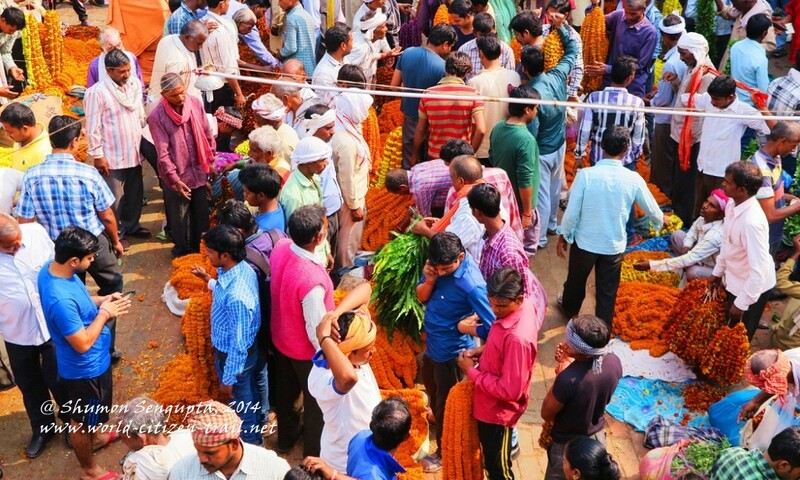 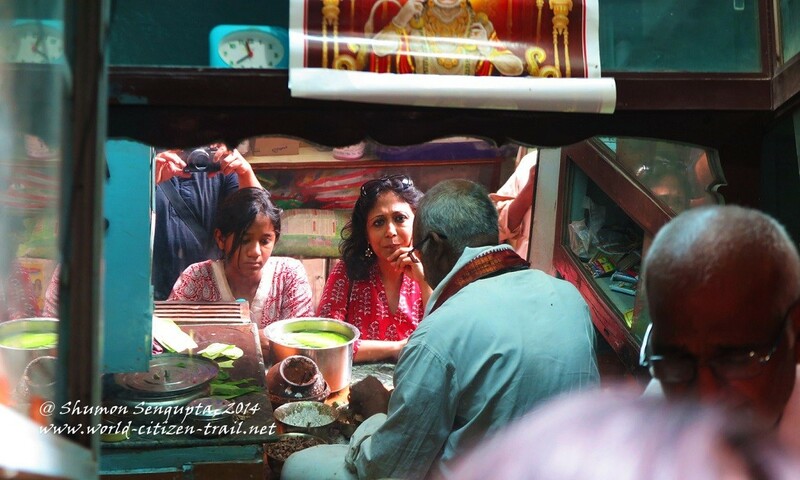 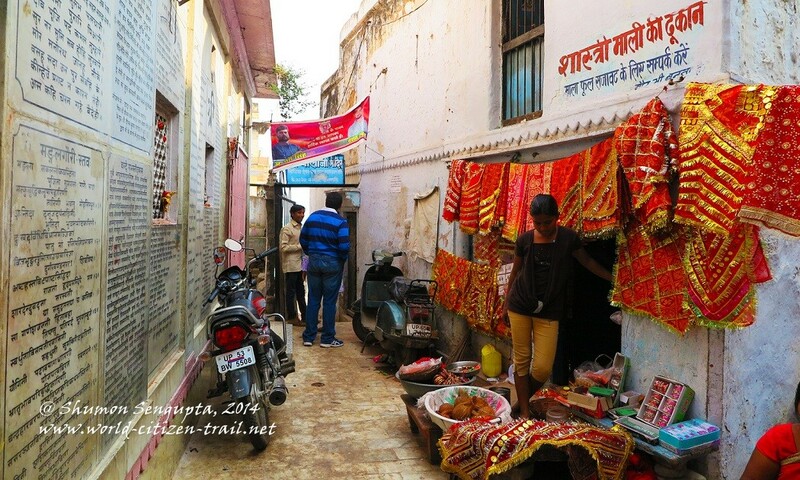 The ghats also have their vendors selling a wide range of ritual items, flowers, fruits, apart from tea and refreshments. 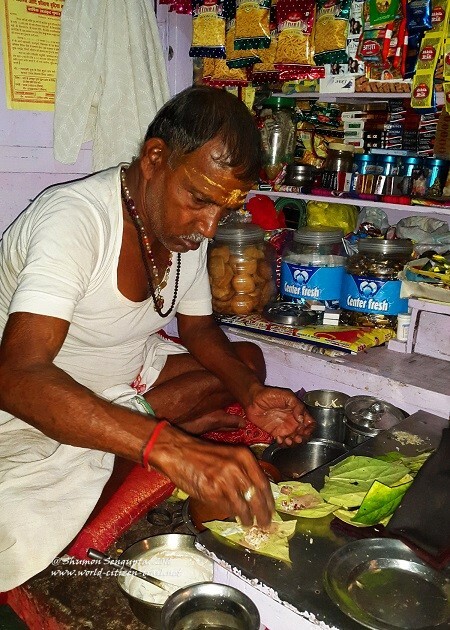 It is also a place where devotees seek out the services of priests for conducing rituals – mainly in honor of the spirits of departed family members and ancestors. 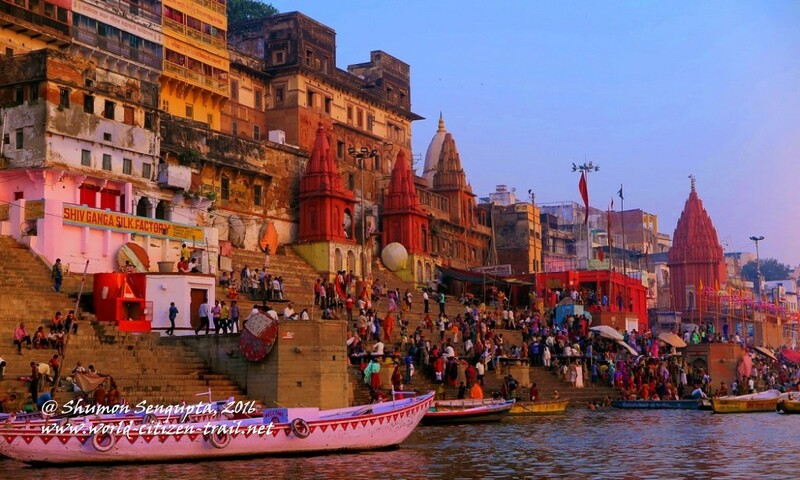 Also, various Hindu festivals that are intimately linked to the seasons are celebrated by local residents throughout the year on the ghats. 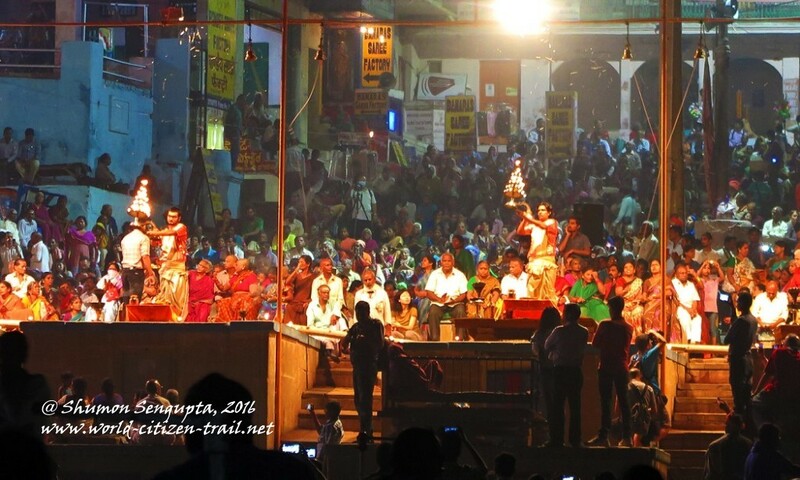 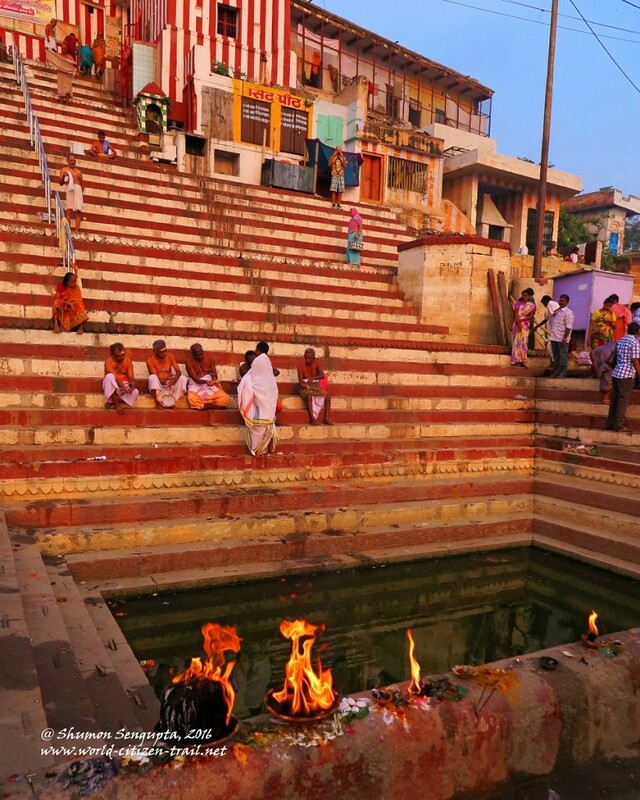 In the evenings, apart from being a space for ‘aarati’, a sacred twilight ritual of lights and sounds, the ghats becomes a popular social space, particularly for young people. 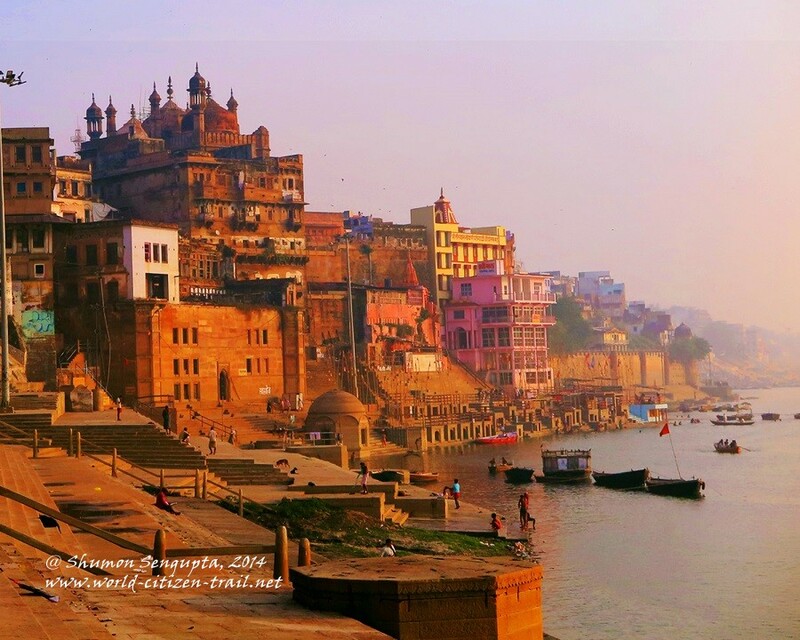 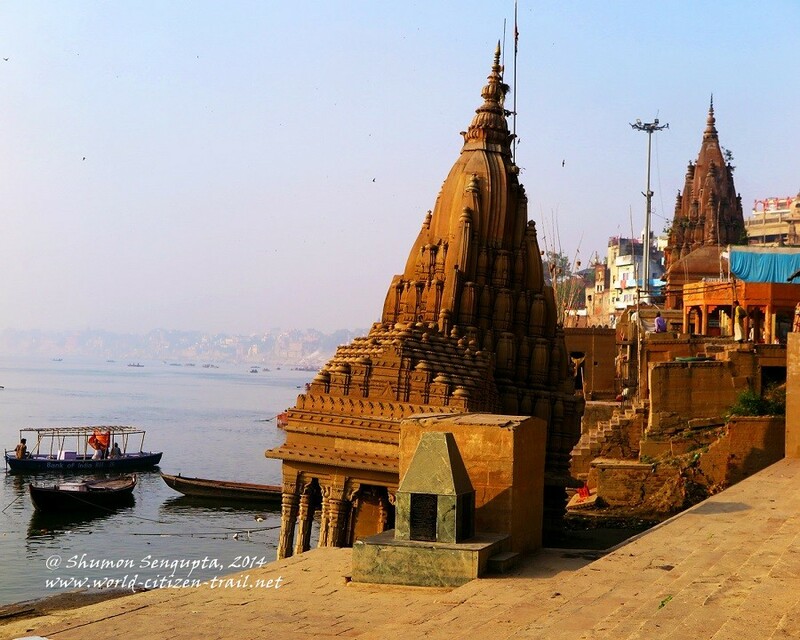 While the origin of Varanasi dates back to the first millennium BCE, the oldest ghats, as we find them today, date back to the 14th century CE. 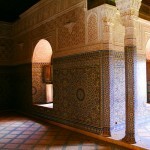 Subsequently, these were extensively renovated, rebuilt and expanded between the 18th and 20th century CE. 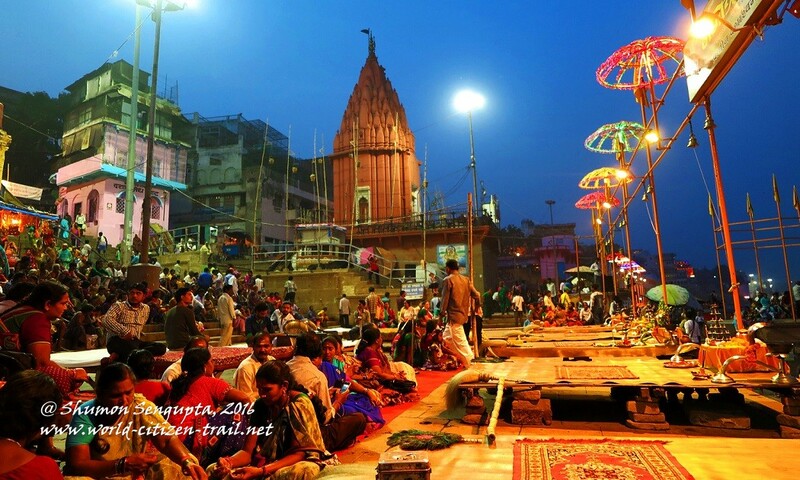 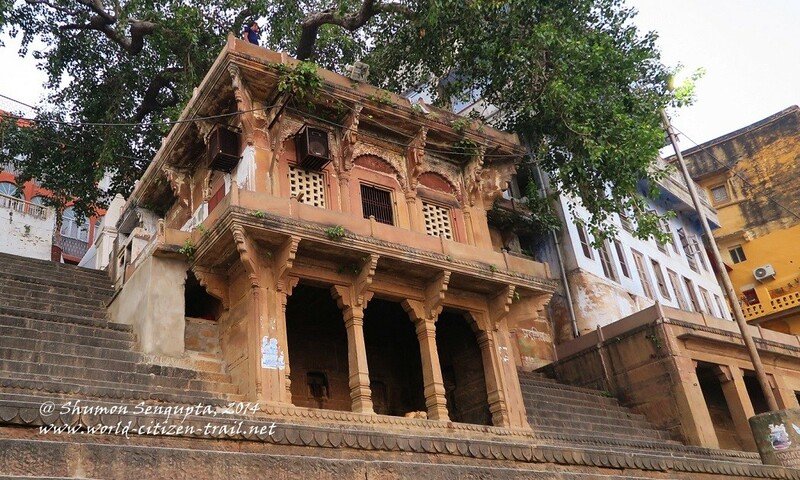 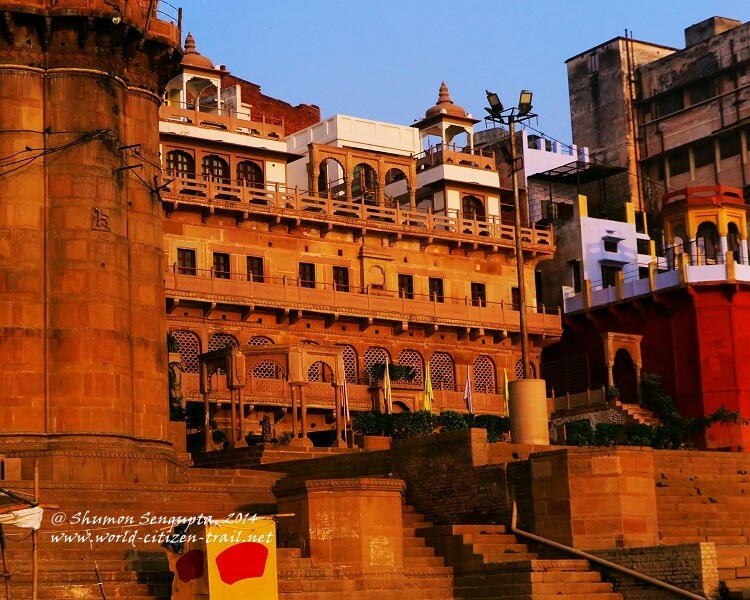 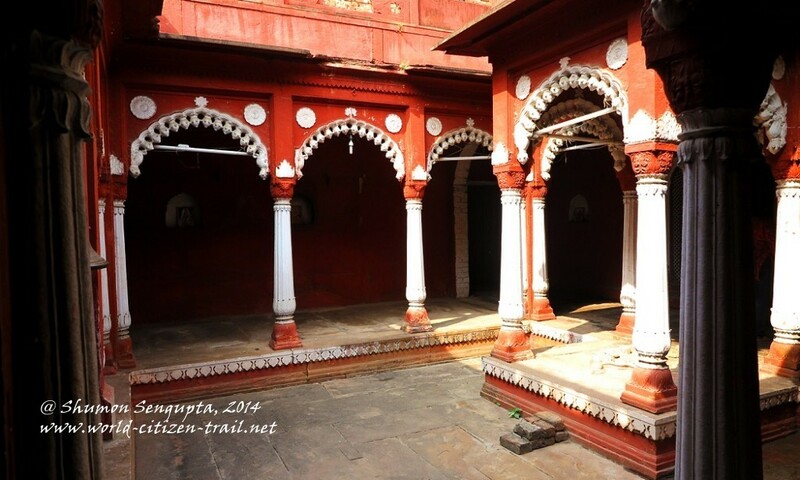 As public spaces, these ghats have organically evolved over ages into a spiritual and cultural center for Hinduism. 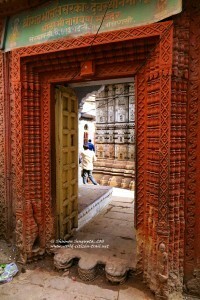 It is an outstanding site of historically accumulated cultural heritage. 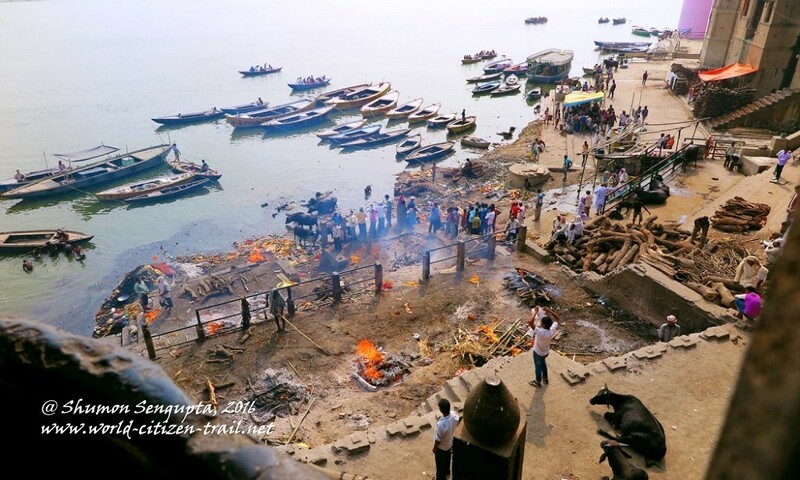 Here you will find the magnificent and splendid spectacle of Hindu ritual worship (the Ganga ‘Arati’ in particular) on one hand, and on the other hand, on two cremation ‘ghats’ – named Harishchandra and Manikarnika – the macabre and sordid spectacle of the Hindu cremation of the dead. 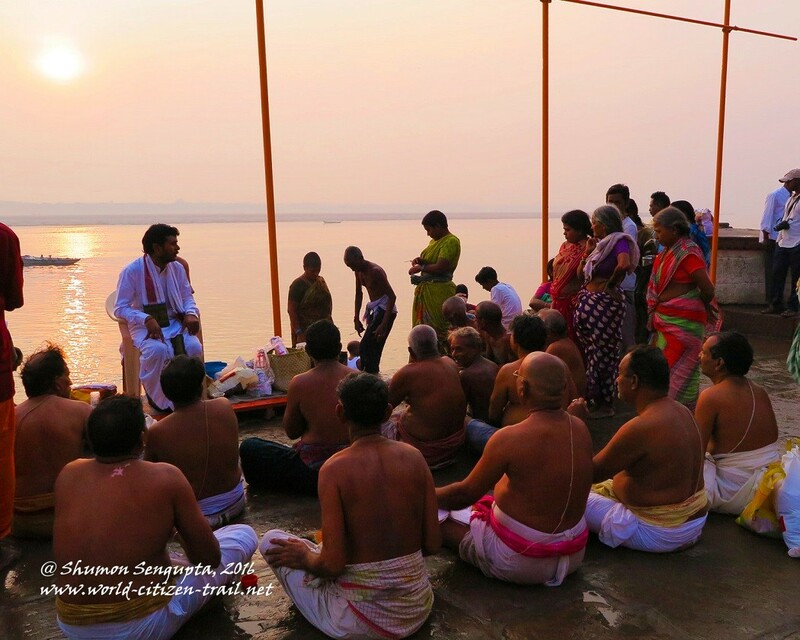 The riverfront serves as a grand proscenium for the enactment of ancient traditions, rituals, beliefs, values and collective cultural memories intimately linked to the cycle of seasons and to human life and death. 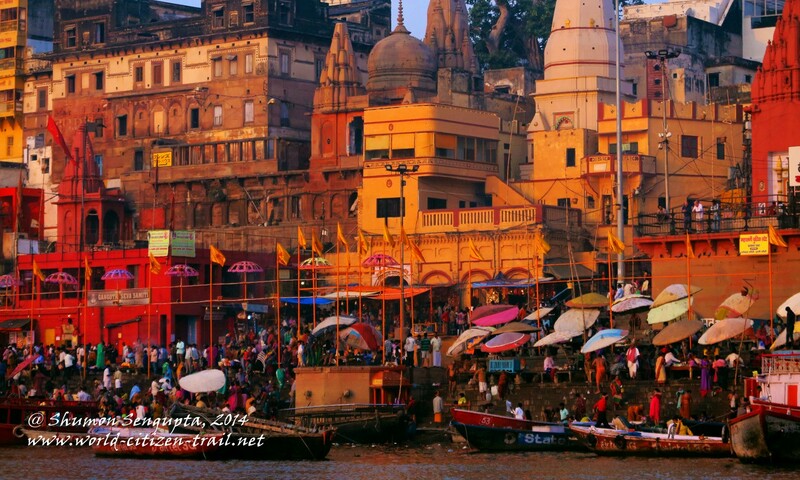 And everything is closely tied to a deep reverence for nature and for the river Ganges, the latter considered to be of divine origin by Hindus. 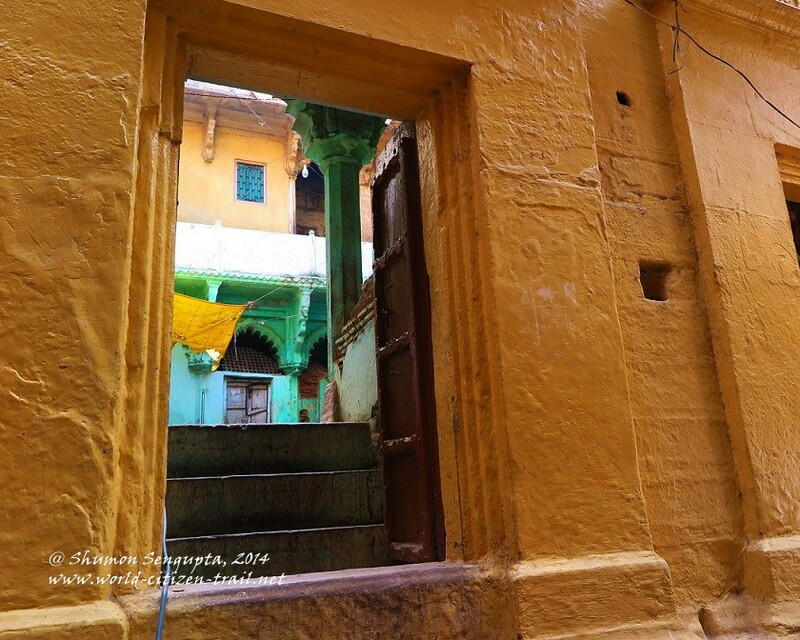 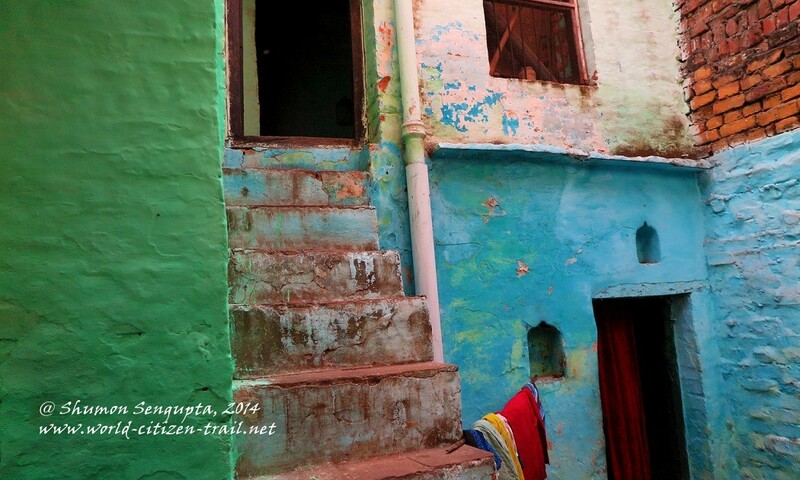 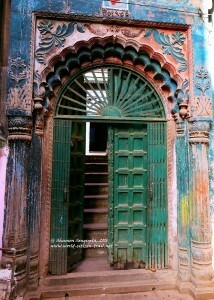 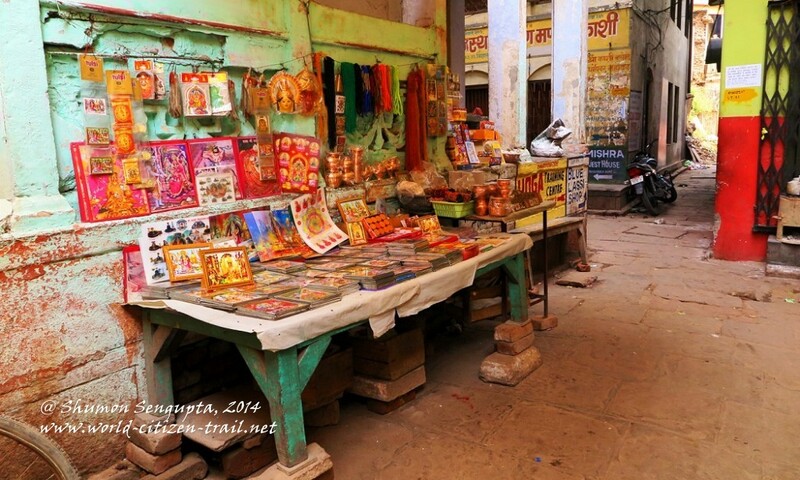 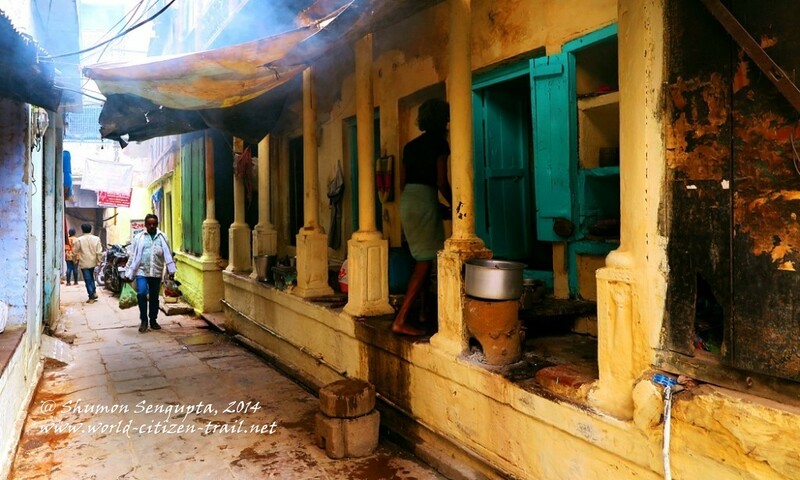 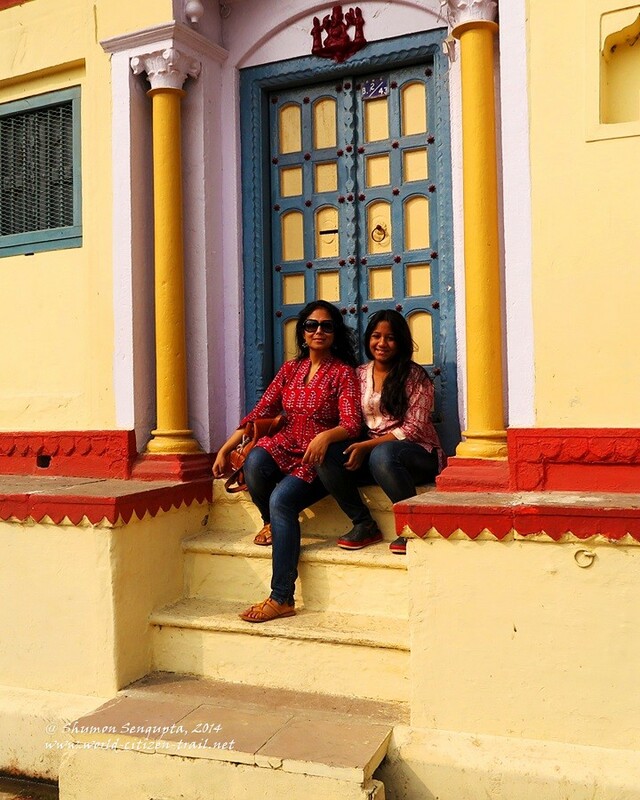 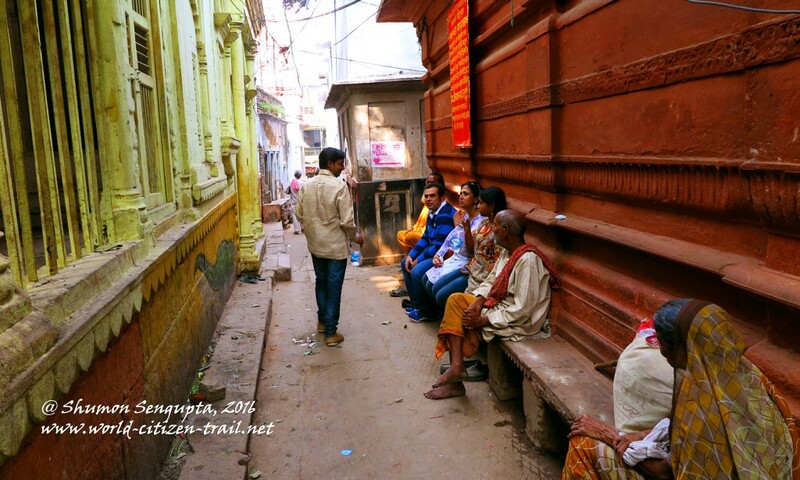 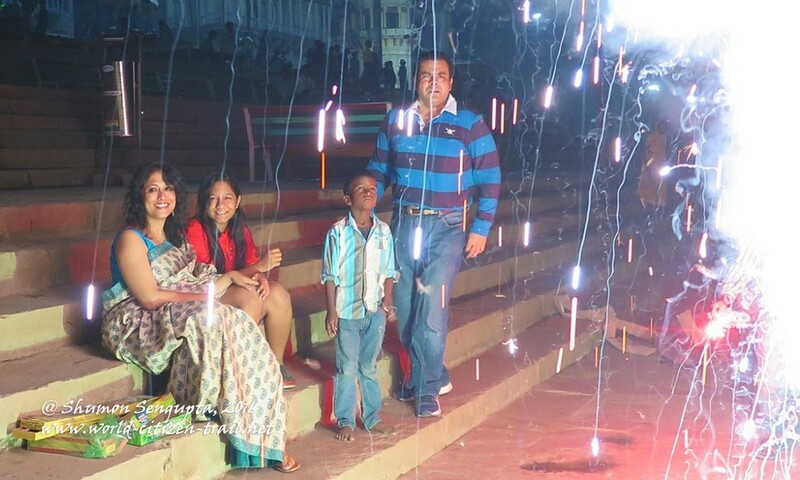 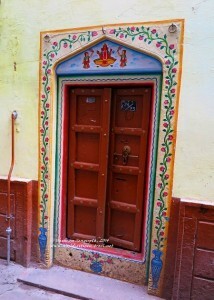 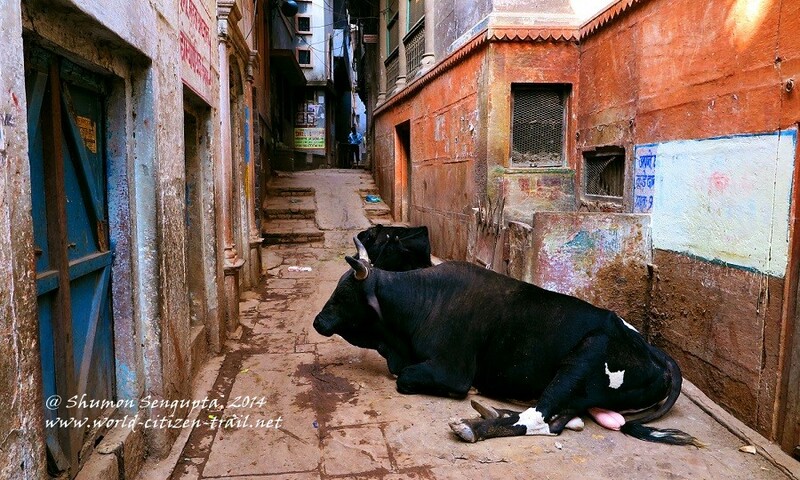 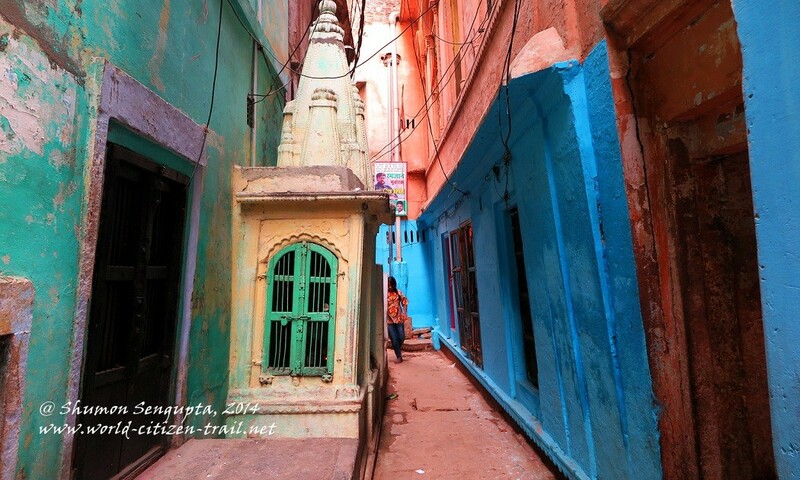 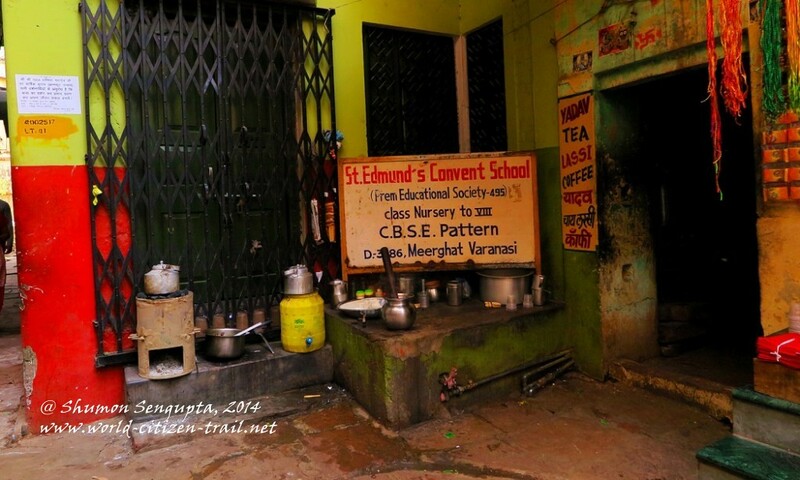 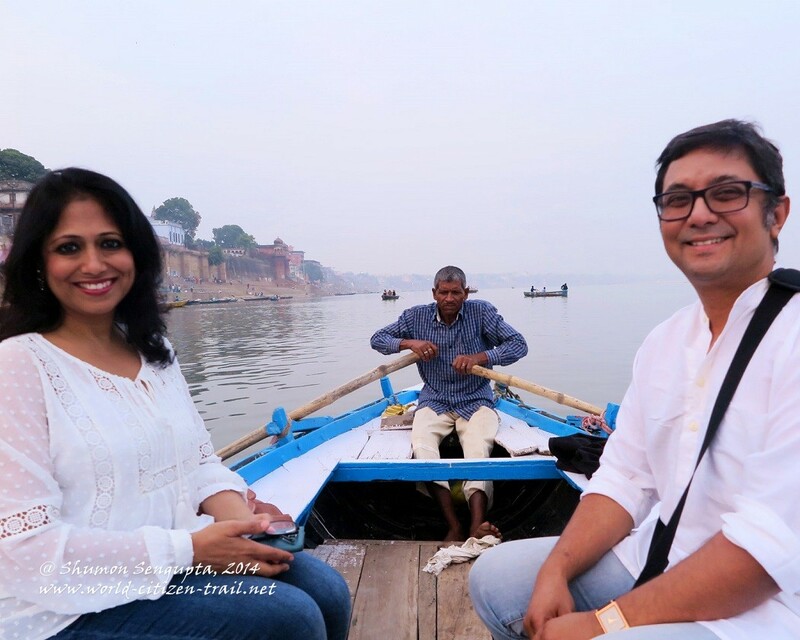 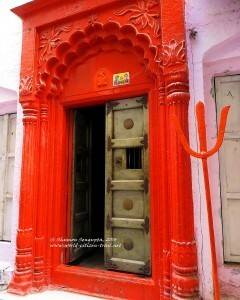 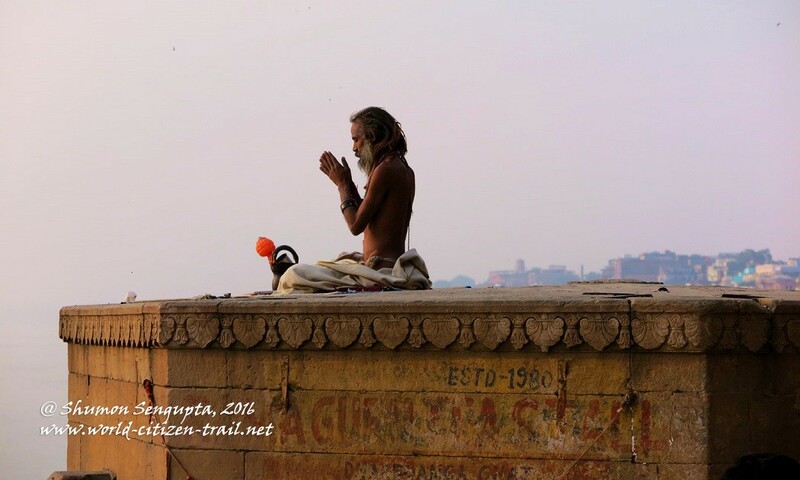 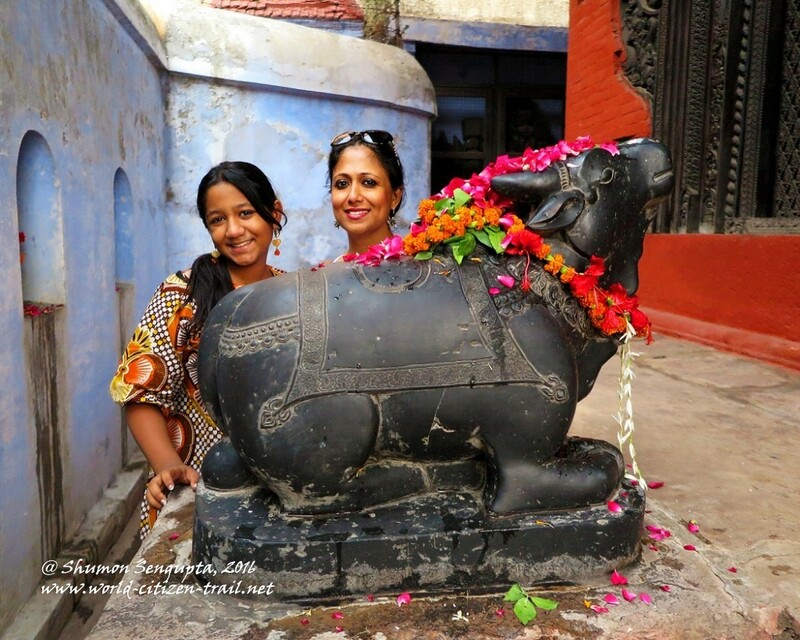 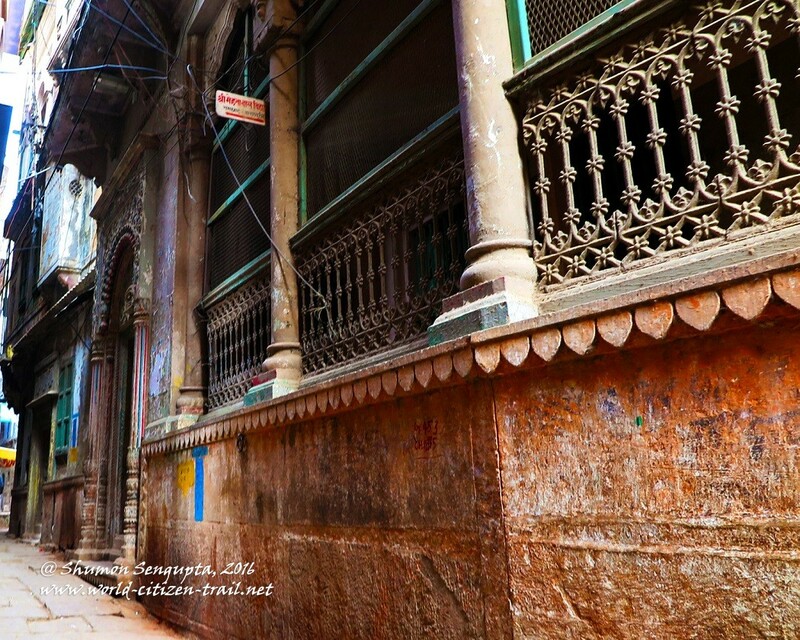 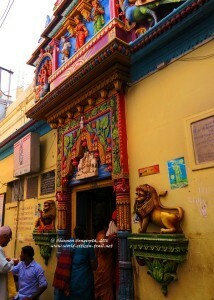 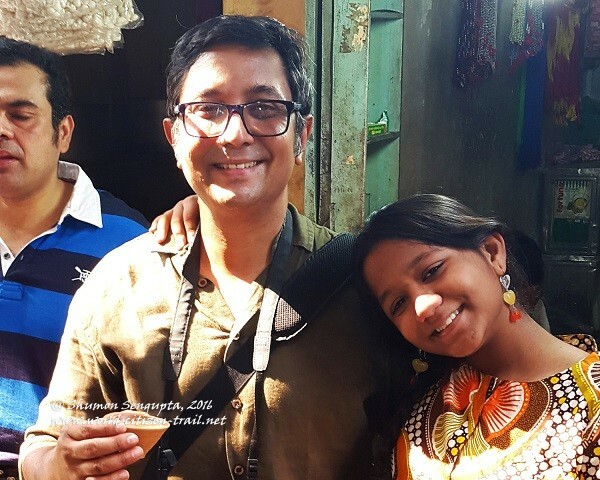 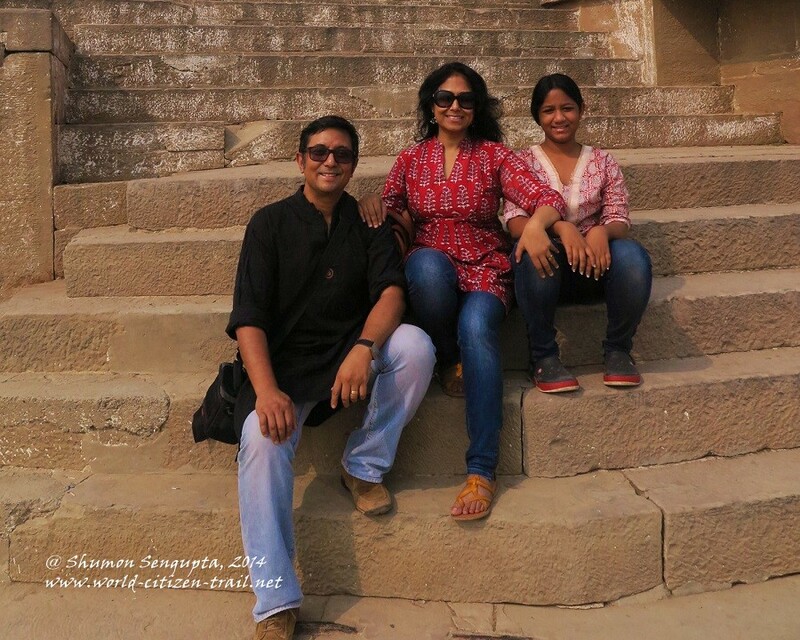 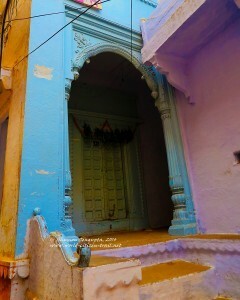 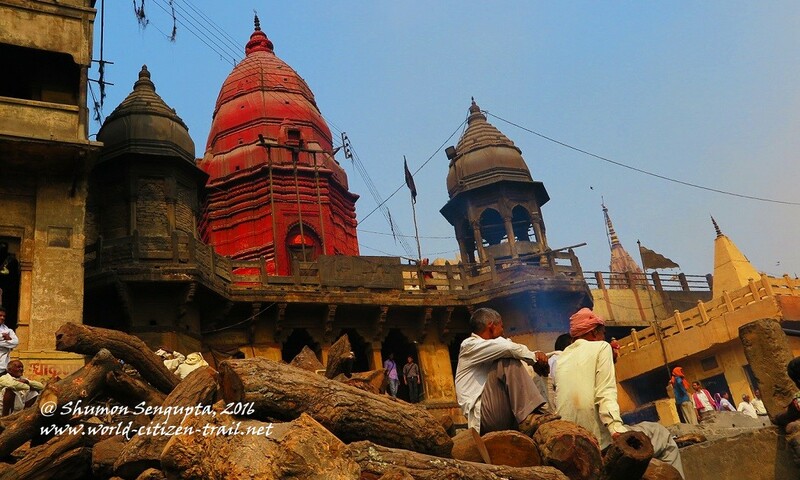 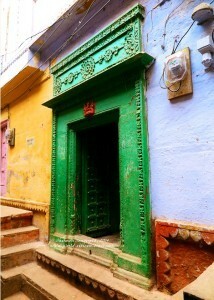 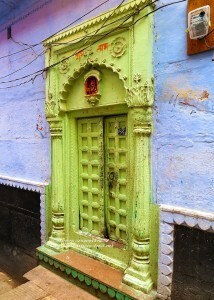 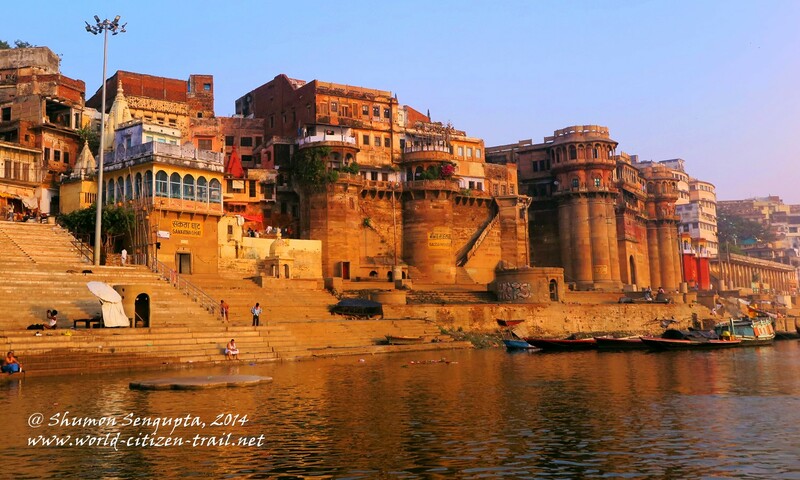 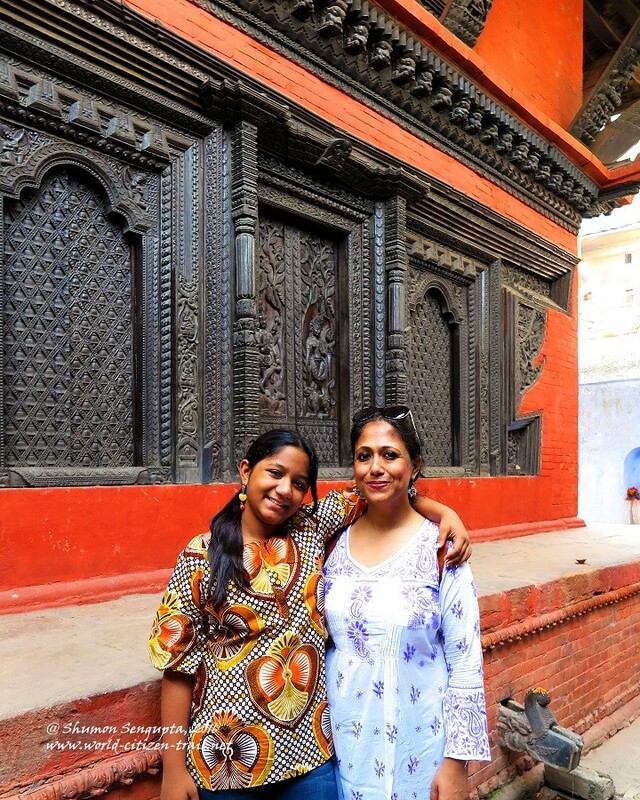 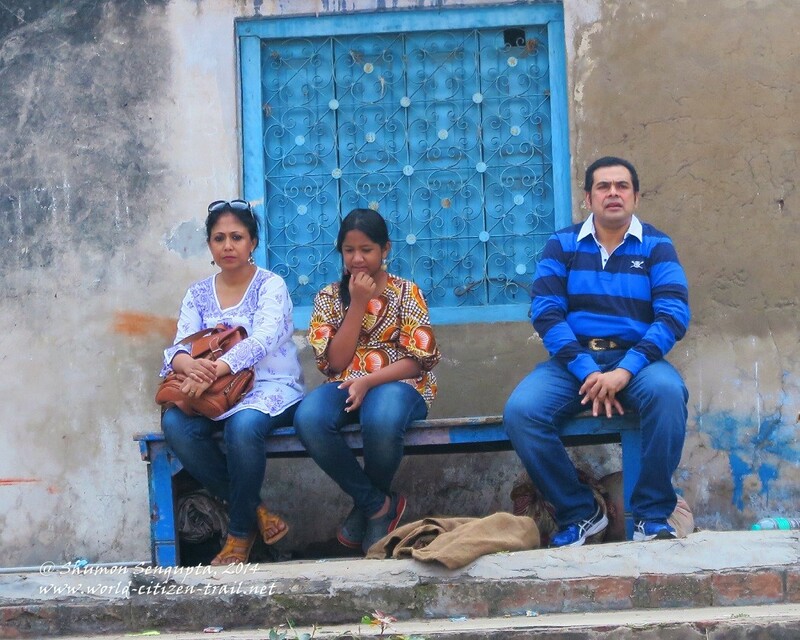 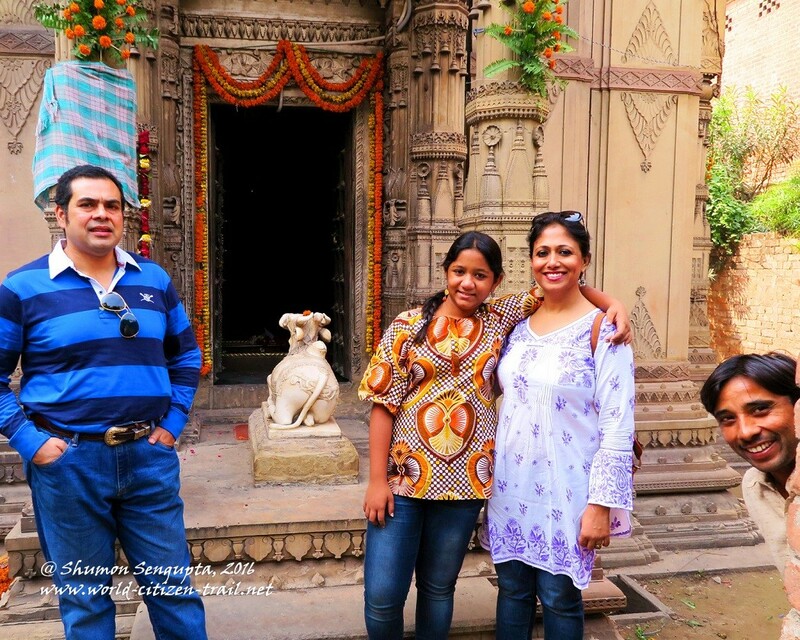 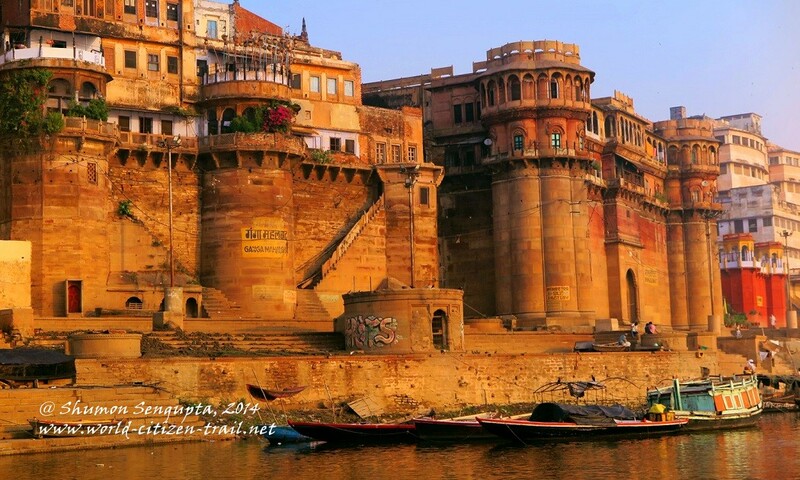 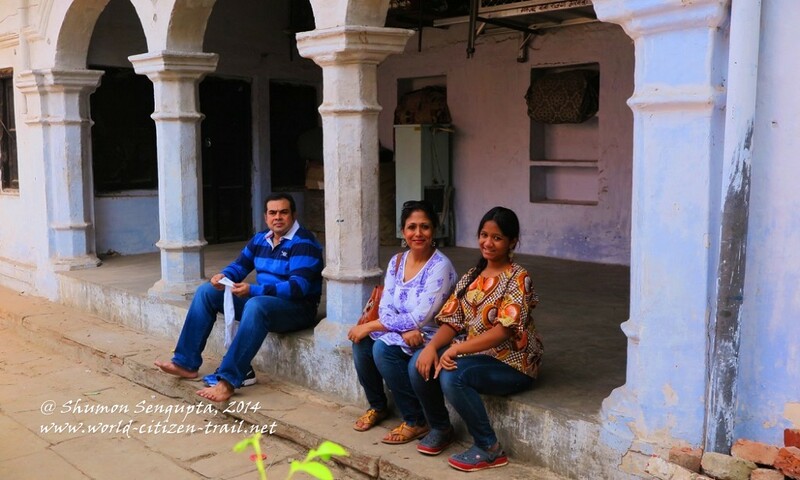 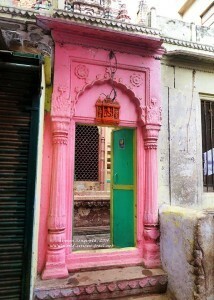 We were captivated by the beauty, charm and mystique of Varanasi. At the same time, we were deeply disturbed to see the overwhelming lack of any sense of civic and environmental hygiene among residents and visiting pilgrims alike. We were nettled by the sense of profound material apathy that residents and pilgrims demonstrated, both to the built-up landscape and to the river. 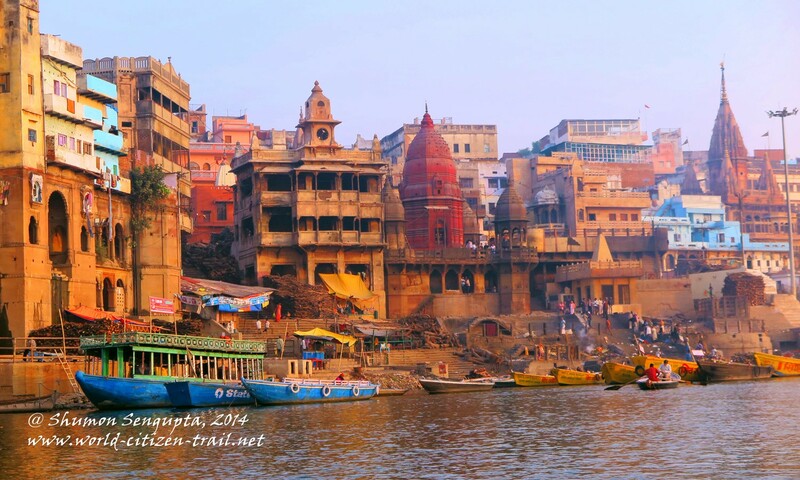 This contradicted sharply with the deep spiritual reverence Hindus have for Varanasi as a sacred space, and the Ganges as a divine river. 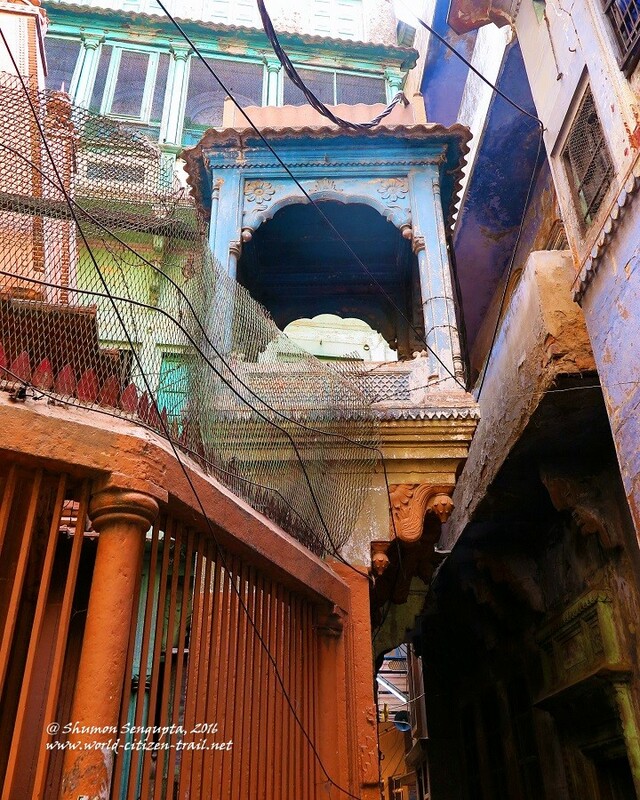 Moreover, we couldn’t help notice the visual dissonance and ugliness caused by a plethora of banners, bill boards, advertisements and graffiti, and the construction of totally incongruous modern buildings in different parts of the old city, including at the otherwise spectacular waterfront. 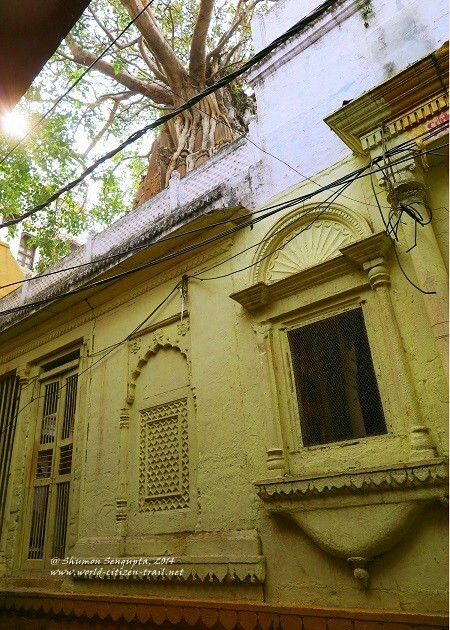 Some of the new constructions were totally incompatible with the traditional architecture, aesthetics and cultural history of the place. 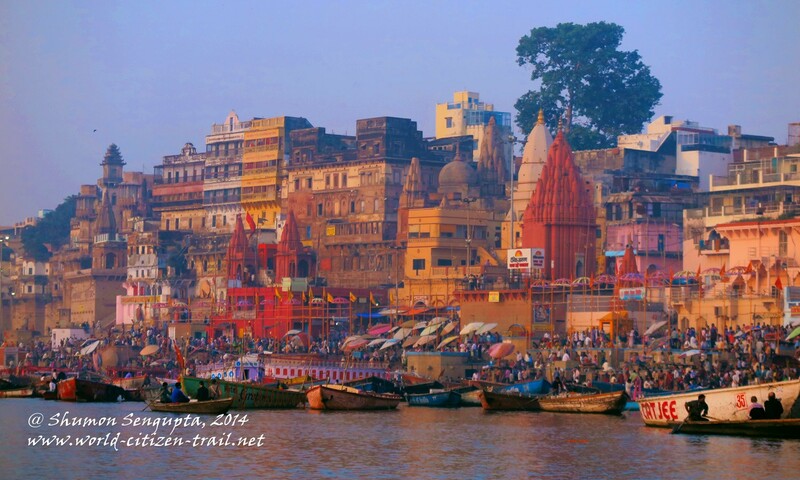 The serving Prime Minister of India, Mr. Narendra Modi, who is passionately trying to inspire a nation-wide “Clean India Campaign” (Swaccha Bharat Abhiyan), is deeply committed to improving things in Varanasi (incidentally his parliamentary constituency) and cleaning up the Ganges – the lifeline of Northern India. 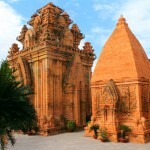 This is highly laudable and there have certainly been improvements recently. 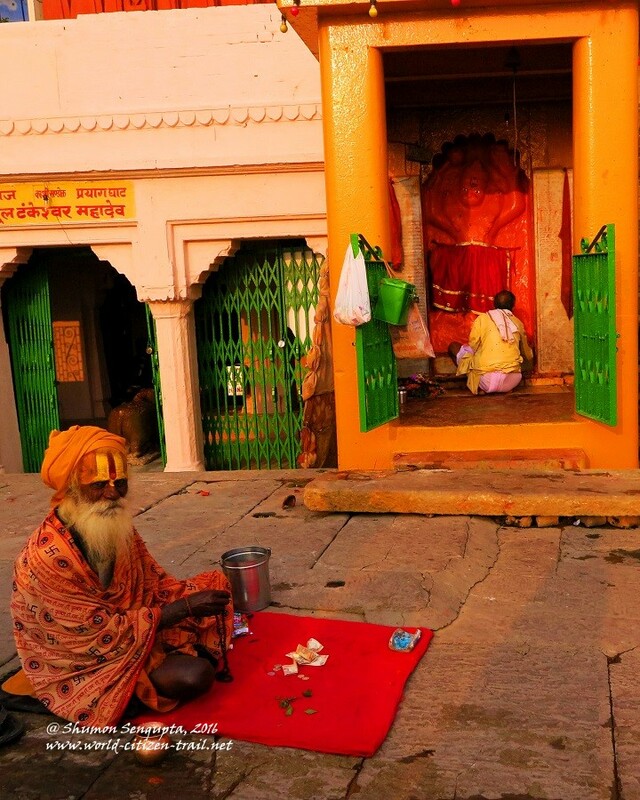 However, in addition to the leadership from the top, there is a need for fundamental transformation in the attitudes of residents and pilgrims, and mass participation from the bottom, to make any significant and sustained improvement. 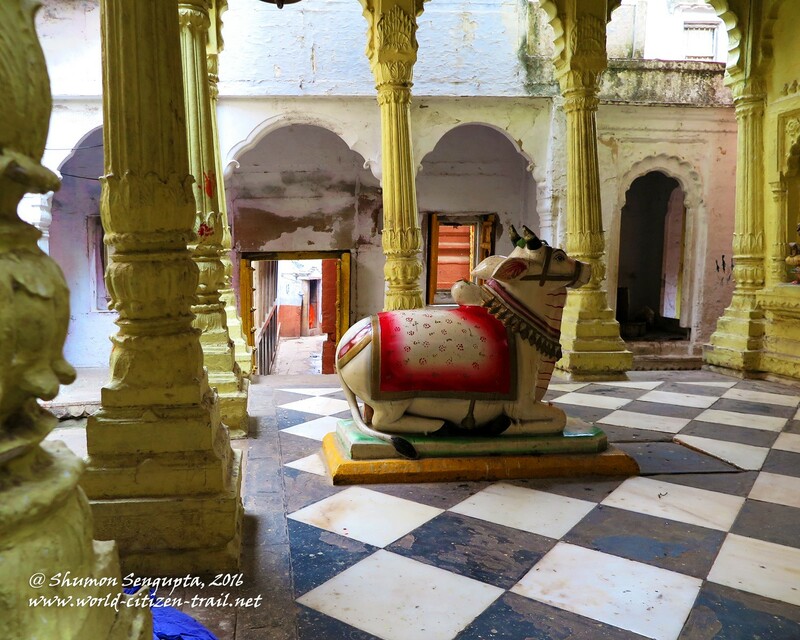 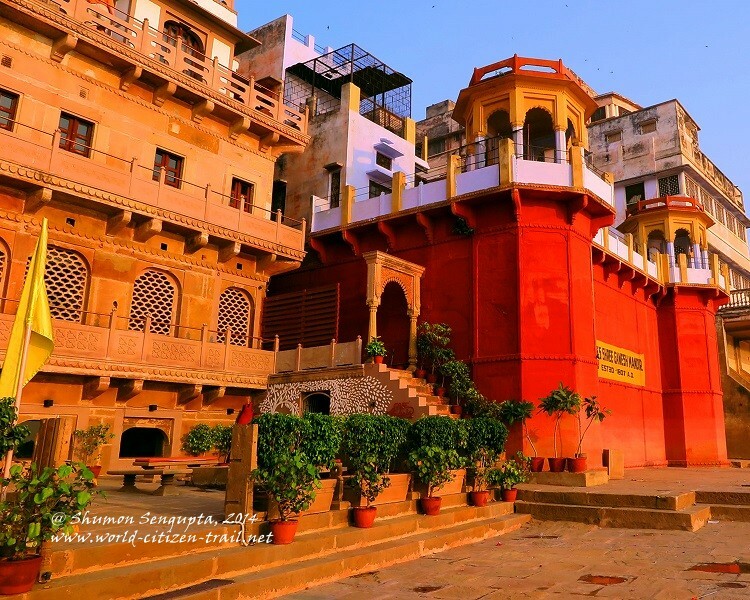 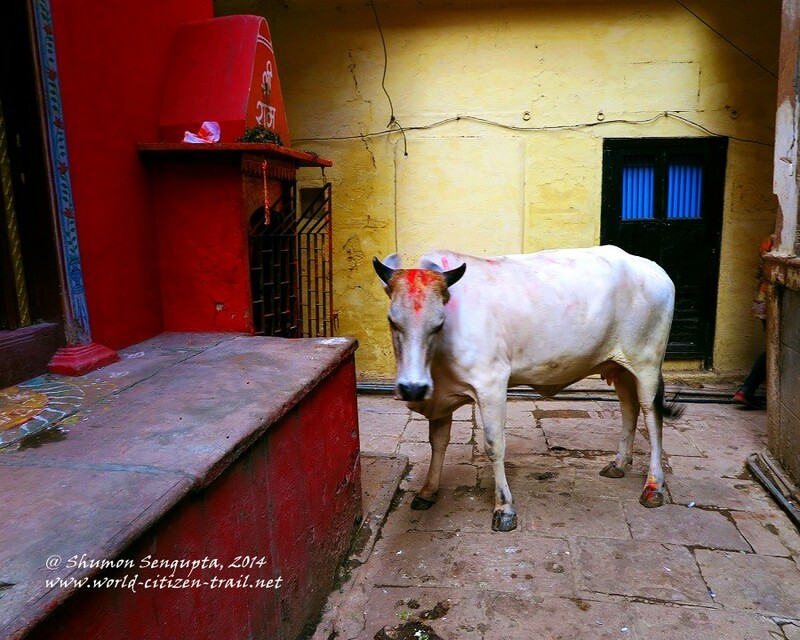 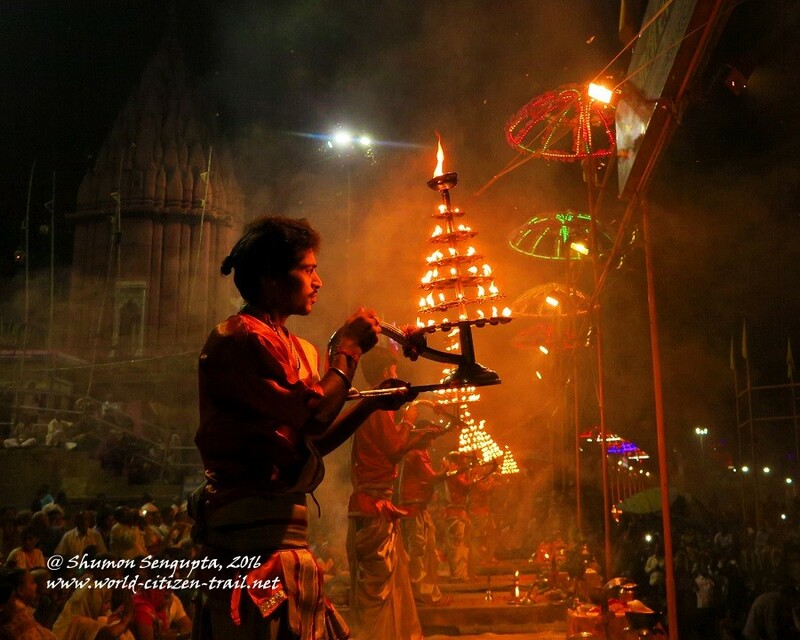 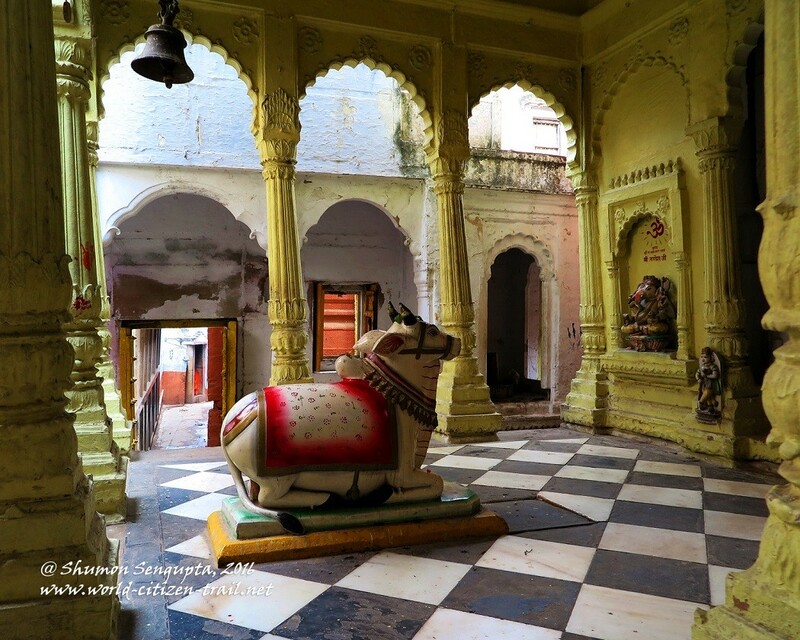 It is interesting to note that although Varanasi looks very ancient and unchanged, the city has actually changed and evolved dramatically over the last millennium. 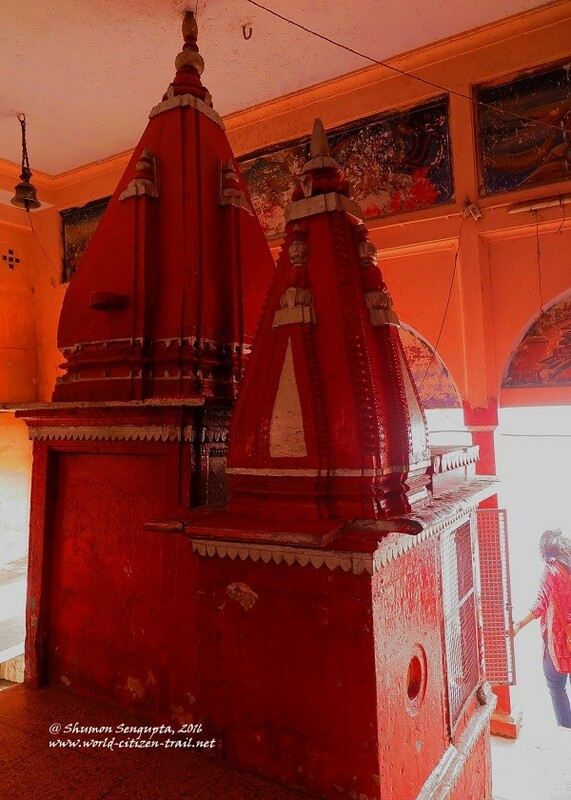 Between the 12th and 17th centuries, large parts of it, including many prominent Hindu temples were repeatedly destroyed by marauding Muslim armies several times over. 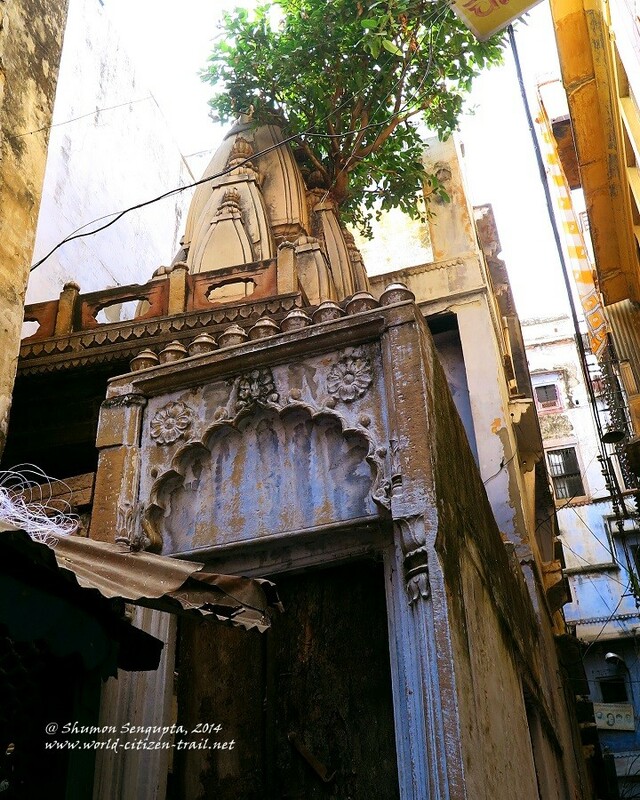 A large portion of the dense urban area that we see behind the riverfront today, which once was a place of grooves, streams, lakes and pools, were built from the 17th century onwards. .
For over seven centuries, many ancient temples were destroyed and mosques built over the ruins. 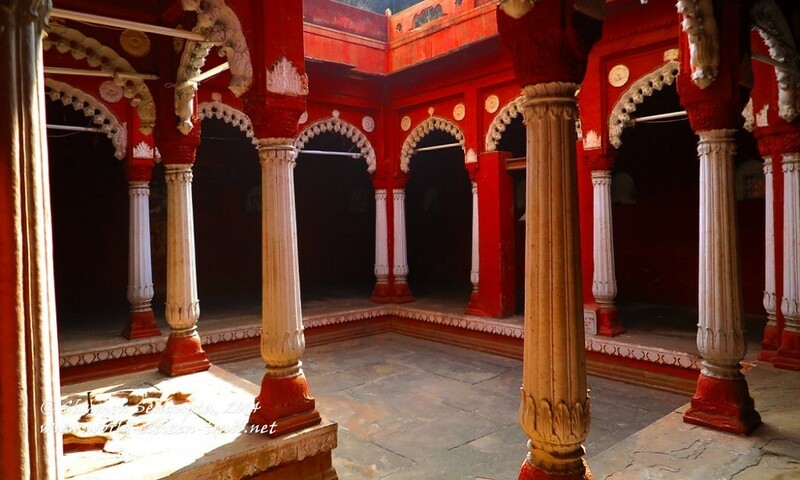 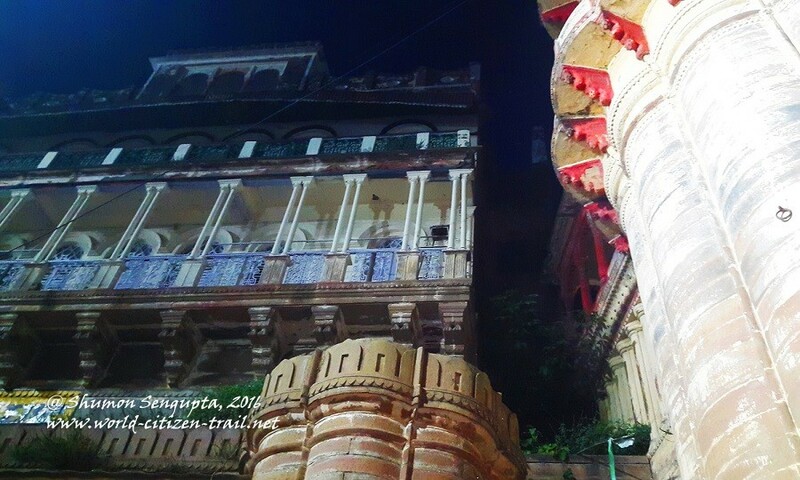 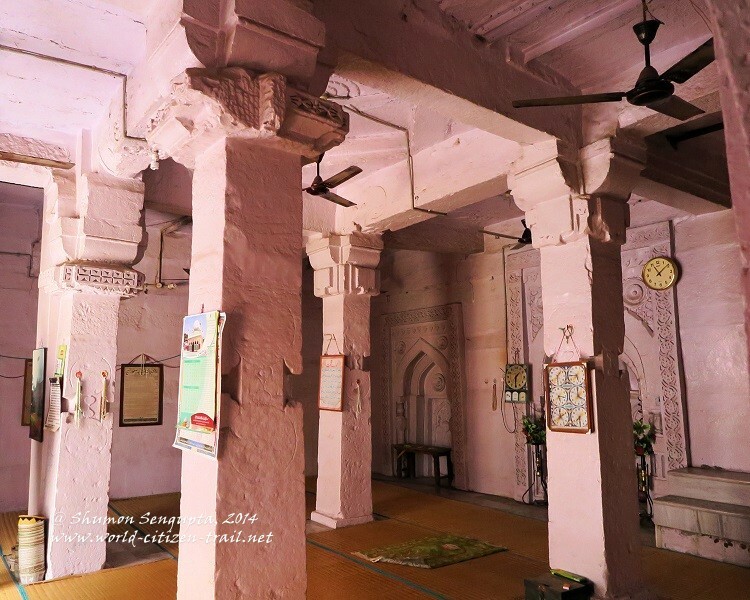 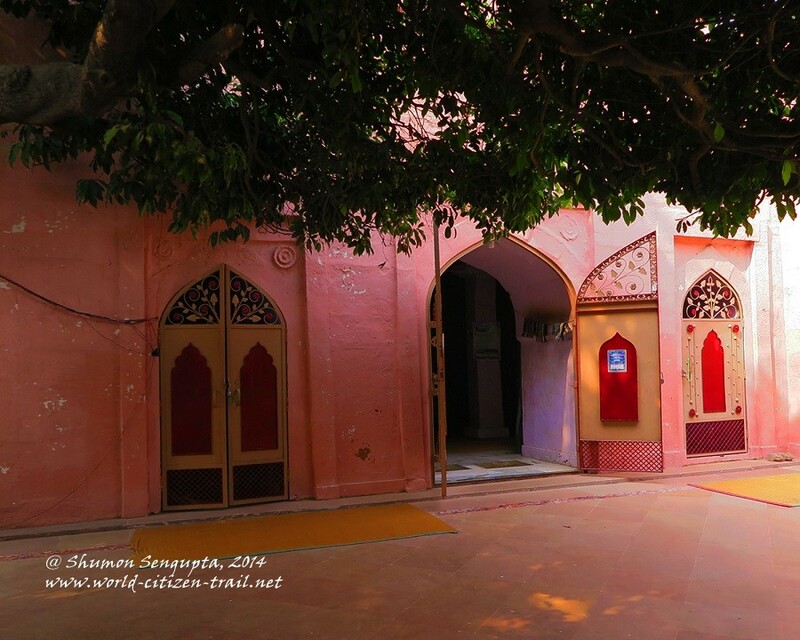 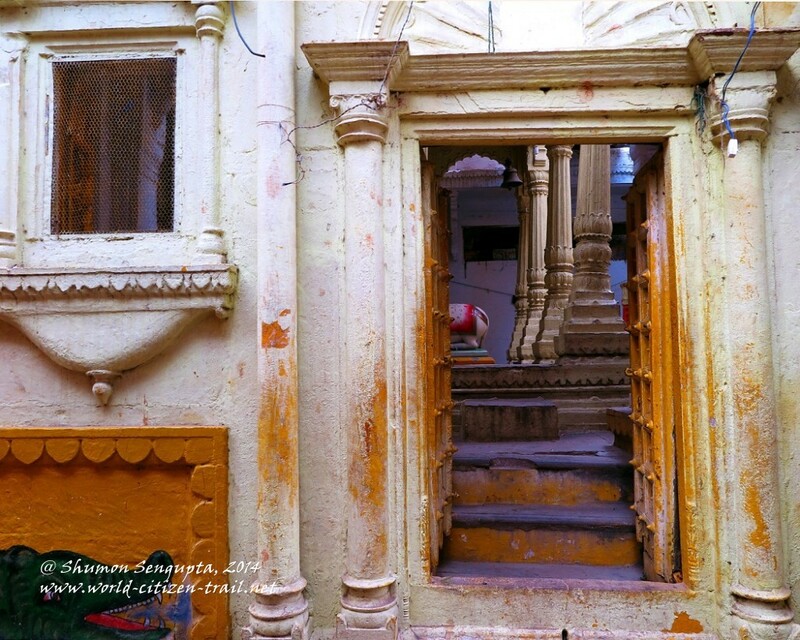 The serene and atmospheric Razia Sultana mosque, situated on a high terrace across the street from the Kashi Vishwanath temple was built sometime around 1236-1240, almost entirely with carved pillars from a demolished Hindu temple. 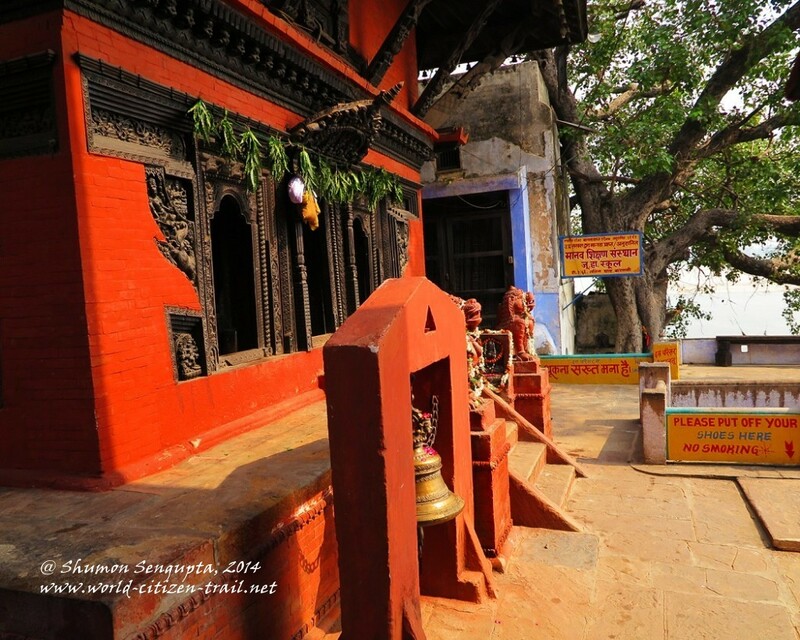 The magnificent 11th century Bindu Madhav temple on the Panchaganga ghat was rebuilt after it was first destroyed in the 16th century. 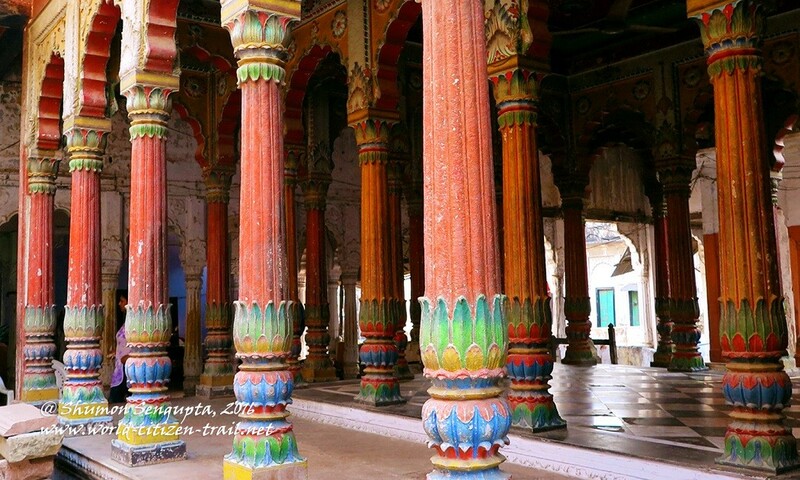 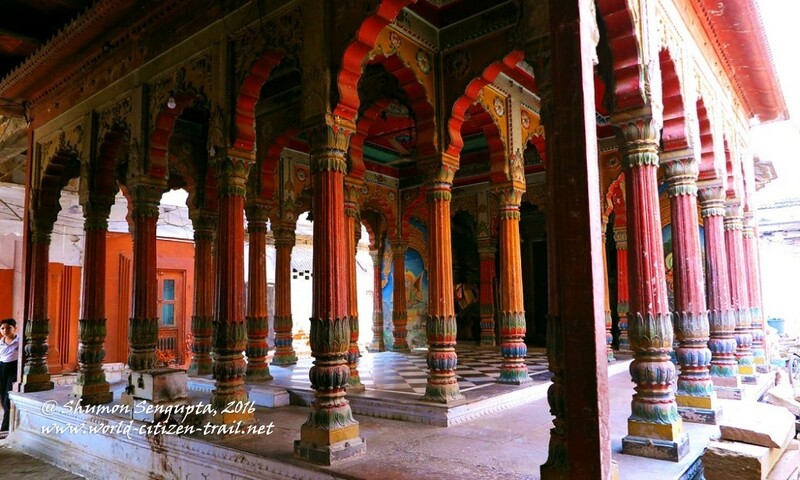 It was again destroyed in the 17th century and replaced by the imposing Alamgir Mosque by Mughal emperor Aurangzeb. 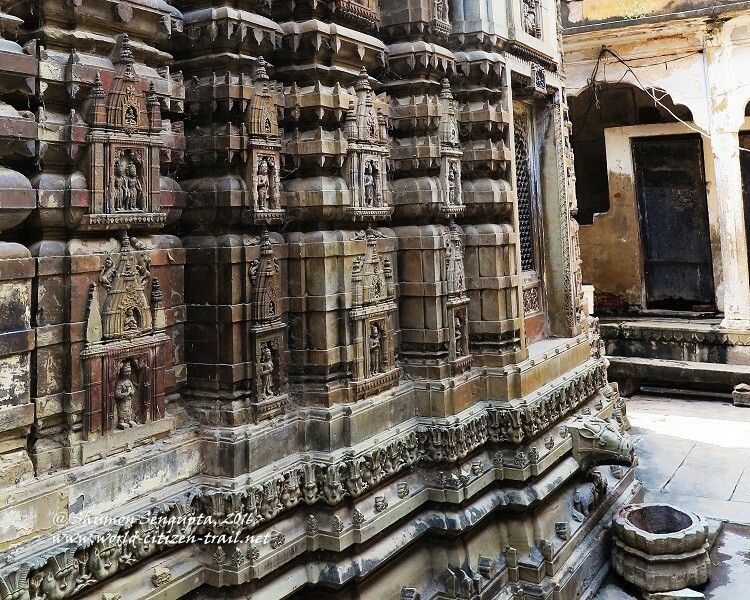 The Kashi Vishwanath temple was destroyed twice (by Qutb-ud-din Aibak in the 12th century and Iltutmish in the 13th century) to be rebuilt by Hindus, each time. 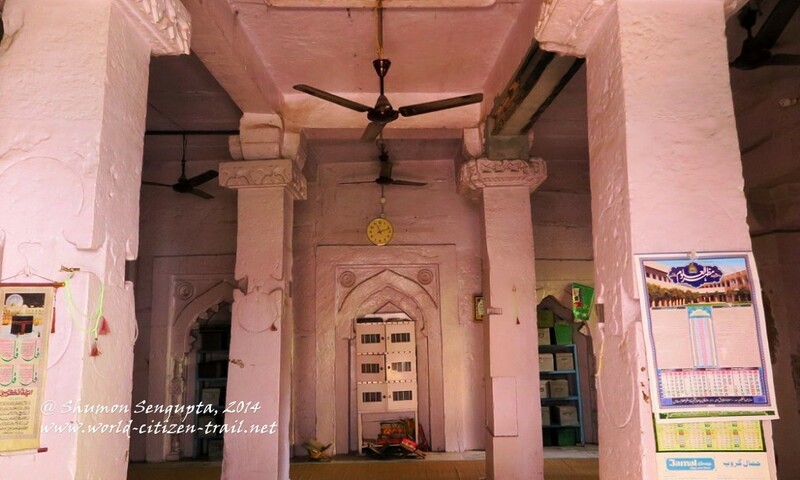 It was destroyed the third time by Aurangzeb, in 1669, and replaced with what is today known as the Gyanvapi mosque. 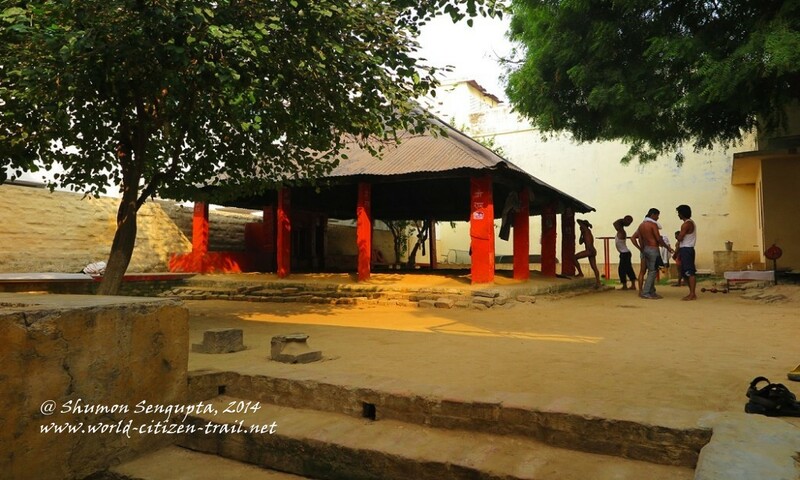 The remains of the erstwhile temple can be seen in the foundation, the columns and at the rear part of the mosque. 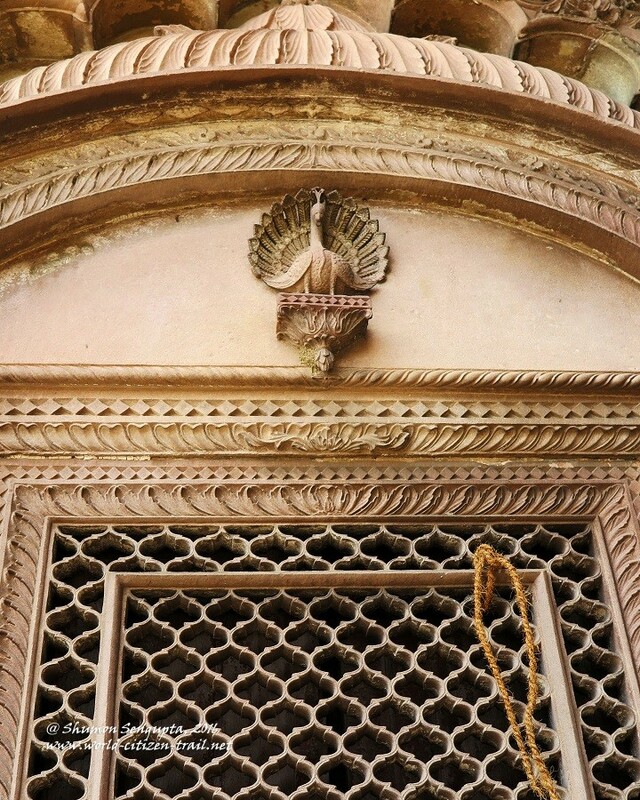 However, in between, during the liberal rule of Mughal emperor, Akbar the Great (1556-1605), there was an active phase of rebuilding, repairing and reconstruction of temples and ghats, led by two senior Rajput Hindu ministers of Akbar’s court, namely Maan Singh and Todarmal. 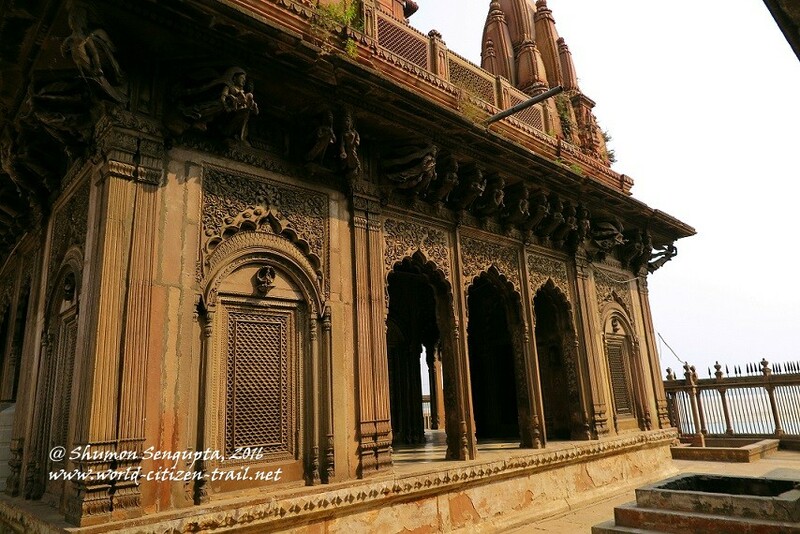 That was however once again followed by repeated waves of large scale destruction by Akbar’s successors, namely Shahjahan and Aurangzeb, as mentioned earlier. 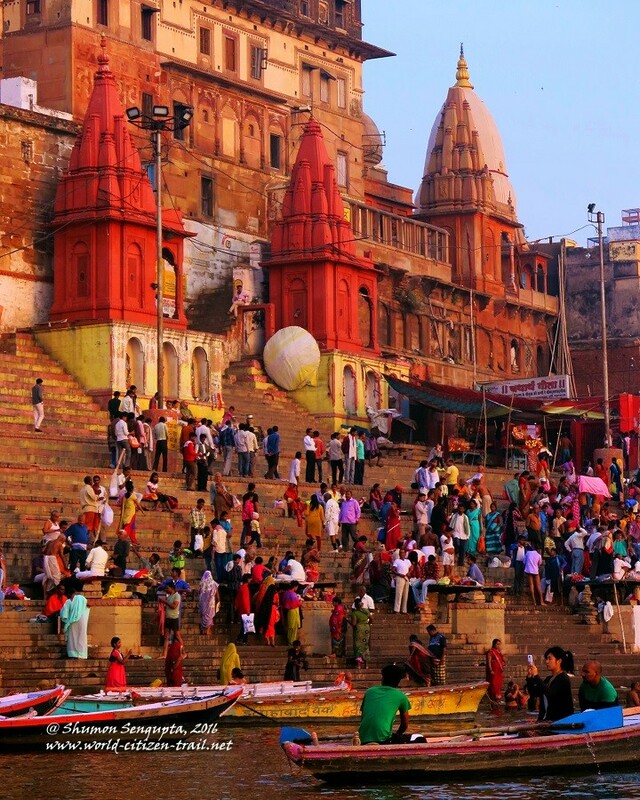 In the 18th century, Varanasi’s fortunes changed once again and it witnessed a renewed and dramatic phase of regeneration and revitalization under the patronage of the Maratha rulers (from western India). 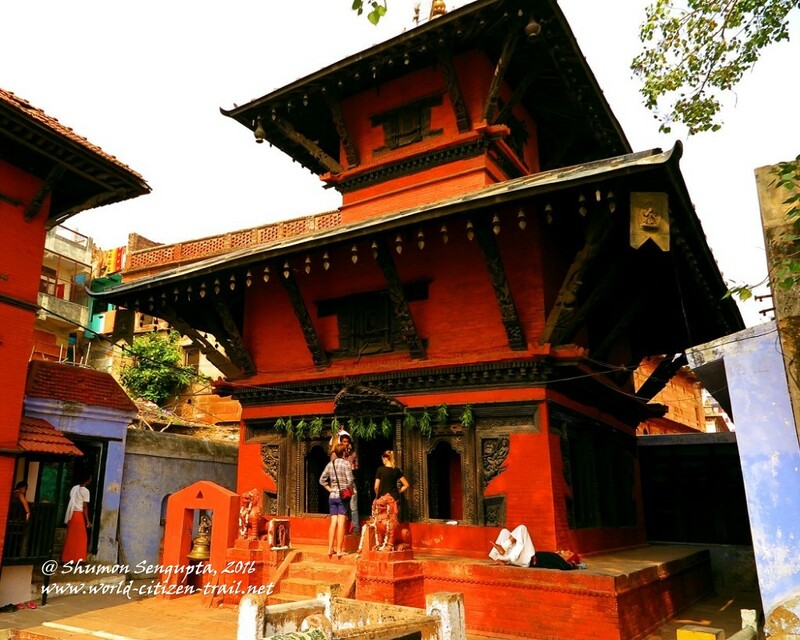 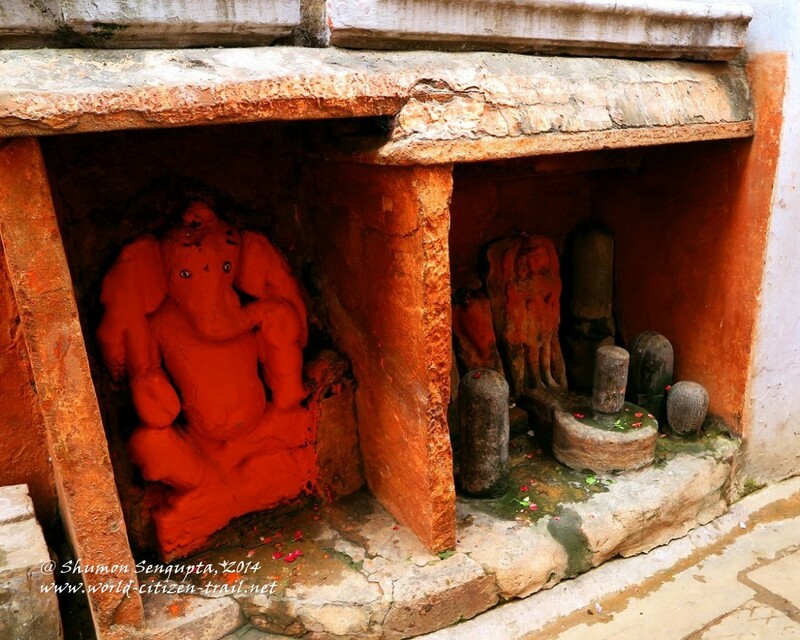 A large number of ghats, water tanks and temples, including the prominent temples of Trilochana, Annapurna, Sakshi Vinayaka and Kala Bhairava were built during this period. 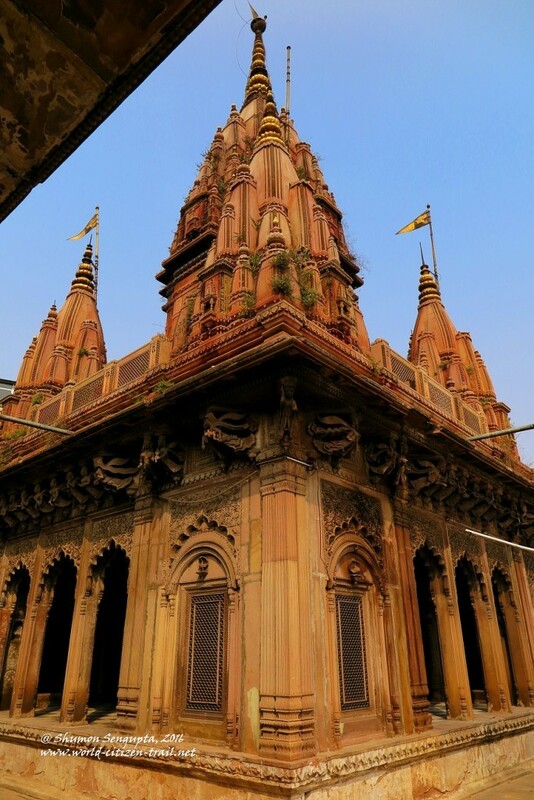 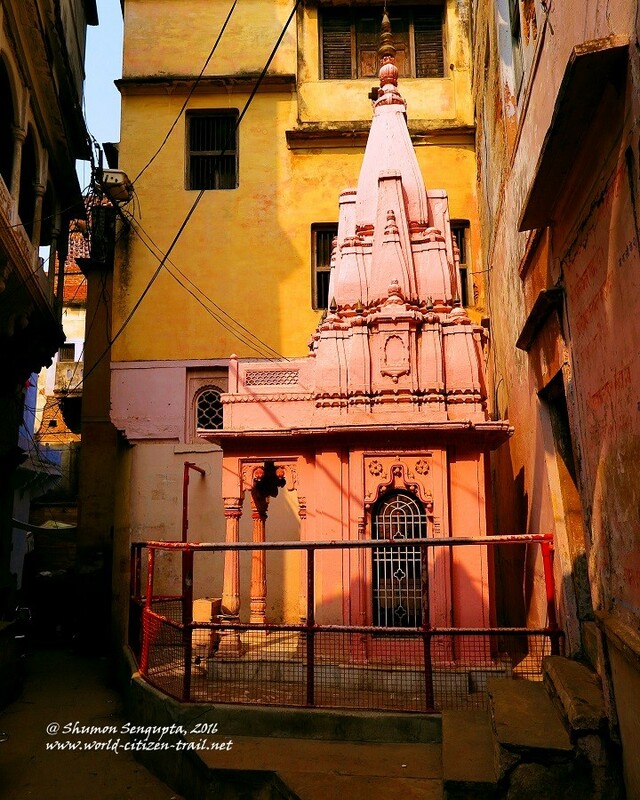 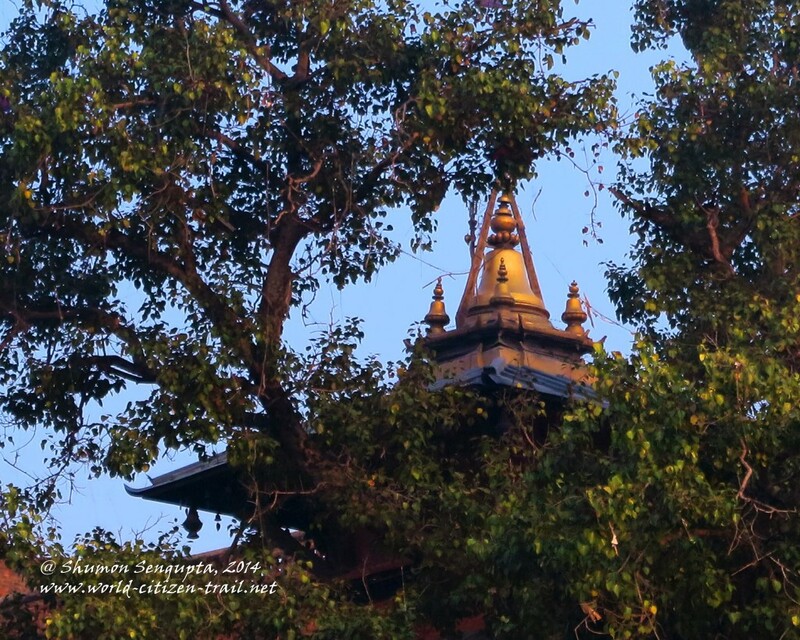 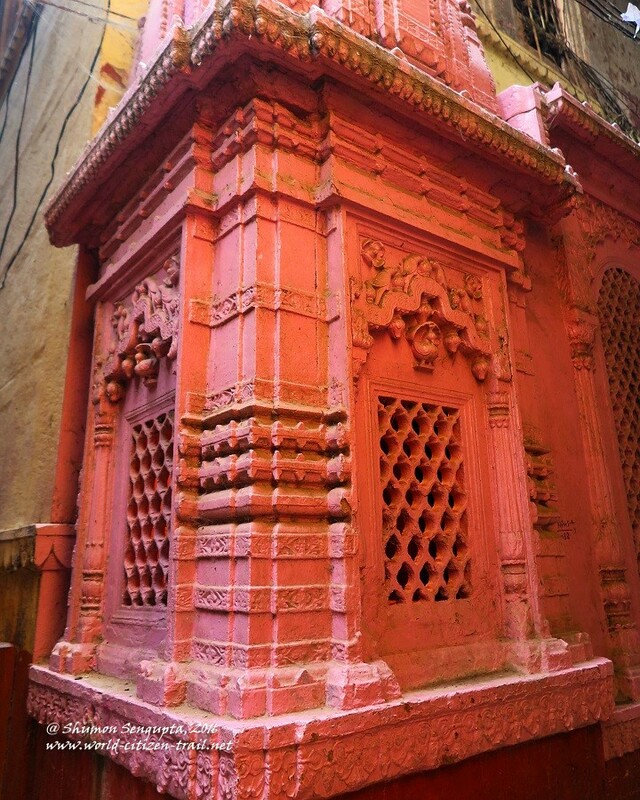 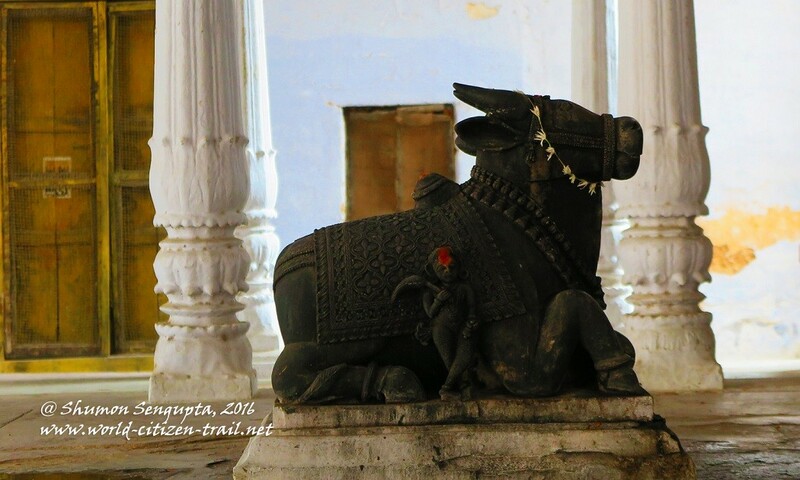 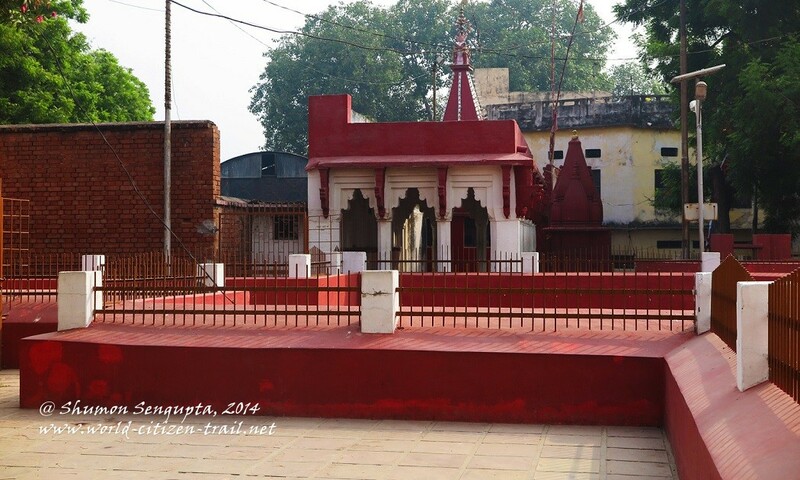 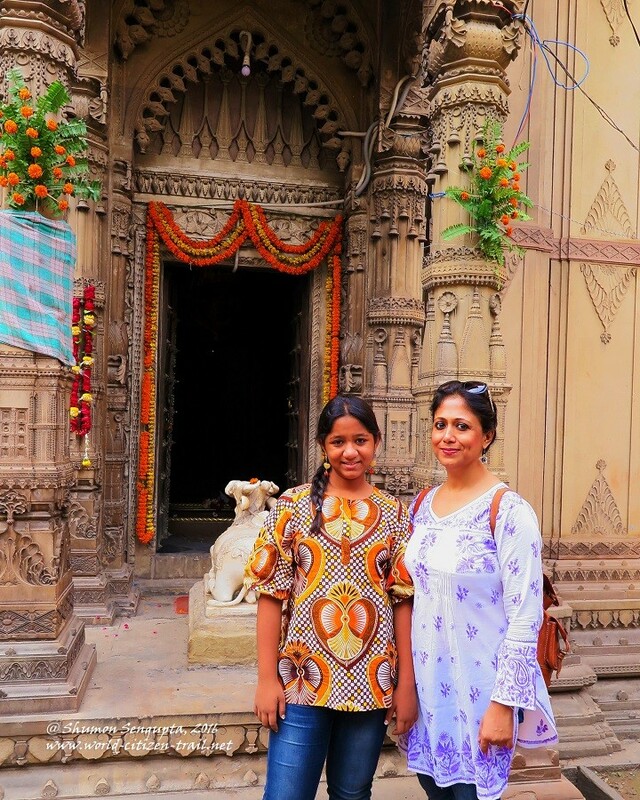 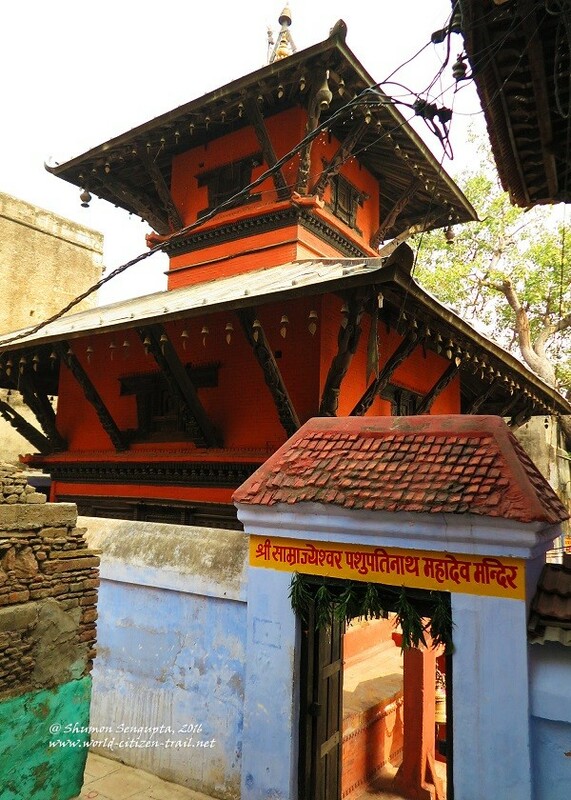 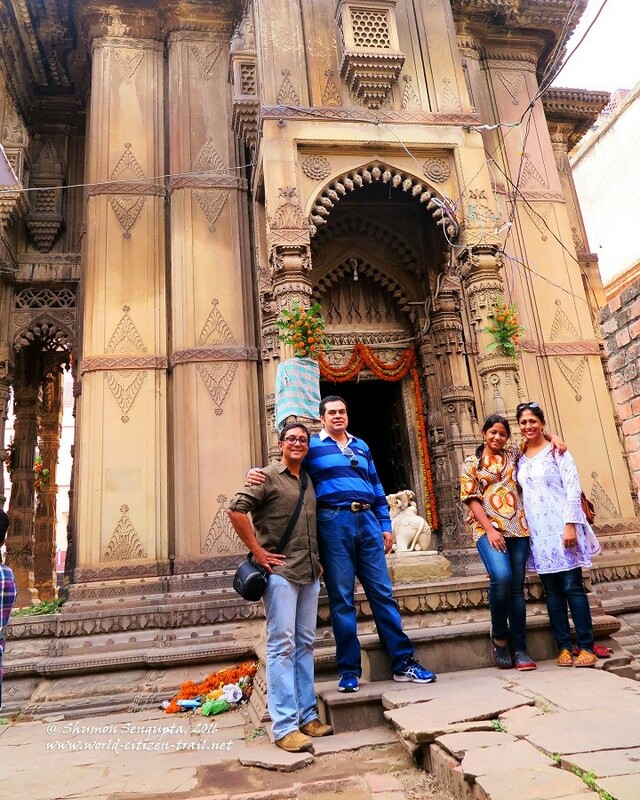 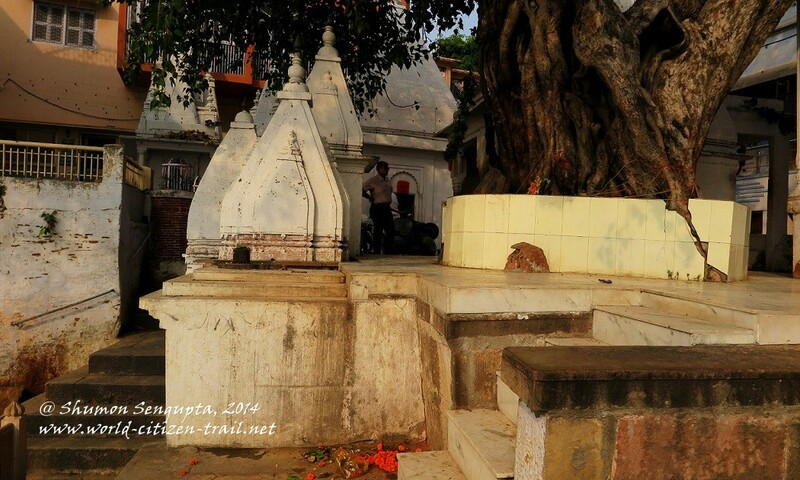 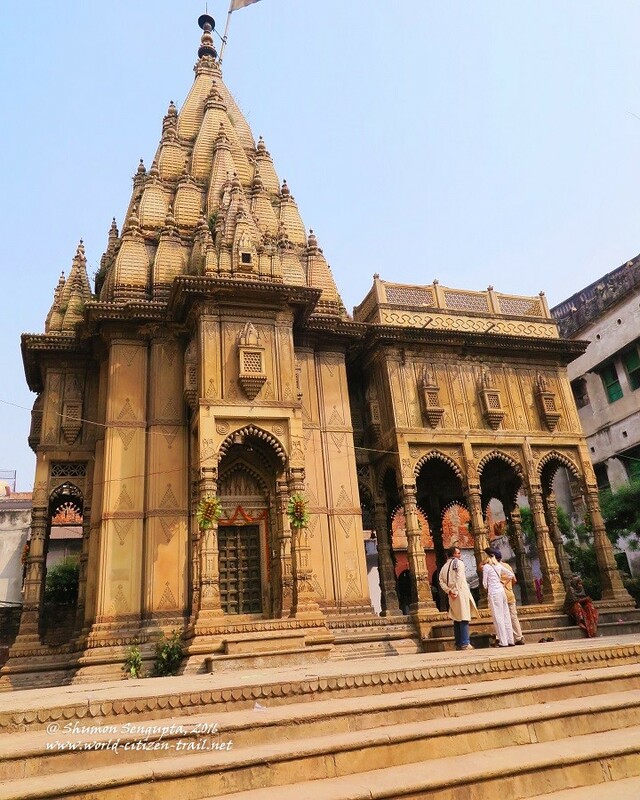 The Kashi Vishwanath temple that we find today, was built on a site adjacent to the original temple, by Rani Ahilyabai Holkar of Indore (under the Maratha confederacy), in 1775-76. 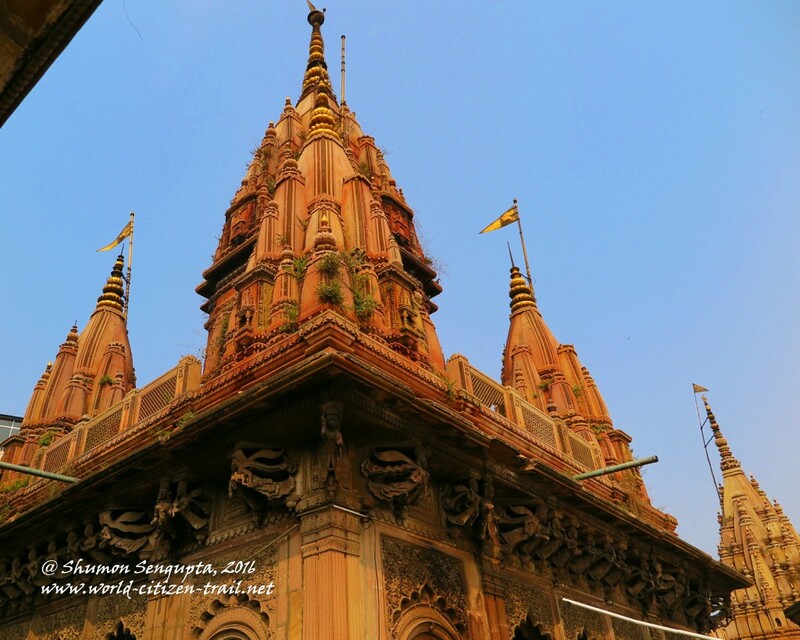 Subsequently, in 1841, the Bhosales of Nagpur donated substantial quantities of silver, followed by the builder of the Sikh empire, Maharaja Ranjit Singh of Punjab donating a large quantity of gold for plating the dome of the temple in 1841. 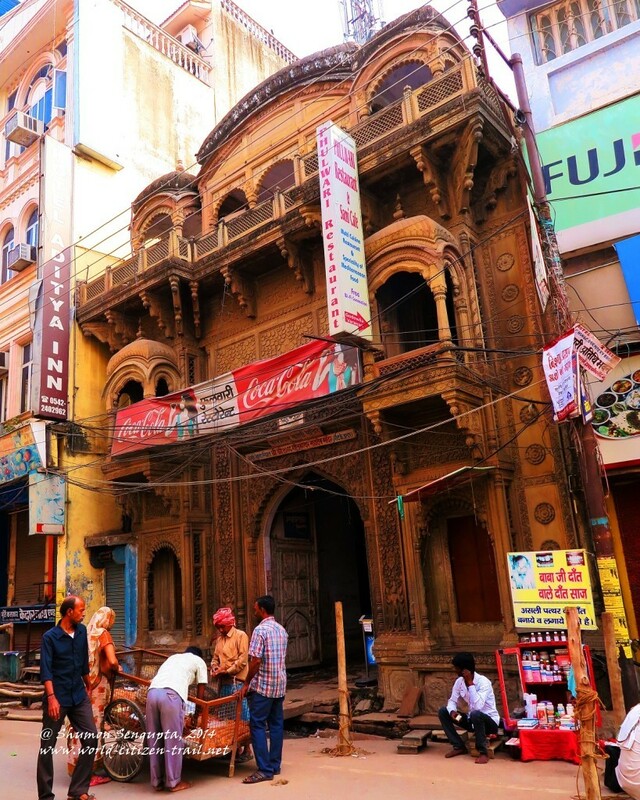 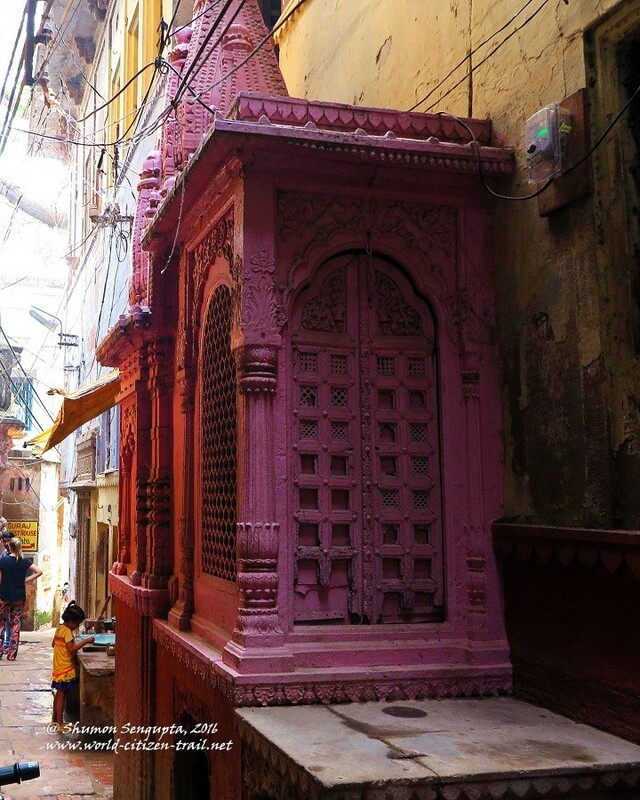 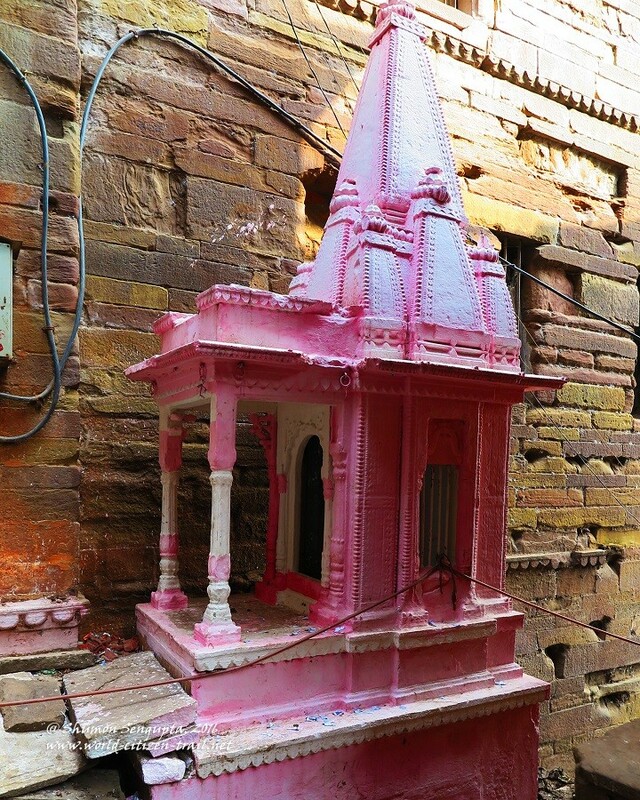 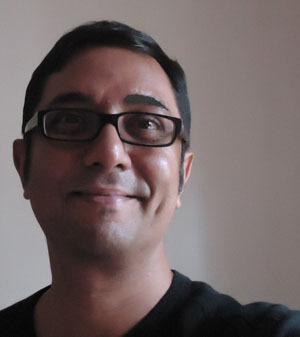 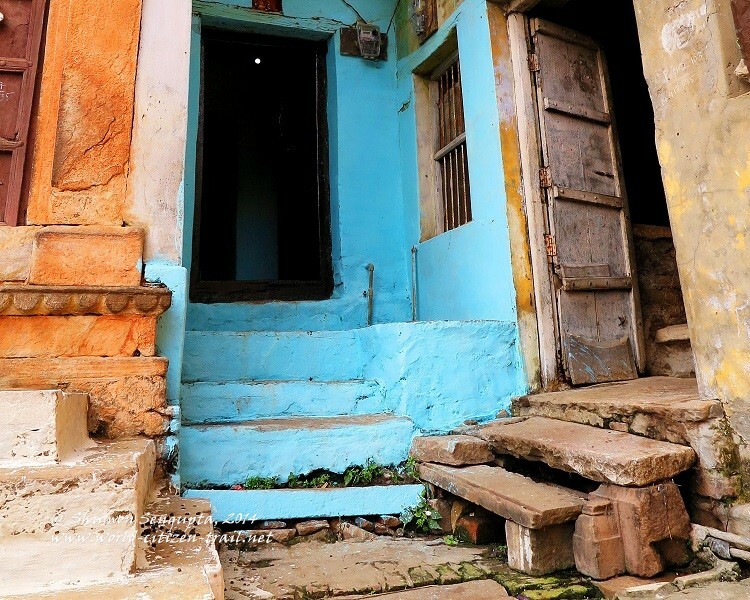 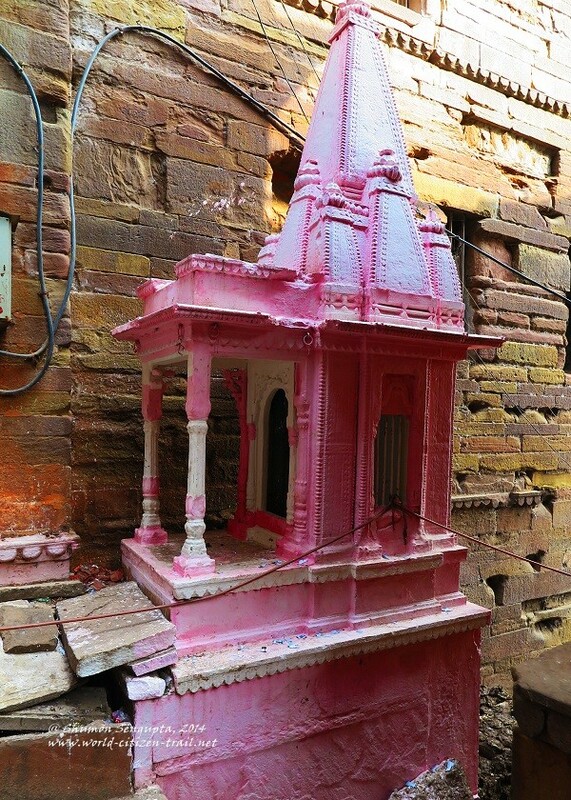 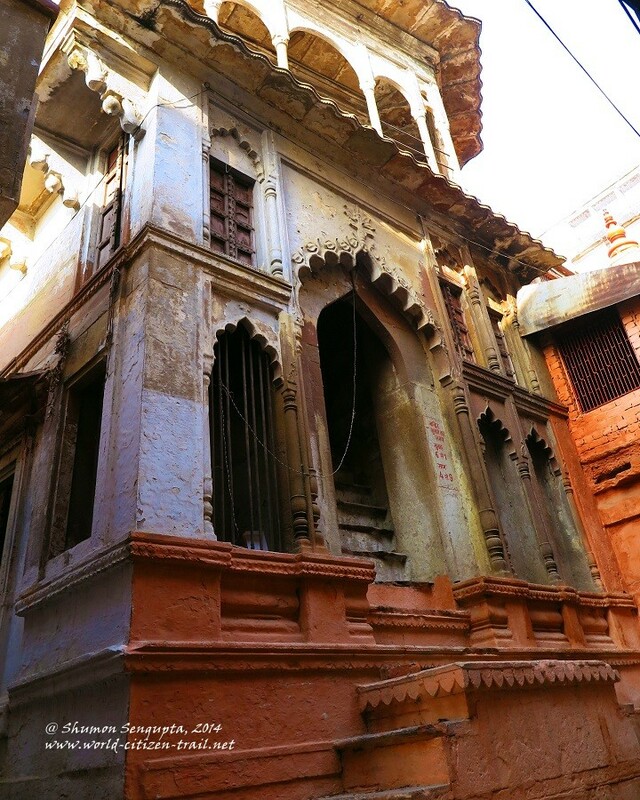 To the detached but mindful observer, the cycle of destruction and rebuilding and the resultant historical layering of Hindu and Muslim architecture in Varanasi provides a fascinating narrative of cultural evolution and diversity in north India. 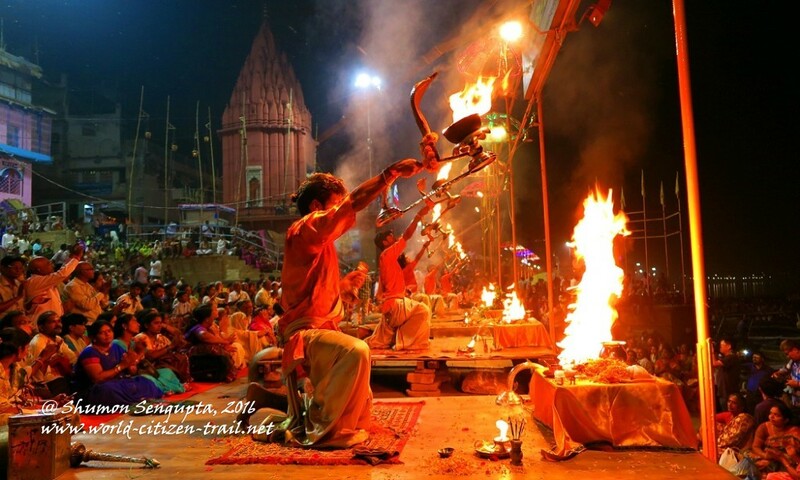 It is also a testimony to the remarkable openness, resilience and inherent strength of Hinduism and Hindu culture. 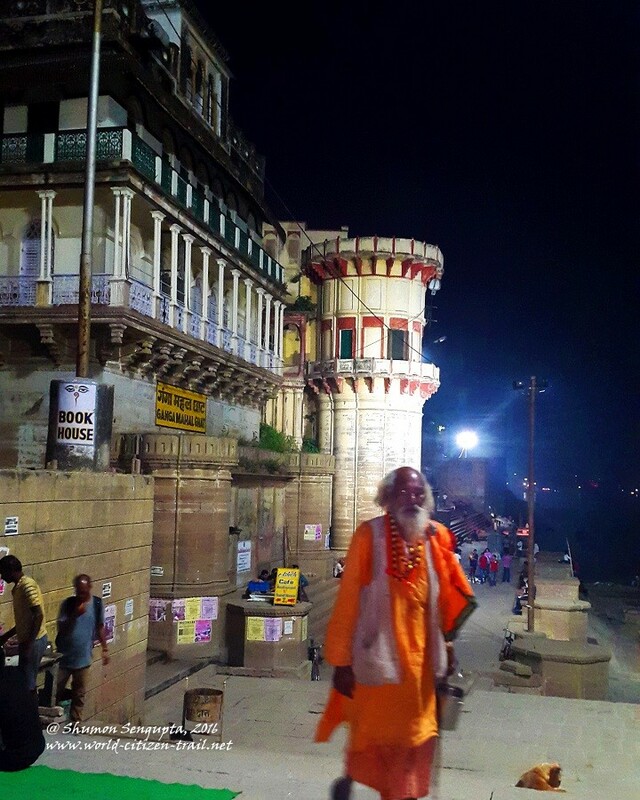 Despite repeated waves of severe and large scale assaults lasting through a millennium, Hinduism has survived, evolved, reinvented and rejuvenated itself again and again, more so in Varanasi, than anywhere else. 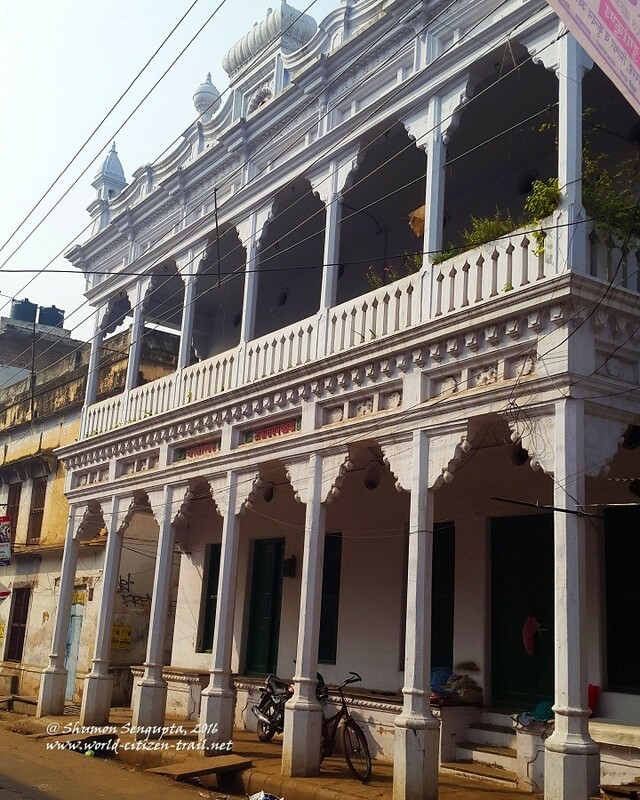 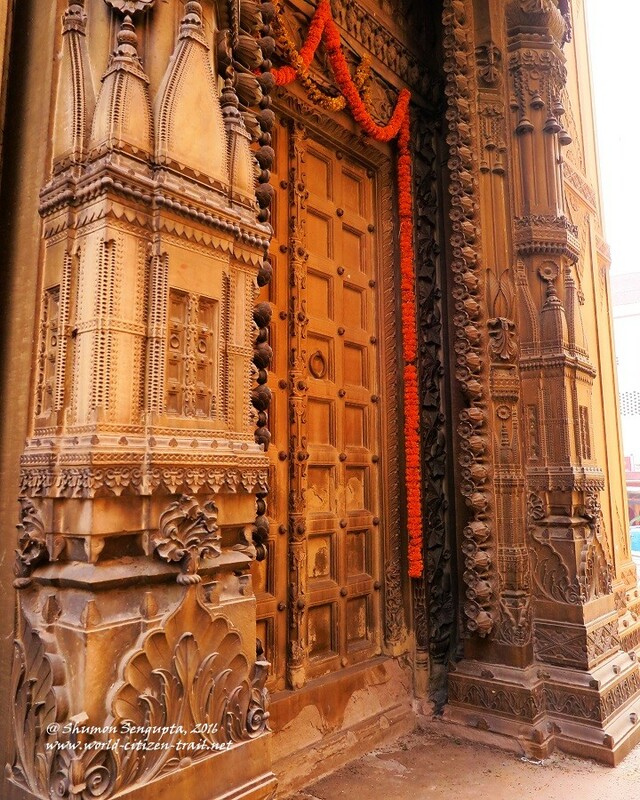 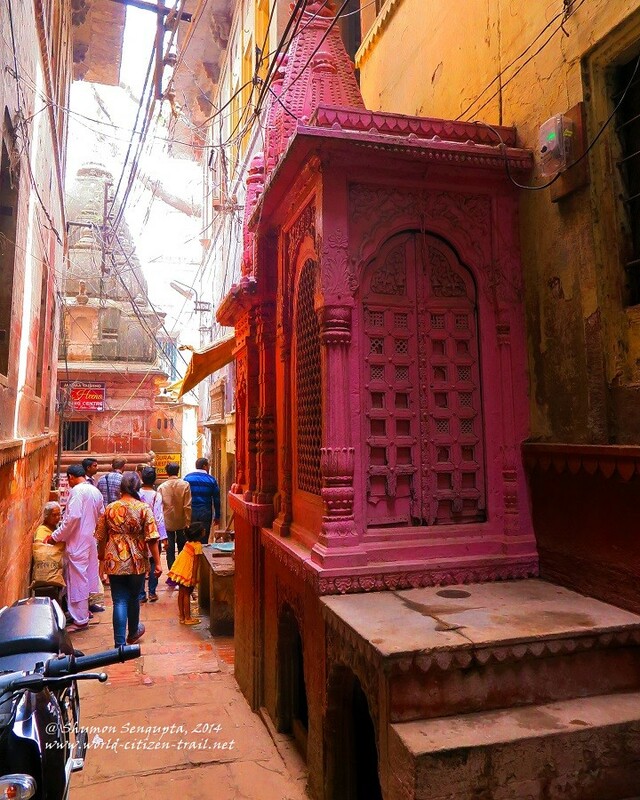 The complex cultural and architectural landscape of Varanasi, and the juxtaposition of Hindu and Muslim religious structures highlight the rich diversity and essential pluralism of Varanasi. 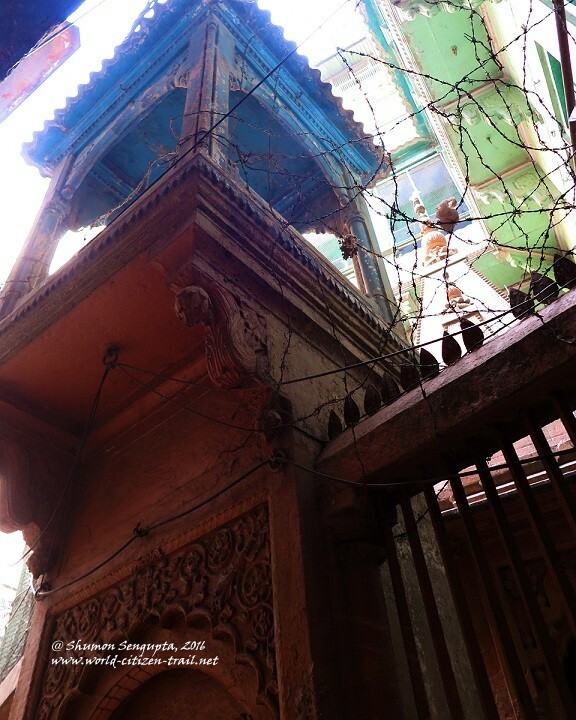 Occasional conflicts apart, residents of Varanasi, 20% of whom are Muslims, largely lead an easygoing life, living in peace and mutual interdependence. 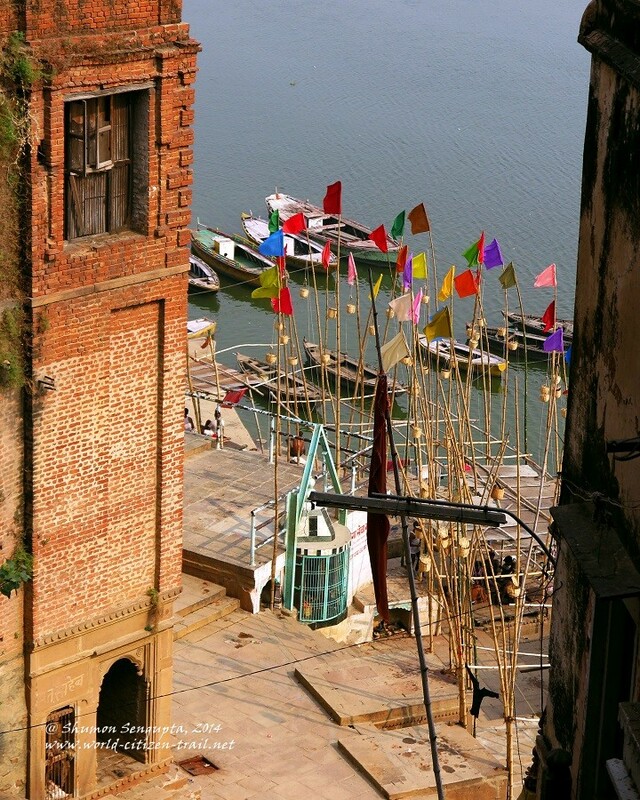 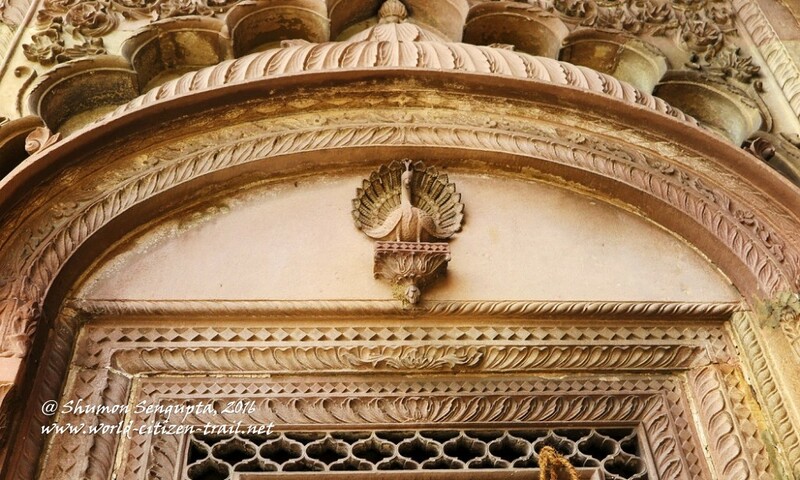 Weaving is the largest industry in Varanasi and 70% of the fabled silk and brocade weavers of Varanasi are Muslims. 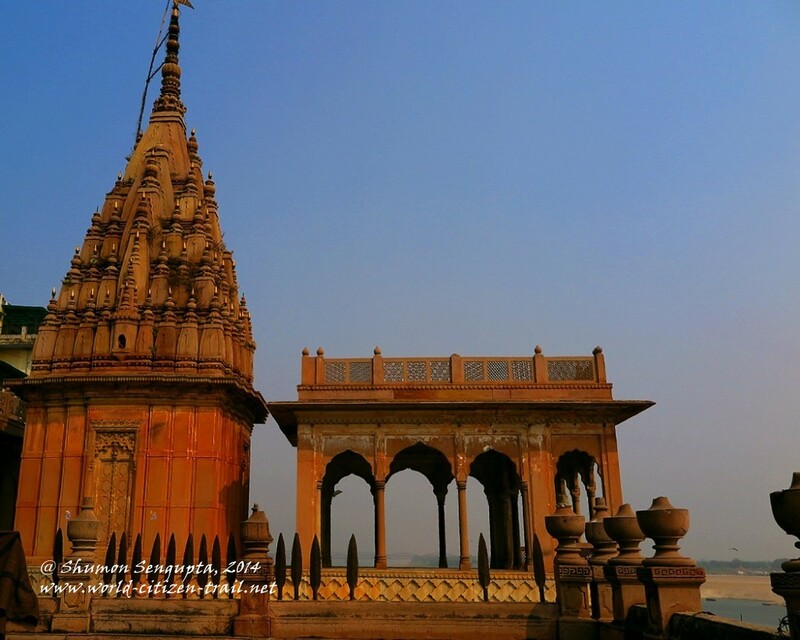 The riverfront and the dense built up area behind it provide a spectacular sight of masonry embankments and platforms, temples and shrines, ornate sky piercing spires, mosques, mansions, palaces and forts. 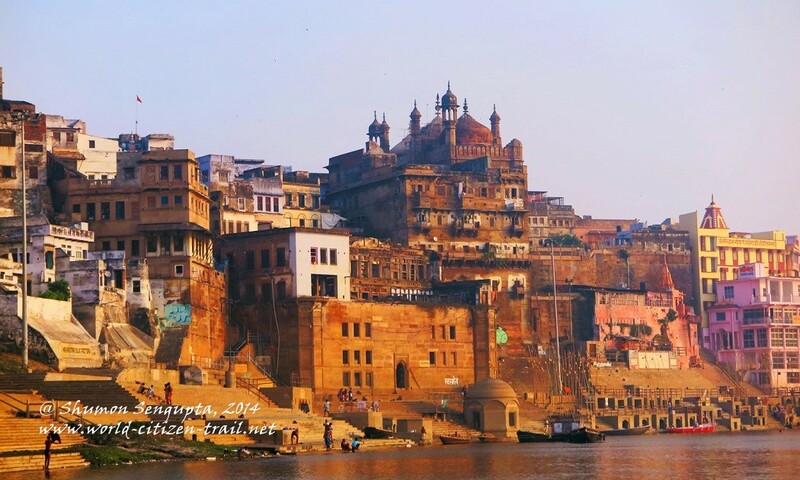 The rich layering of architecture, the beauty and diversity of colors, tones, shapes, textures and forms coupled with the profound beauty of the broad sweep of river Ganges makes Varanasi truly a unique and outstanding site of universal human heritage. 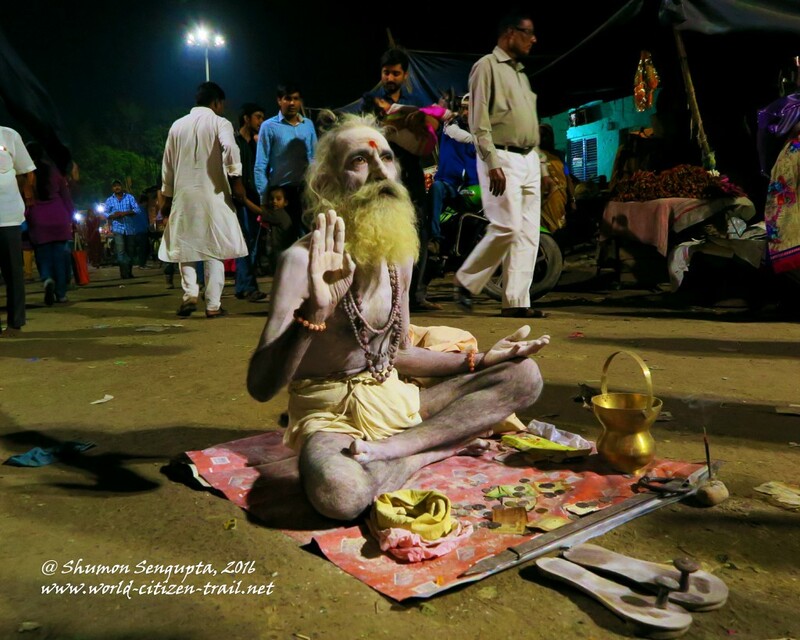 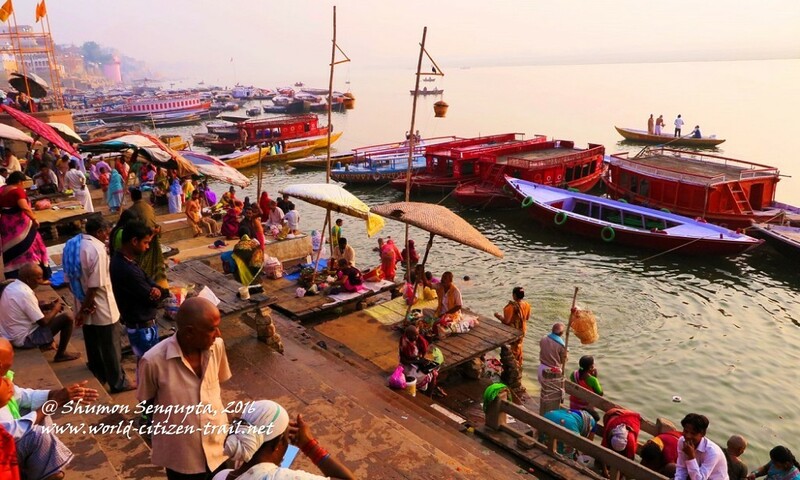 Varanasi is a living, evolving and thriving testament to Hinduism and its tolerant and cumulative culture, from its early beginnings right to the present day. 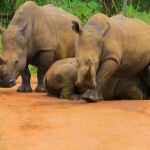 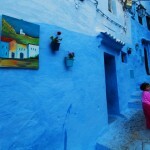 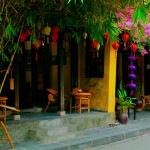 It is also a city where the arts, crafts, music and dance are celebrated. 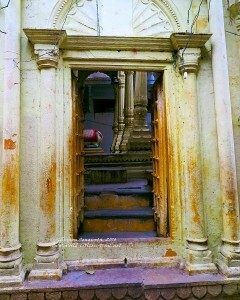 It is place where death is celebrated, as much as life. 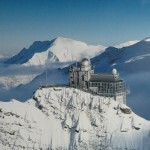 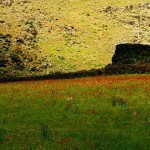 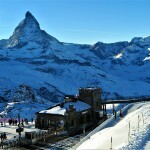 It is a place of unsurpassed splendor, as much as it is a place of dramatic contrasts and contradictions. 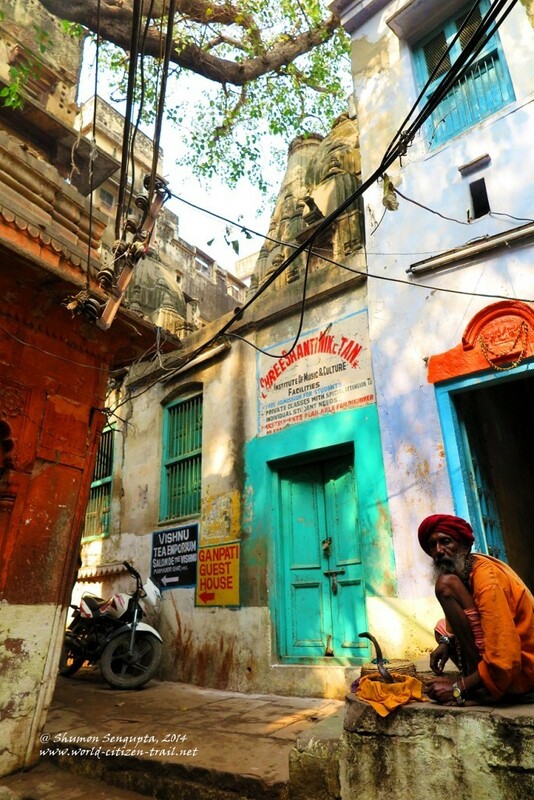 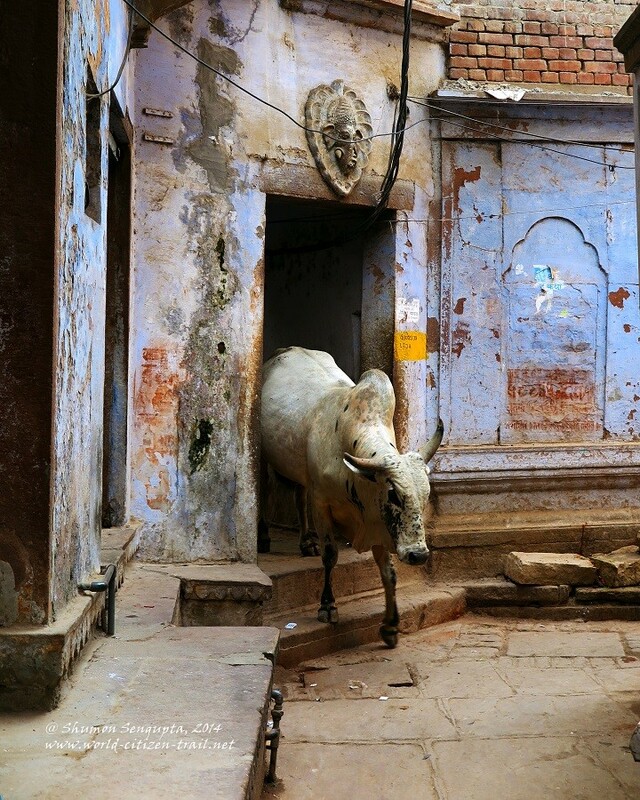 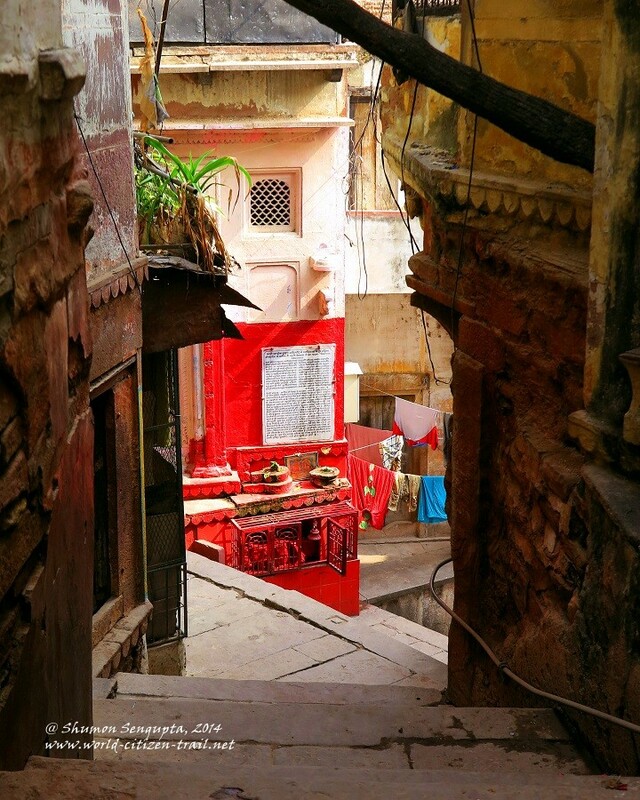 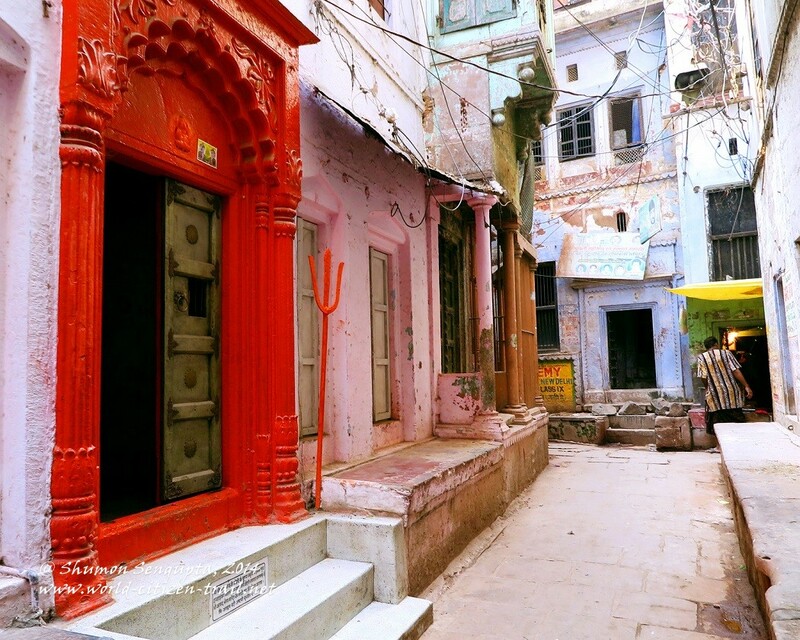 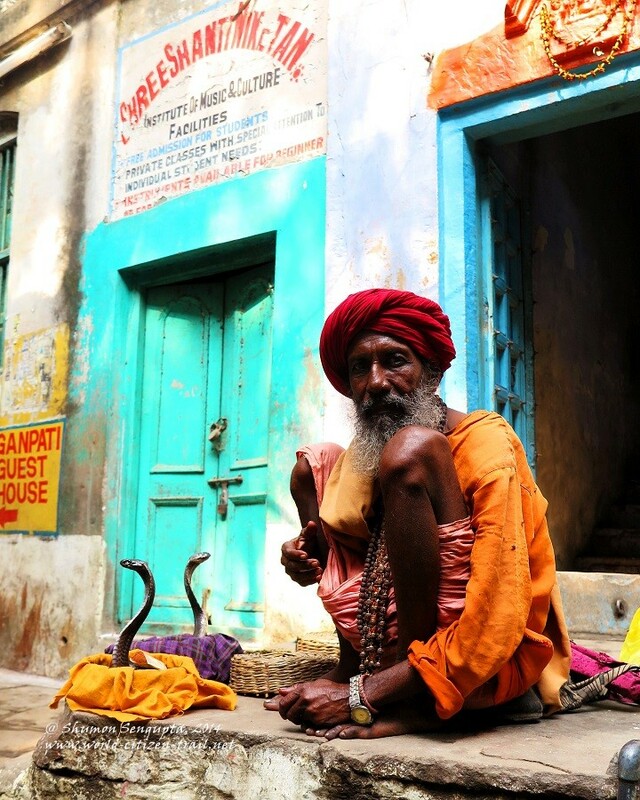 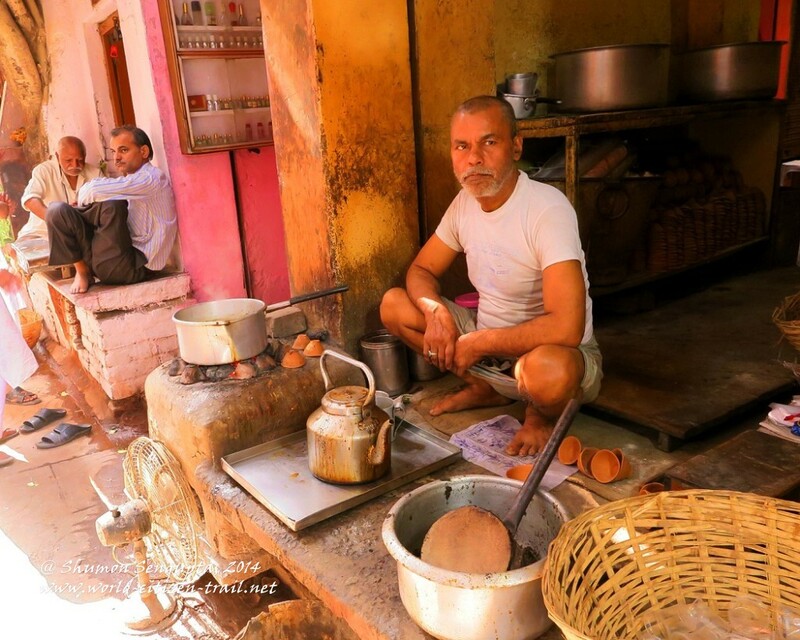 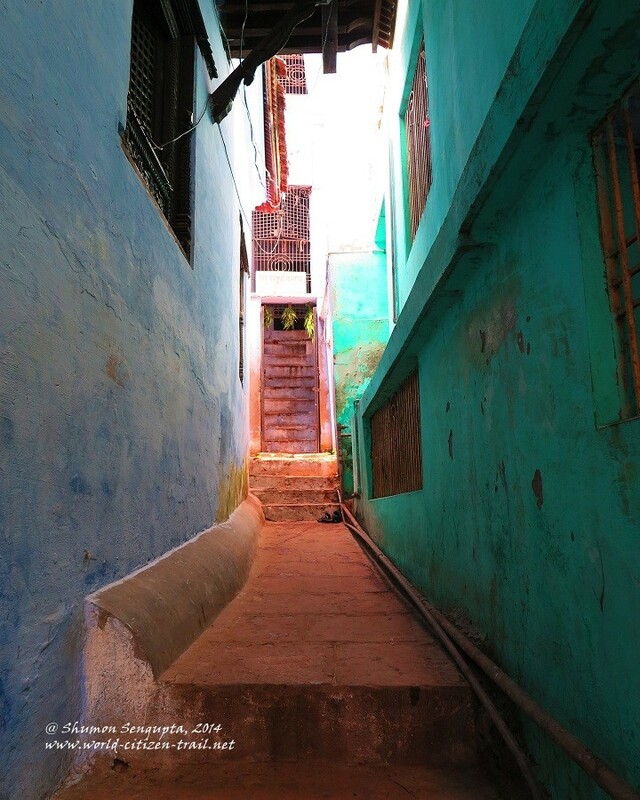 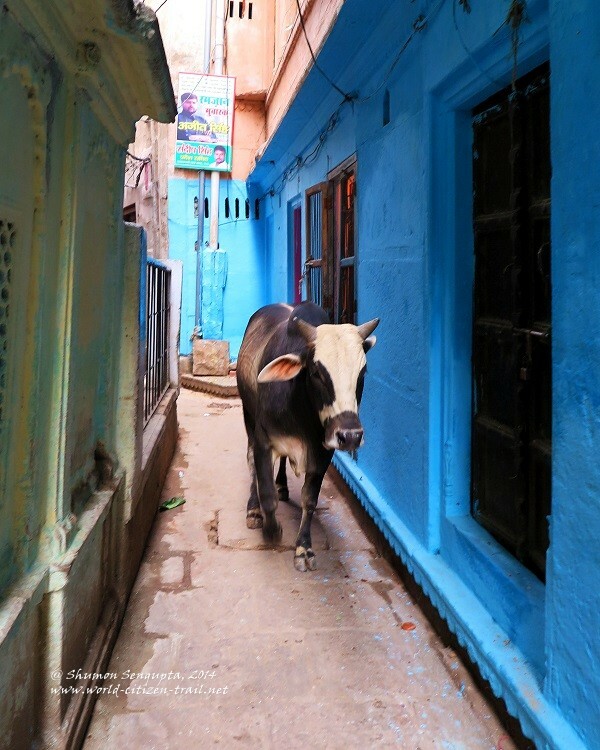 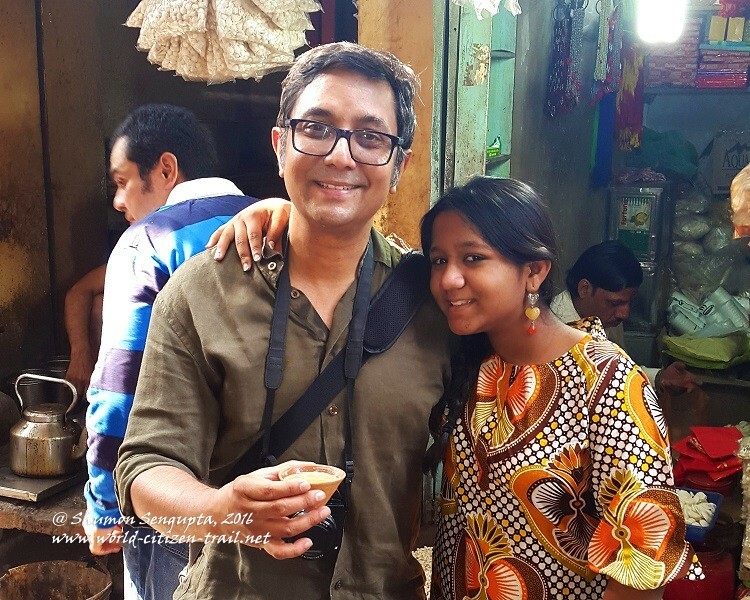 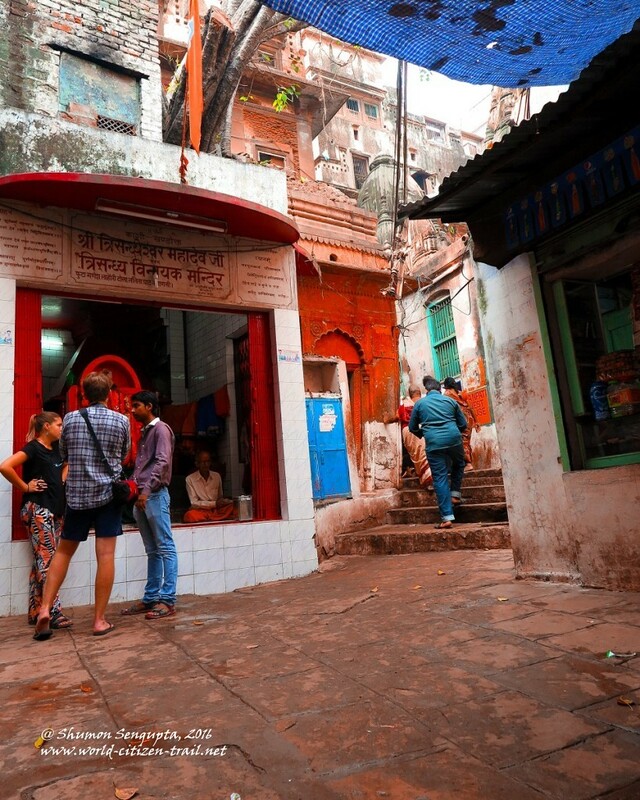 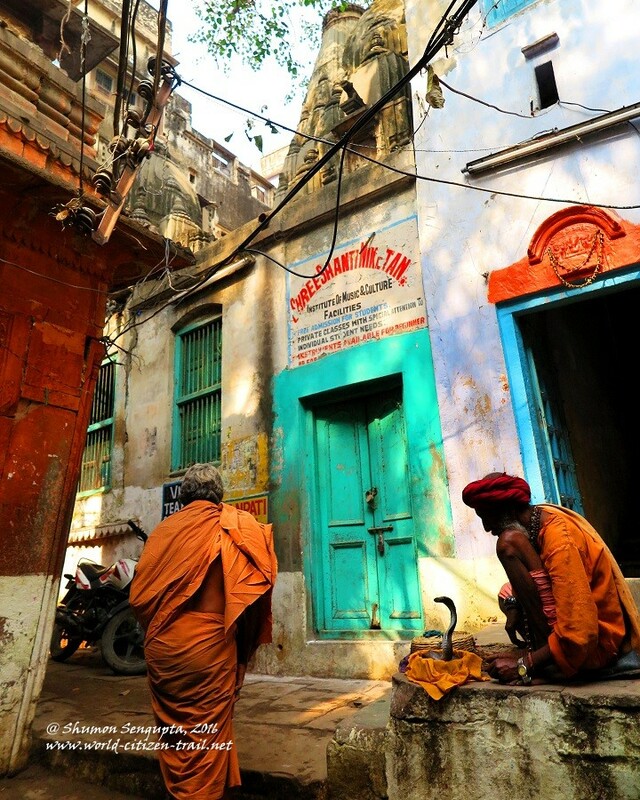 To wander about in Varanasi is to stray back in time, into an undated era – an era that is at once ancient and on the move, where things feel eternal, yet evolving, where change is underpinned and colored by a sense of continuity.